Well, this is the end of our project but definitely not the end of the links and friendships that developed between the participating schools, students and teachers. 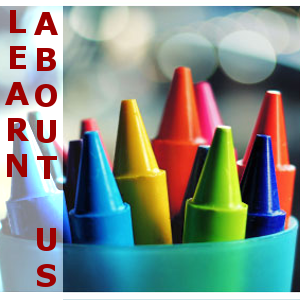 We have done so much together, we have learnt about each others’ countries, cultures and schools. We have discovered beautiful places, tasted amazing cuisines and sang wonderful melodies together. Most importantly, we have worked together on a path set by ourselves to achieve many aims: to improve communication and IT skills, to develop tolerance and to do all these by sharing fun with music. Students, their parents and teachers all agree that we have achieved a lot. We all benefited from the cooperation. It helped our students realize that nowadays cooperation is a widely appreciated skill in life, in academia, in business and now they can say they have already participated in a project requiring European collaboration. As Bruno, the main coordinator said on the stage in Trebisacce in November, 2012: „This is the beginning of a beautiful friendship!” We hope to keep in touch and learn from each other for years to come. It is a video collecting our feelings about everything we had learned during the last two years. Some of the teachers and students have been asked the same questions in an interview. All the interviews have been recorded and collected. They have been put together into an impressive film by the Turkish team. 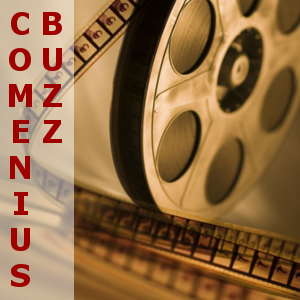 You can watch the film by clicking the Results section and then the icon “Comenius Buzz”. Together with the Travelling Suitcase, we sent a diary. 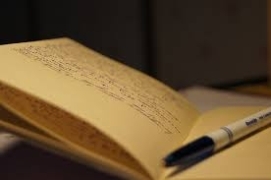 The diary is a collection of our thoughts and impressions on what we had received and learned about the other countries through the objects we had found in the Travelling Suitcase. After all the pages had been filled, the Hungarian team scanned them and made it possible for the others to read it. 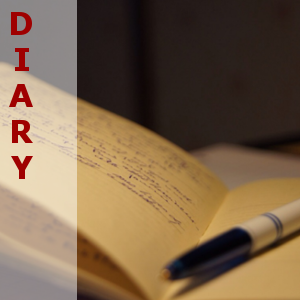 You can find the diary in the Results section. Have fun reading it! 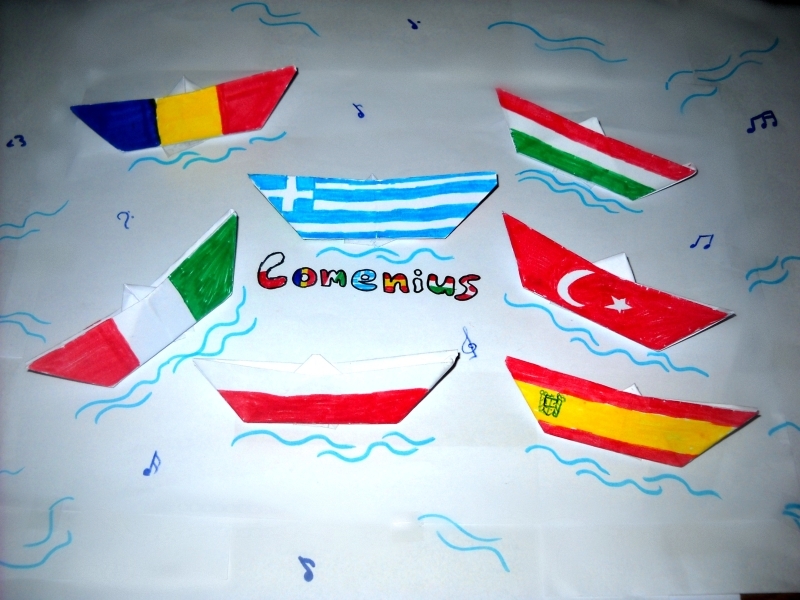 In all the meetings, every student could write their feelings and impressions connected with the project on a piece of paper that was created by the Romanian team and was supposed to be a part of our Comenius echoes booklet. 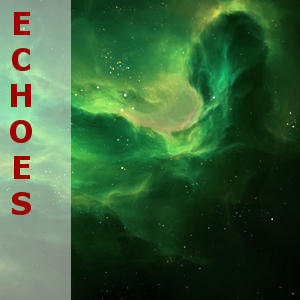 Now, when it’s finally put together, you can explore it in our results section under the icon “Comenius Echoes”. Since our project started we have been working on our WIKI, where each of the teams shared information about music, the bands and the musicians most popular in their countries in the subsequent decades. When our wiki has been completed, the Italian team has created a CD containing the greatest hits from every country and every decade. 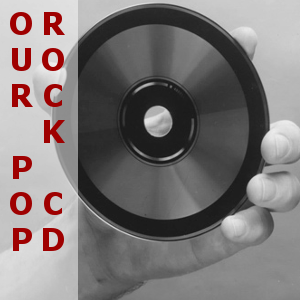 You can listen to the songs that have been chosen on our website under the icon “Our Pop Rock Greatest Hits CD”. 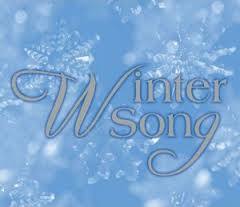 During the second year of the Comenius project each country was responsible for learning and recording a winter and a spring song from a depicted country. 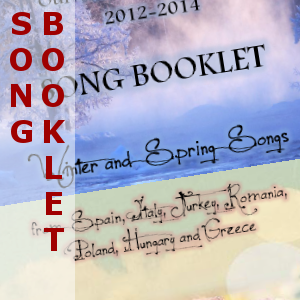 After all the songs had been recorded, the Hungarian team put them all together into a beautiful booklet, which you can find in our results section under the icon songs. Have fun singing along with all the teams! 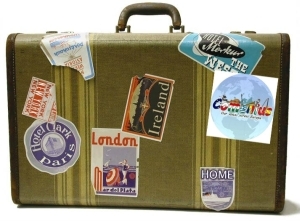 “The Travelling Suitcase” has finally reached its destination after having visited all the partner countries. During our last meeting in Greece, we opened the Travelling Suitcase together so that we could learn a lot about everything what was inside it. 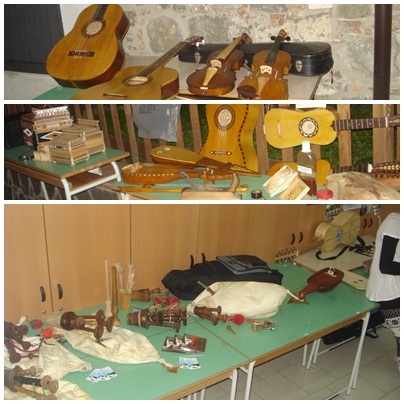 The students from the partner countries who came to Arta presented the objects from inside the suitcase through explanations and performances on the instruments. Finally, each country took the contents from the other partner chosen in a draw. Our final meeting in Greece has come to an end. 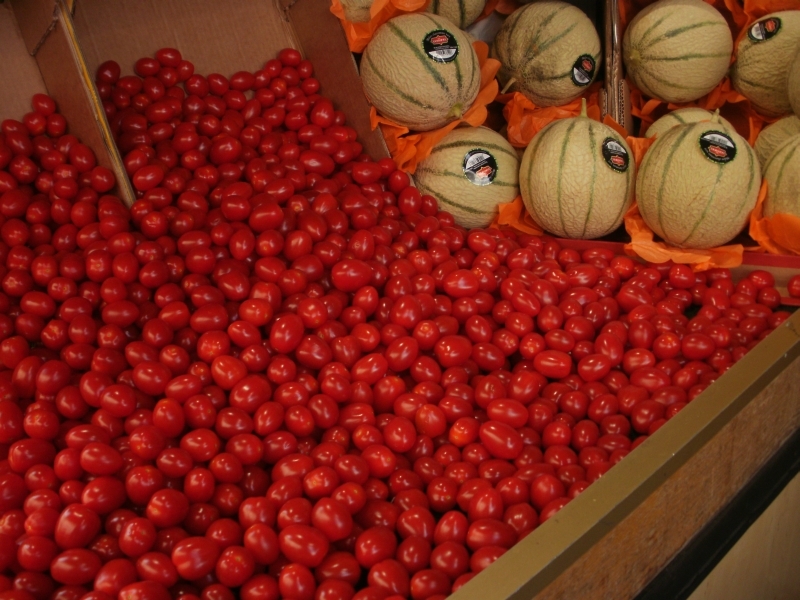 Last week, from 4th to 9th May, we spent 5 unforgettable days in a beautiful city of Arta. It was a great adventure, not only for the ones who haven’t been there before, but for all the Comenius Team. There was no a single person that wasn’t surprised by something since the meeting was FULL OF SURPRISES! Greek team taught us a few traditional dances, and made music accompany us everywhere we went, was it a busy street, a beach, a church, or a schoolgroud. They also made each lunch and dinner a feast for the senses in terms of food, picturesque surroundings, friendly atmosphere and lively people. 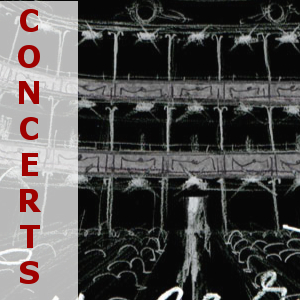 The final concert performed by the students from 7 different countries in 7 different languages was the one which helped us understand that nothing else but the MUSIC opens our hearts and souls and lets us get to know oneselves and the others better. 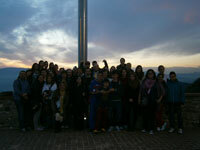 The last Comenius meeting was certainly of high standard and one we will remember and talk about for a long time to go. Getting ready for the 7th meeting in Arta, Greece. 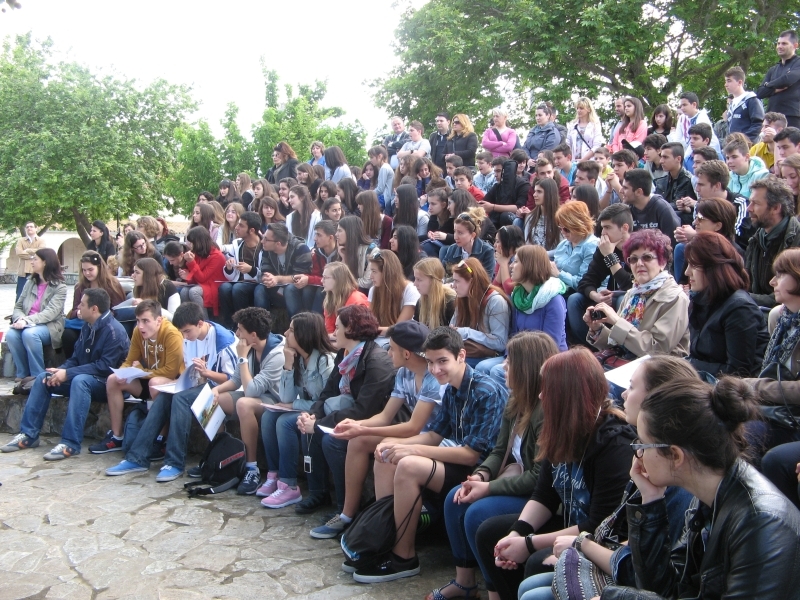 The 7th and, at the same time, last Comenius meeting will take place in Arta from 4th to 9th May 2014. 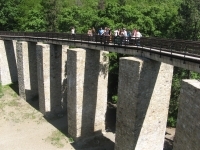 During this meeting we will wander around the town and visit some of the most important Byzantine monuments and the legendary old bridge of Arta. 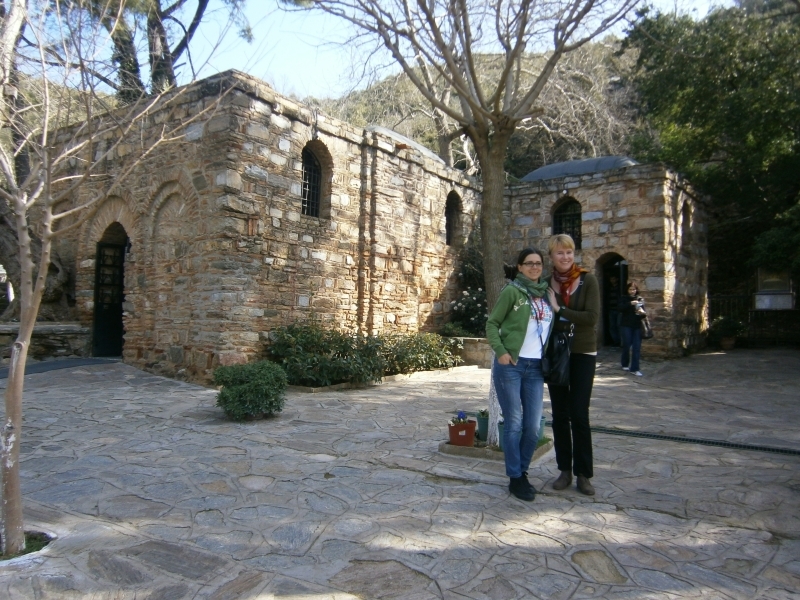 Also, we will have two trips, one in the Golf of Amvrakikos and the other in a picturesque town near the sea. 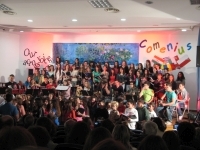 The main aim of the last meeting is to get together in order to prepare the concert, which is the final product of the Comenius program. 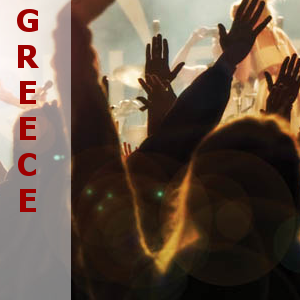 We will also try to give a little taste of Greek music and Greek culture to all the partners. We are looking forward to that great experience. After visiting all the countries, travelling suitcase is about to get to Greece and finish its journey. Since September the suitcase has been to every country and each team had a chance to open it, look inside and put there something connected with dance/music from its own country/region. Now we are all looking forward to opening it in Greece!!! We are all working in our WIKI and now our focus is on pop rock music in the decades from 1990’s to 2000’s both at a local level and in the UK / USA. This time, we will all upload videos and pictures of different groups and singers who were important in each country. Our aims are twofold: we would like our students to feel, understand and appreciate the pop rock music which emerged in the 90’s and 00’s both at a local level and in the UK/USA panorama. 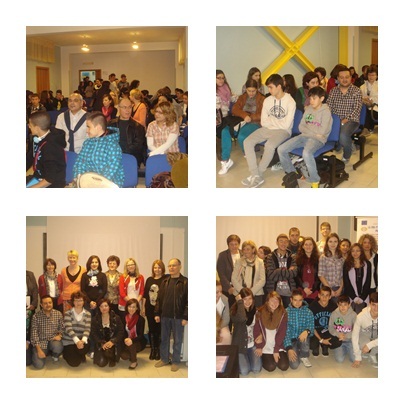 Our students have just come back from another Comenius project meeting. This time our destination was Hungary where we spent 5 unforgettable days. 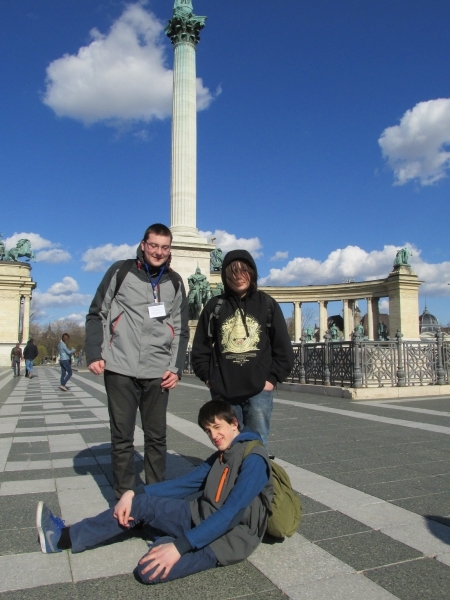 Budapest greeted us with lovely sunshine and splendid architecture and the students and teachers from Szent-Gyorgyi Albert Iskola went to great lengths to keep us busy and satisfied. Apart from taking part in a dance workshop and learning Hungarian songs, we had a chance to visit the Museum of Etnography and the Parliament, we could see the beautiful panorama of the city from the tower of Szent Istvan Basilica and the top of the Gellert Hill, we admired Budapest by night during a river cruise, and we could also sew our own leather wallets and purses. 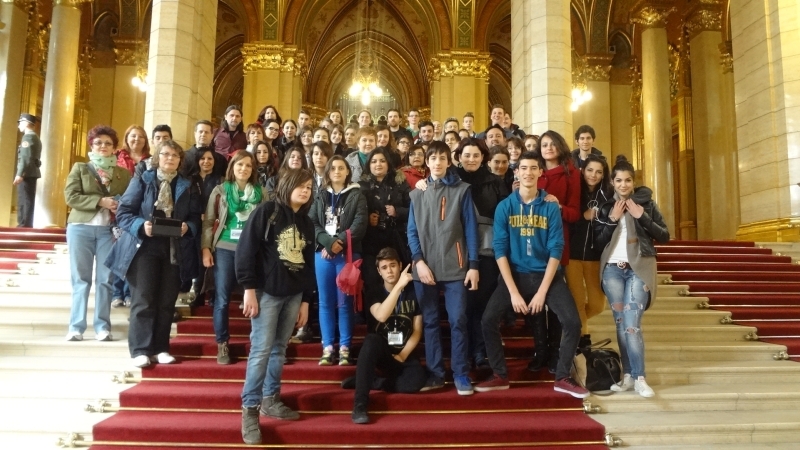 Our hosts showed us a great zoo in Budapest, the Buda Castle, the Heroes Square and many other intersting places.We will definetely remember the Comenius' Got Talent and the farwell karaoke party, as well as the official visit at the district Town Hall. We can also surprise you with a few titbits...Do you know that Władysław Jagiełło (a Polish king) was crowned in Budapest or that soups are as popular in Hungary as they are in Poland? Do you know that the Hungarians are great fans of salty snacks even while having a coffee or do you know the history of the long lost shoes at the bank of the Danube river? We do! 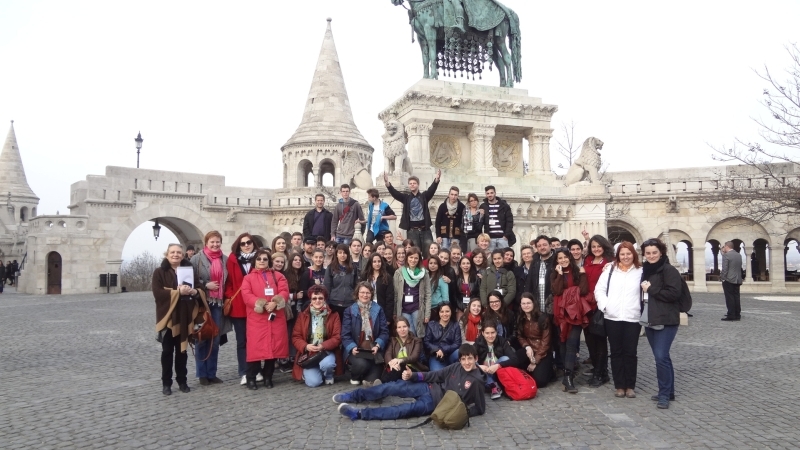 The 6th Comenius meeting will take place in Budapest from 16th to 21st March 2014. The aim of this meeting is twofold. First, to experience the Hungarian Táncház (dance-house), a model for teaching traditional dances that became part of UNESCO List of Intangible Heritage in 2011. 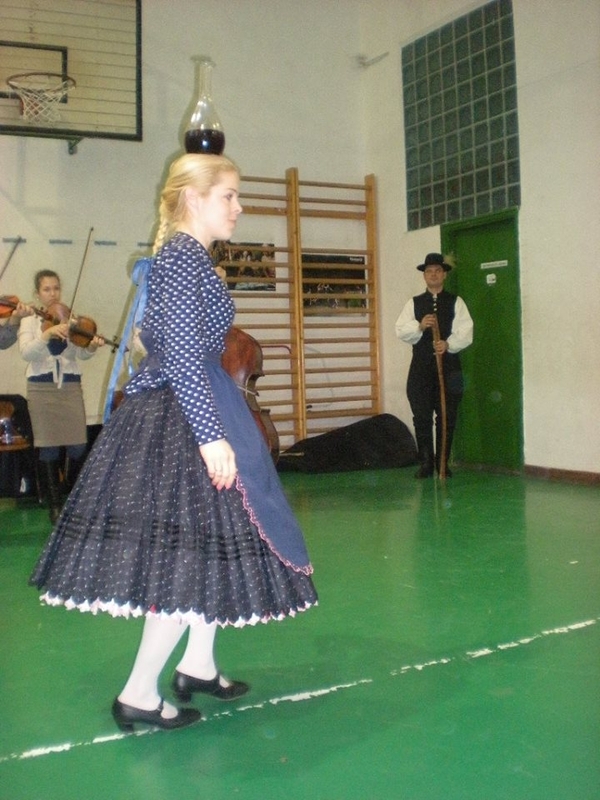 We will learn folk dances with the help of a live band at school and we will all sing a folk song in Hungarian. 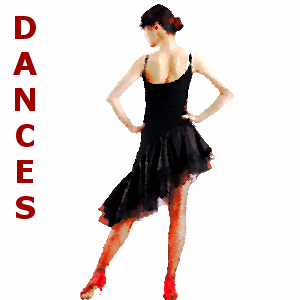 We will also visit a popular dance-house. Second, we will organize the Comenius’ Got Talent show and enjoy the highlights of the Pop Rock music in the 90’s and 2000’s. We will discover Budapest on an adventure tour and visit some landmarks, including the Parliament and Buda Castle. 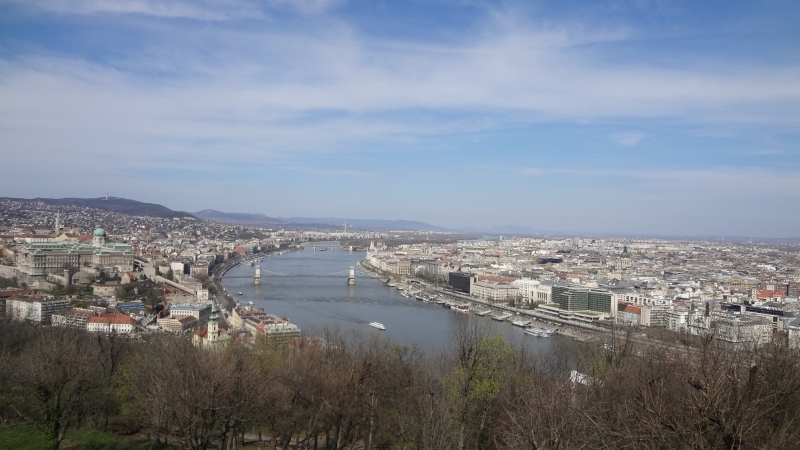 We will enjoy the view of the city from the top of the Basilica and also from Gellért Hill. Last but not least we will see each other again! The Hungarian team is excited about meeting old friends and finding new ones! 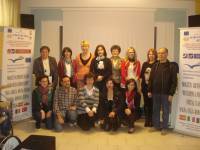 The 5th Comenius Meeting in Barcelona took place from the 8th to 14th February 2014. Everyone was looking forward to that meeting as we haven't seen each other since the meeting in Poland in October. 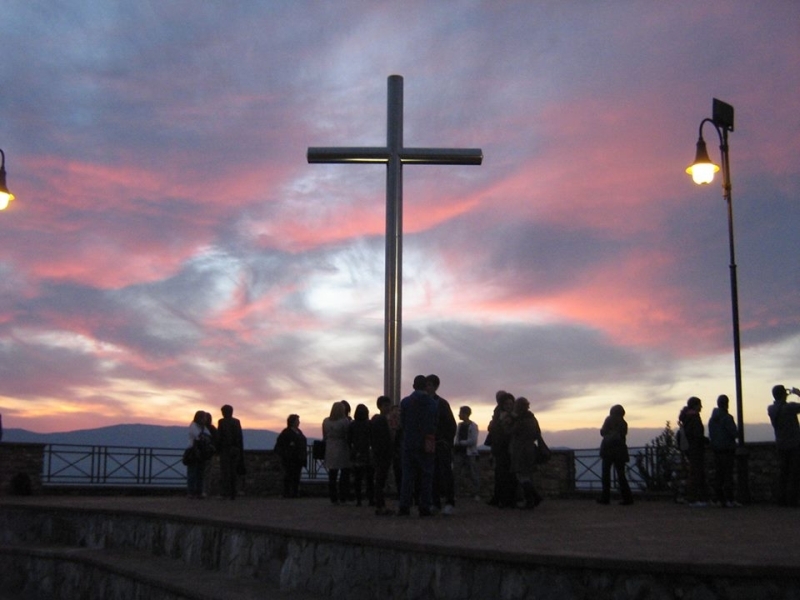 When almost everyone was in Barcelona we went to Sant Adrià de Besòs in order to meet our hosting families. Most of the students knew each other very well as they had a chance to meet before. We went with our families home and met again at school on Monday. On Monday we all participated in the oficial opening of the Meeting. 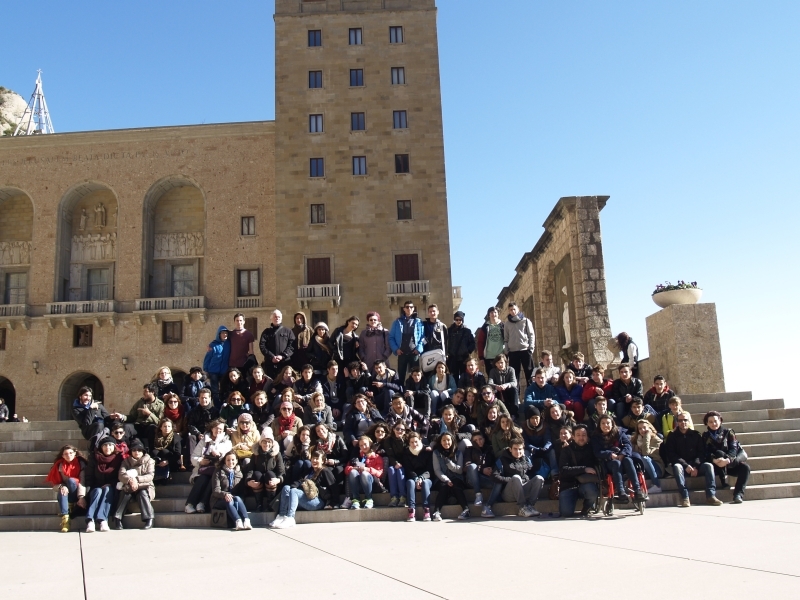 We learned about the city Sant Adrià de Besòs, their patrons and about the school. 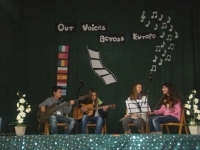 We could listen to some Greek students playing and singing and we also could watch the performance of the Romanian team. It was all very interesting. 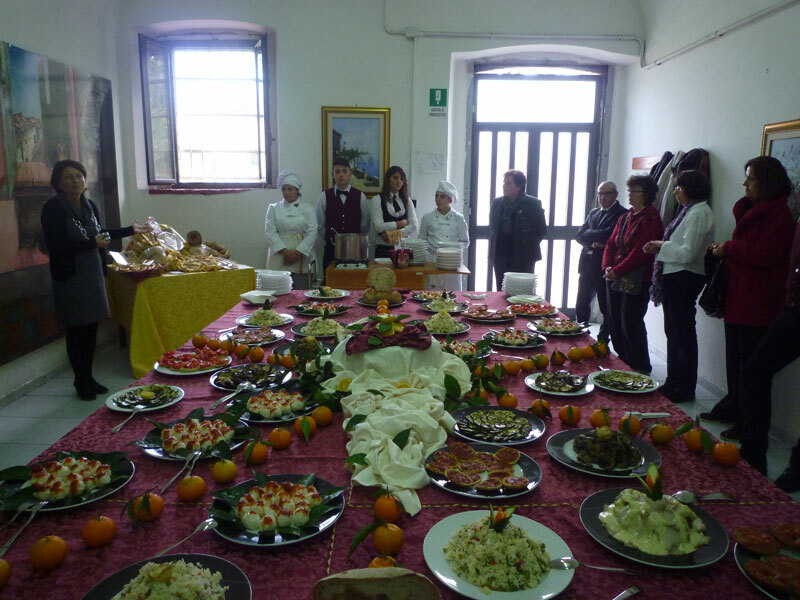 After that, we went on a tour around the school and when we came back to our meeting point, we discovered that there was a lot of food and nice music waiting for us. While we were eating we started moving around and finally dancing. It was great fun and a possibility to break first ice. 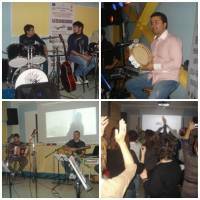 After the party, we started the workshops 'Our Musicians'. 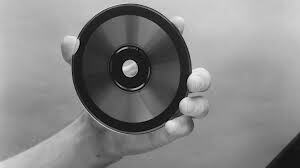 Here everyone was responsible for sharing information connected to the chosen musician of his/her country. We could listen to their music and later we had to present our feelings on a visual poems. 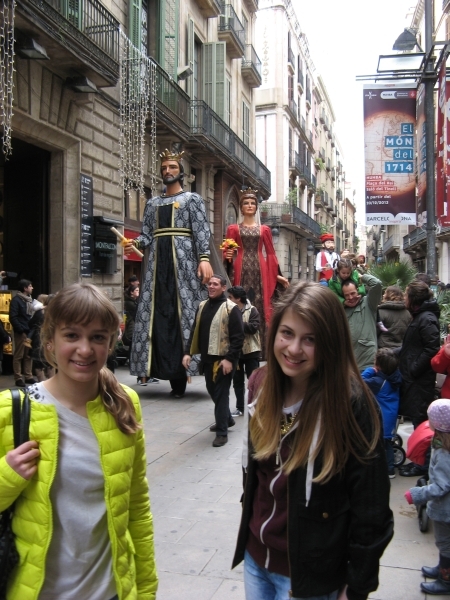 On Tuesday we went to the city centre in order to discover Roman and Medieval Barcelona. 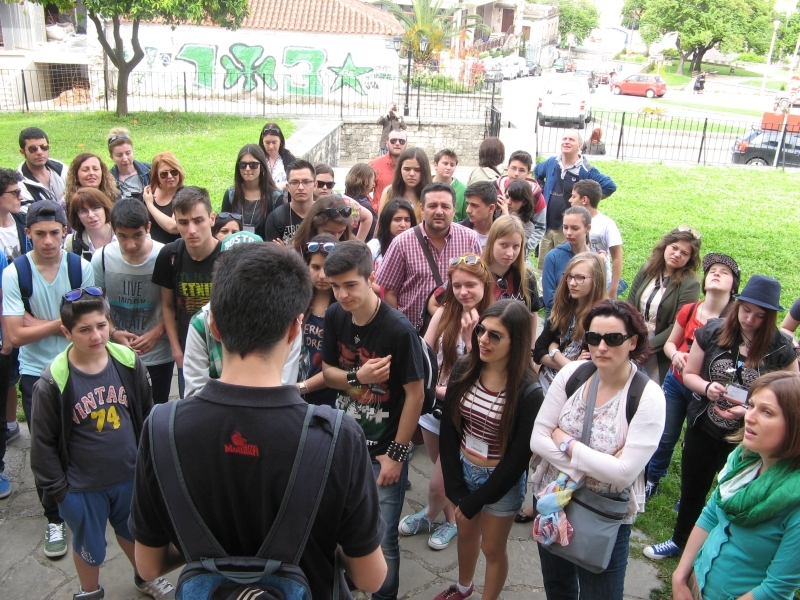 The Turbula Students were our guides and they told us a lot about the history and about Catalonia itself. Later we went to visit Palau de la Música and we learned a lot about this place. 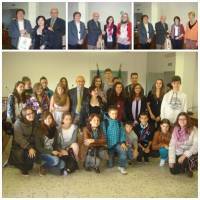 After that we went to the Town Hall to meet and be welcomed by the Mayor of the Town Sant Adrià de Besòs. 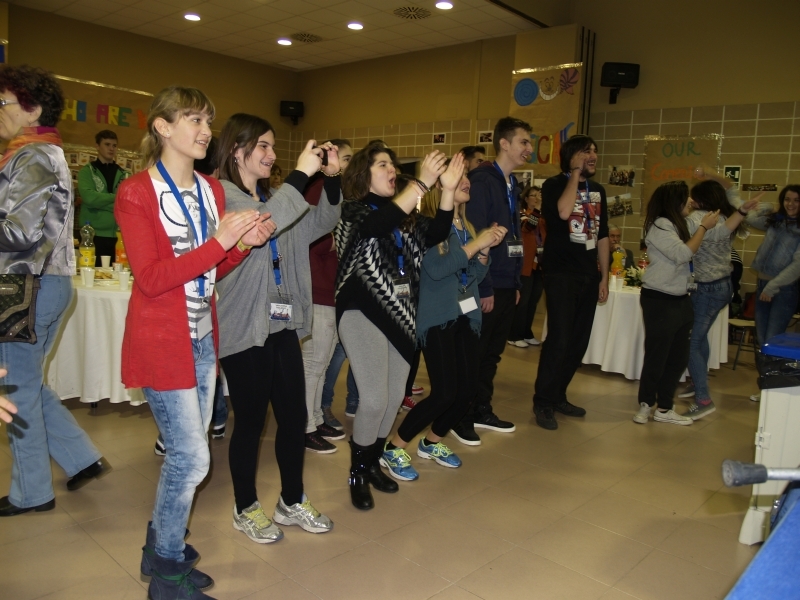 Finally, we came back to school and took part in Catalan dancing workshops. It was fantastic. On Wednesday we also went to the city centre but this time we were discovering Gaudi's works of arts. 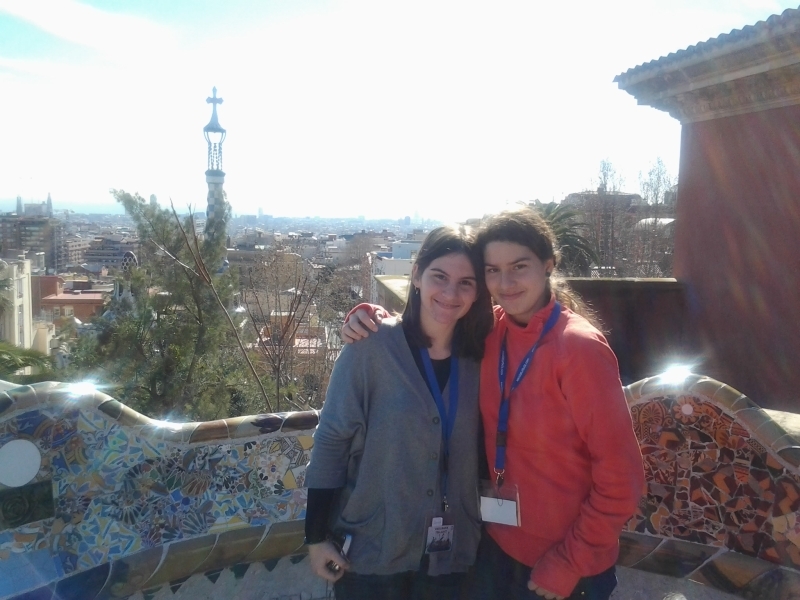 We started in the morning at school where we found out about Gaudi himself and then we went to see Park Guell, Sagrada Familia, Casa Batllo and Casa Milla. 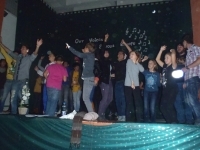 In the evening we came back to school to take part in the Karaoke Concert of 70's and 80's. The Catalan Team prepared a fantastic show for us during which we could listen to some other songs of these times. On Thursday was our last day. We spent it sightseeing Montserrat and listening to the boys' choir singing in Montserrat Basilica. When we came back to school, we had our farewell party during which each delegation taught and was taught a traditional dance from their country. We also had a chance to get to know better our hosting hosting families as they all were present at the party. The party lasted till midnight. On Friday we all had to say goodbye. Students cried and didn't want to go back home. 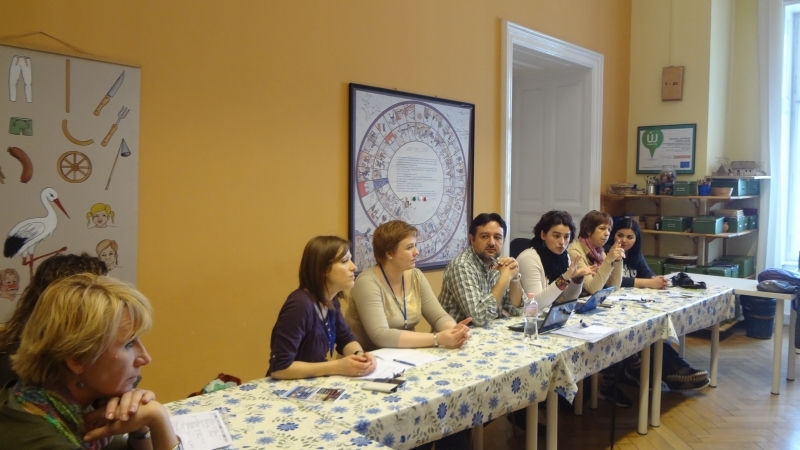 Fortunately, it is not long till our next meeting in Budapest. We are all looking forward to it since today!!! 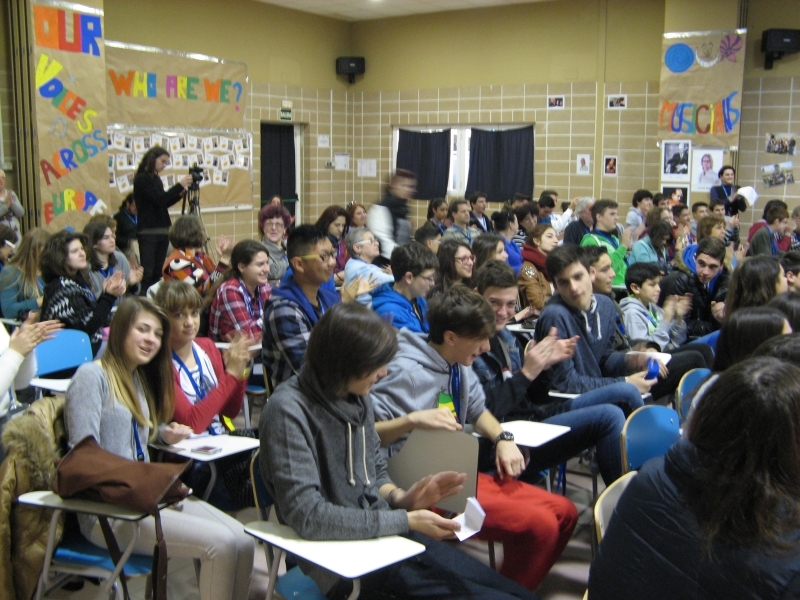 The fifth Comenius meeting will take place in Barcelona from 9th to 14th February 2014. 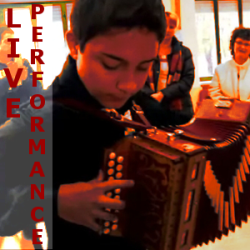 The aim of this meeting is to find out about important musicians and traditional dances from each country. Besides, we will be able to feel the atmosphere of Pop Rock music in the 70’s and 80’s while singing and dancing together. We will also devote some time to visiting and exploring the city of Barcelona. We will follow in Gaudí’s footsteps and we will be able to stare at his landmarks as well as discovering lots of curiosities surrounding the Roman and Medieval part of the city. We will also have the chance to visit Montserrat, in the mountains, and Sitges, by the seaside, in order to get a deeper glance of our country. We are so looking forward to meeting all of us again in Barcelona!!!!! Since the meeting in Poland, “Travelling Suitcase” has already been to 4 countries and it is still on its way to get to Greece on time. It started its journey in Turkey from where it arrived in Poland and then, after working some time on its content, it was sent to Hungary. 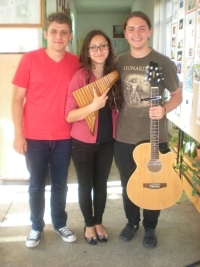 Hungarian Team enjoyed playing with the instruments and music connected objects but they couldn’t do it for too long as it soon had to be sent to Romania. Now, there is time for Romanian Team to explore and have fun with the inside of the Suitcase but soon (in the middle of January) it will set off to Italy. We have been working in our WIKI and now our focus is on pop rock music in the decades from 1970’s to 1980’s both at a local level and in the UK / USA. This activity is very similar to the previous one. Each country is in charge of uploading information about their local pop rock music in these decades. 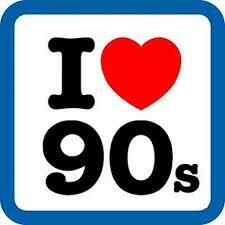 In this way we can all learn about the social context of each country during these decades and the music that emerged. 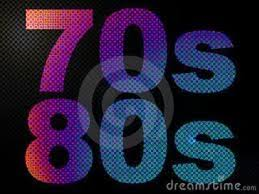 We are also writing and uploading information about the pop rock music in the 70’s and 80’s in the UK/USA. Each country is in charge of writing a part of this section and all the parts together will make up the whole story of pop rock music during these decades in the UK/USA. 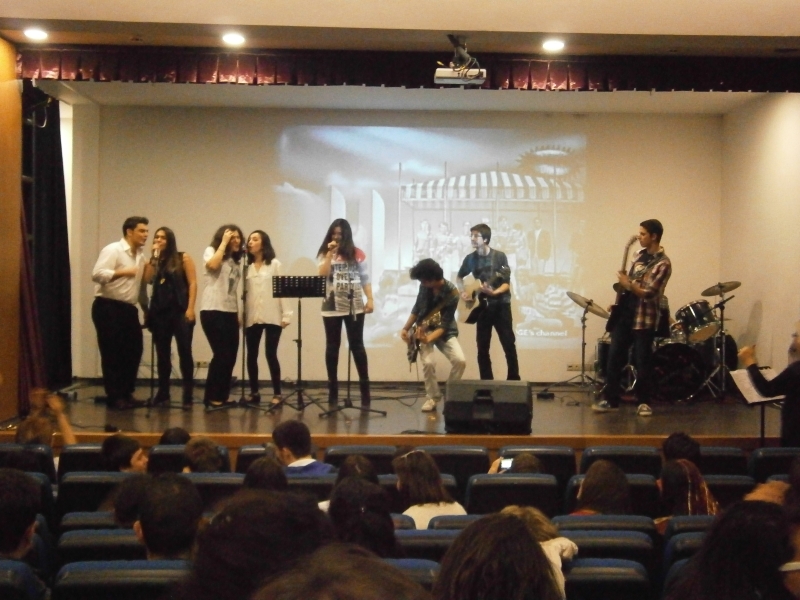 Thanks to that our students will definitely feel, understand and appreciate the pop rock music from the 70’s and 80’s. 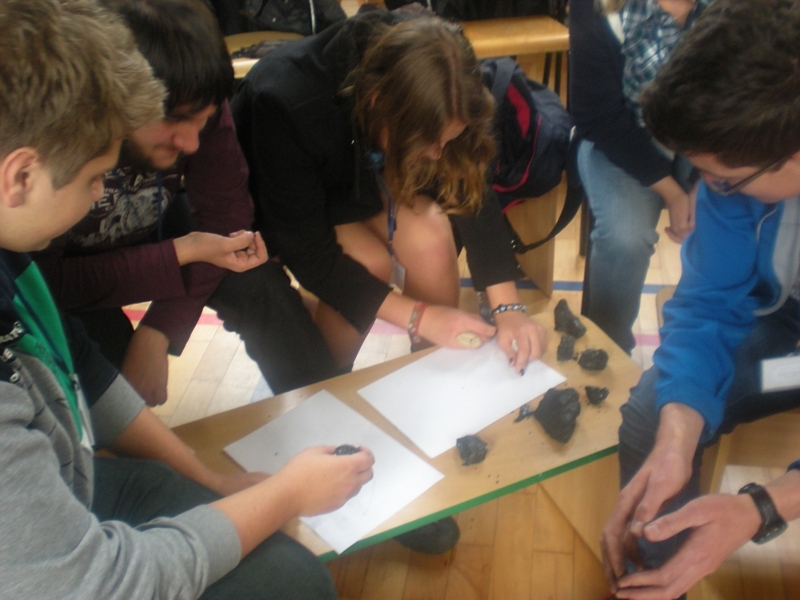 The forth Comenius Meeting that took place is Poland from 7th to 11th October 2013 has finished. 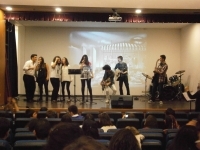 It was a great week during which we had a chance to find out a little bit more about MUSIC – this time we concentrated on the topic: MUSIC AND CINEMA. 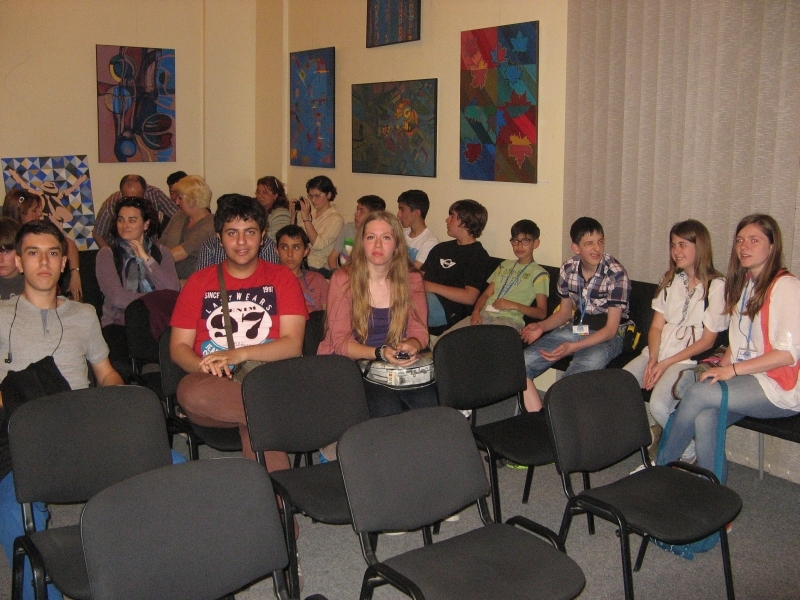 On Monday (during our first day) we met at school in order to participate in workshops about FILMS AND MUSIC IN CINEMA. 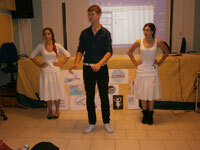 The participants of each country prepared a PPT Presentation about a chosen film and later sang a song from it. We could listen to e.g. "Mamma Mia" song sang by Spanish team or "Everything I do I do it for you" sang by Turkish team. After lunch we gathered again in order to prepare ourselves for the next day, namely for the trip to Auschwitz. 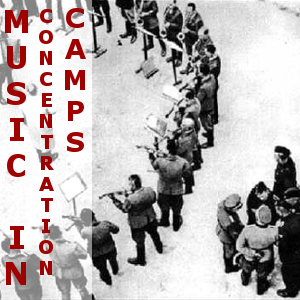 Thanks to these workshops we found out a little bit more about the music in concentration camps. On Tuesday we went to Auschwitz and we gained much more than we expected. Each of us left this place with different thoughts. After this day we may be able to look at the topic of music from a little bit different perspective. It was a day full of tears and it will stay in our memories for long years. 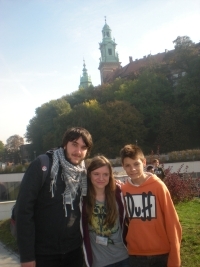 On Wednesday we went to Cracow. The weather was excellent and it let us explore the city. It was a relaxing day during which we visited Wawel Hill, Dragon's cave, market square together with Mariacki Church and Cloth Hall. 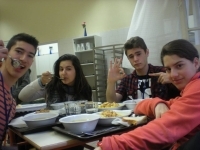 On Thursday we stayed at school. We set off with film workshops. They were based on 3 films: Dirty Dancing, Grease and Chicago. 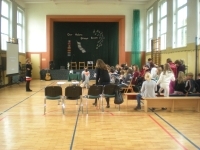 In the afternoon students and teachers could take part in the acting activities. It was a great fun. But the best was going to come – karaoke and disco just after it. Friday was the day of farewell and going back home. Our students made a lot of friends and it was very hard for them to say goodbye. Fortunately, some of us are going to meet again very soon in ... Barcelona! 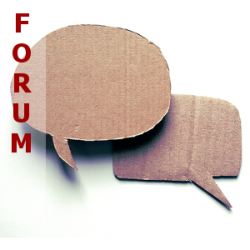 At the beginning of October we are going to have our forth common meeting. During this meeting students from all partner countries are going to learn about very interesting issue - MUSIC IN FILMS. Each country is responsible for preparing a short presentation about a chosen film, then singing a song from this particular film. 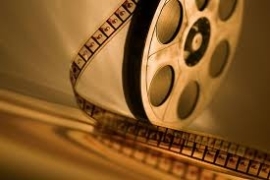 What is more, we are also planning to have film workshops. However, this is a surprise for our students!!! We really can't wait to start working, socialising and spending time with our friends. See you very soon in Poland!!! We are happy to announce that our first year of Comenius has finished and now we all have well-deserved holidays. 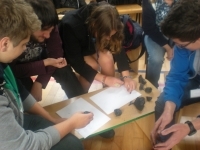 Our work will continue in September after Comenius travelling suitcase, that is on holiday too, lands in Poland. This suitcase will be sent from country to country and will be filled with music related objects from each of them. But now ENJOY YOUR HOLIDAYS !!! In order to learn about each coutry's music in the 50' and 60' we have created a common quiz for all the delegations to work on it. Recently, the quiz has been set up on our common wiki and all the students from the partner schools will be working on it.If you would like to check yourself on the knowledge of each country's music in the 50' and 60', feel free to do the quiz. Next Comenius Meeting which took place in a very beautiful town called Piatra Neamt is over. All the students had a lot of fun while socialising with others, getting to know their peers from different countries, learning about local history and traditions and, of course, trying out Romanian delights. 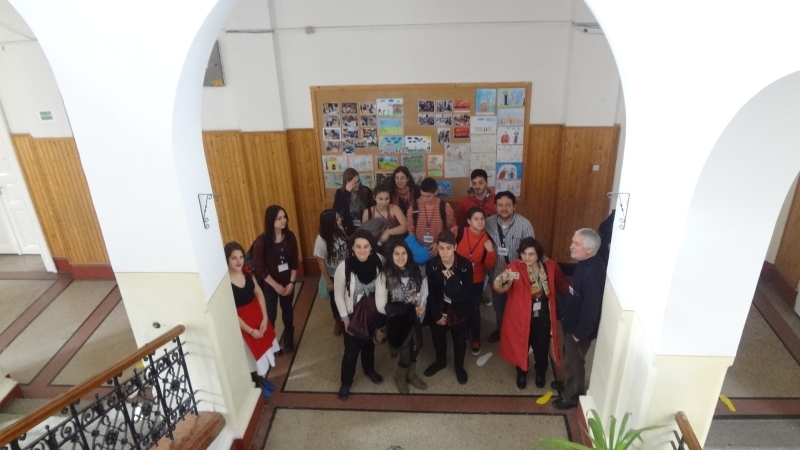 During our first day, we were welcomed by the students from the Liceul de Arta „Victor Brauner” School in Piatra Neamt and we had the pleasure to visit the school. It was a great experience since we were able to listen to some students playing the instruments and singing. 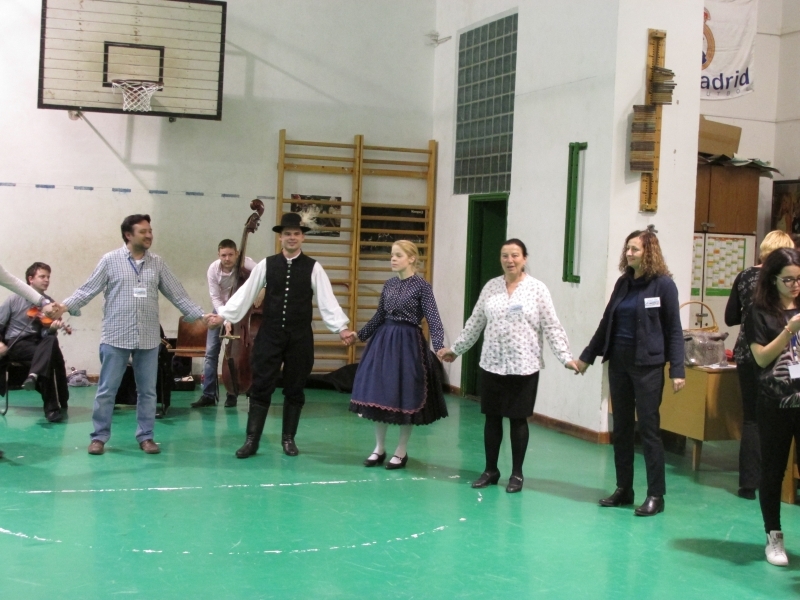 After that, we took part in a rehearsal and all the students could try to sing the Comenius Anthem altogether which was performed on 10th May in front of the great audience from Piatra Neamt. Next day, we visited the museum, where we could see examples of ancient art. 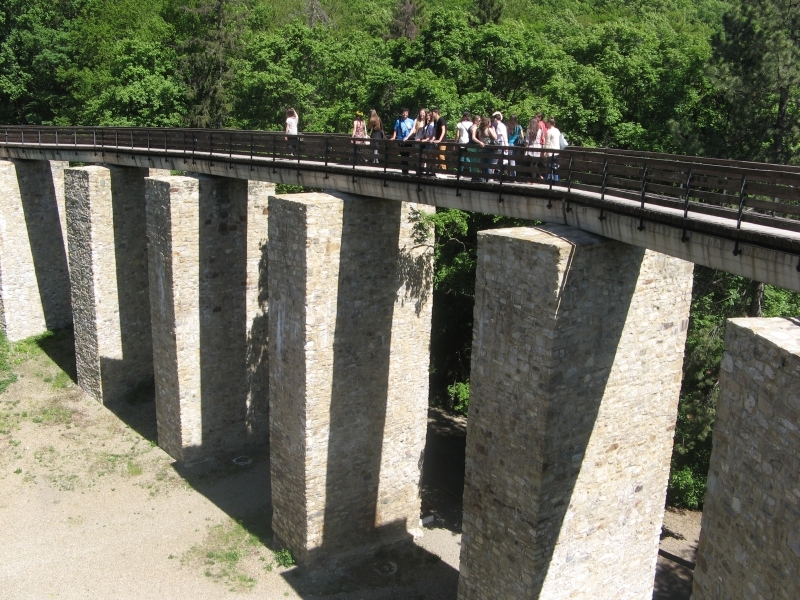 The following days were full of atractions, for example, we went on a trip to the marvelous National Park Cheile Bicazului-Hăşmaş and the lake Lacul Roşu. 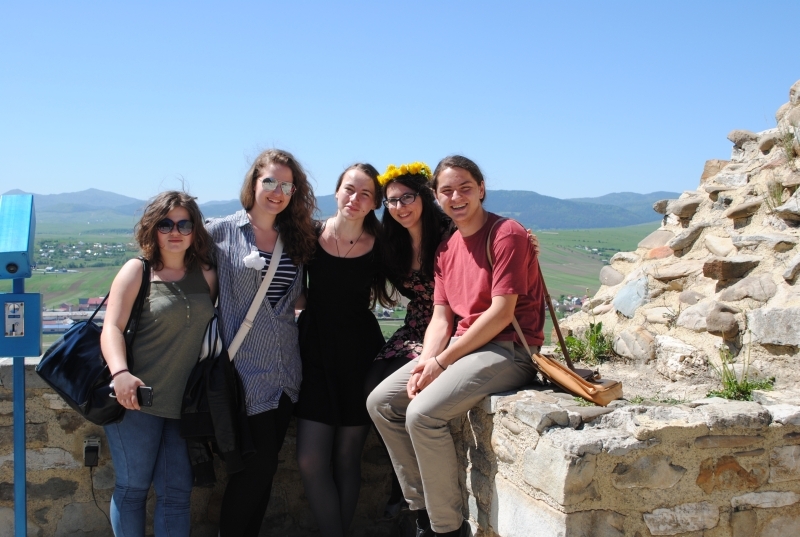 We also saw the Citadel in Neamt and the Agapia Monastery, where we got to know a little bit more about the monastery life. Our last day in Piatra Neamt was also full of attractions. 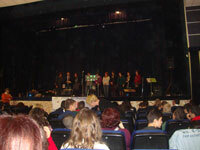 We listened to a fantastic concert performed by the students from the Romanian school. Later, all the teams from other countries were presenting their traditional dances and were singing some national songs. 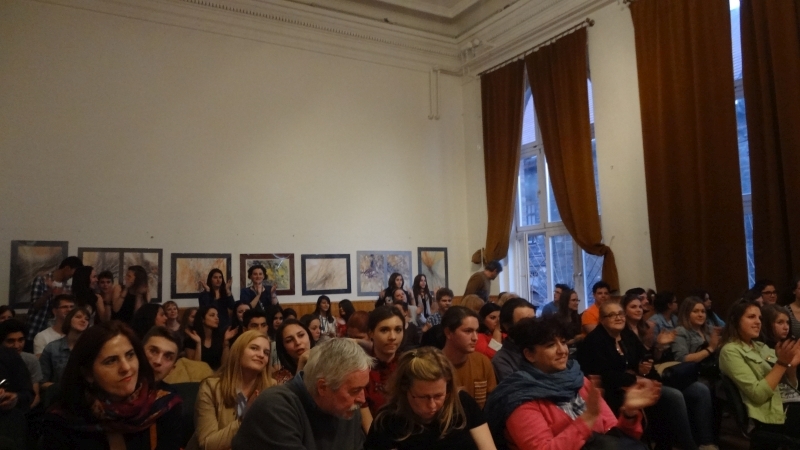 Thank you Romania for your hospitality and the fantastic time spent with your students! On the one hand, each country is in charge of uploading information about their local pop rock music in these decades. 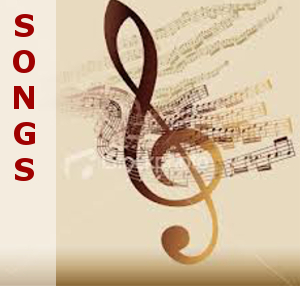 In this way we can all learn about the social context of each country during these decades and the music that emerged. On the other hand, we are also writing and uploading information about the pop rock music in the 50’s and 60’s in the UK/USA. Each country is in charge of writing a part of this section and all the parts together will make up the whole story of pop rock music during these decades in the UK/USA. In order to grasp the essence of each other’s music, we will all upload videos and pictures of different groups and singers who were important in each country. Our aims are twofold: we would like our students to feel, understand and appreciate the pop rock music which emerged in the 50’s and 60’s both at a local level and in the UK/USA panorama. At the beginning of May we are going to have our third common meeting. During this meeting students from all partner countries are going to rehearse the European Anthem as we will have a chance to be with each other on the 9th May (Europe's day). 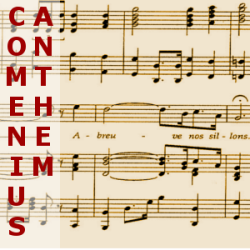 What is more, we are also going to rehearse the Comenius Anthem. 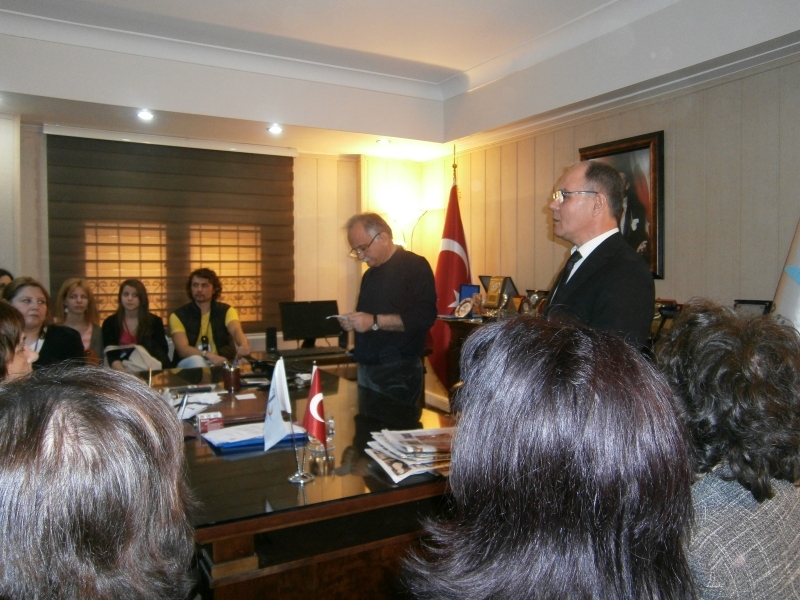 It is important to mention that each stanza of the Comenius Anthem has been written by a country and all the stanzas together were gathered in Turkey. 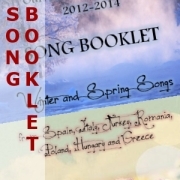 (You will find the Anthem and the music score which was created by Greek team in the RESULT section). 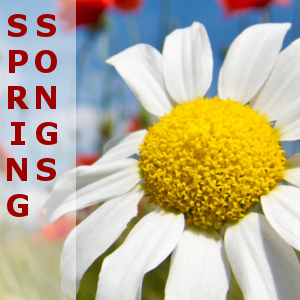 In April all the partner schools are going to receive "spring parcels" from the appointed country. Everyone is very curious about the inside of the parcels and can't wait to get it. On 23rd of February a group of three students from our school (Jakub Mazur, Patryk Kurz-Jurek and Kacper Garcon) under careful supervision of Mrs Olga Dołbniak and Mr Michał Molendowski left for Izmir, Turkey. The journey was comfortable though a bit long since we had to change planes in Munich which took us a couple of hours. We arrived at Izmir Airport on schedule and were being awaited by our hosts who took us to t he school where the three students were transferred to their Turkish host families. 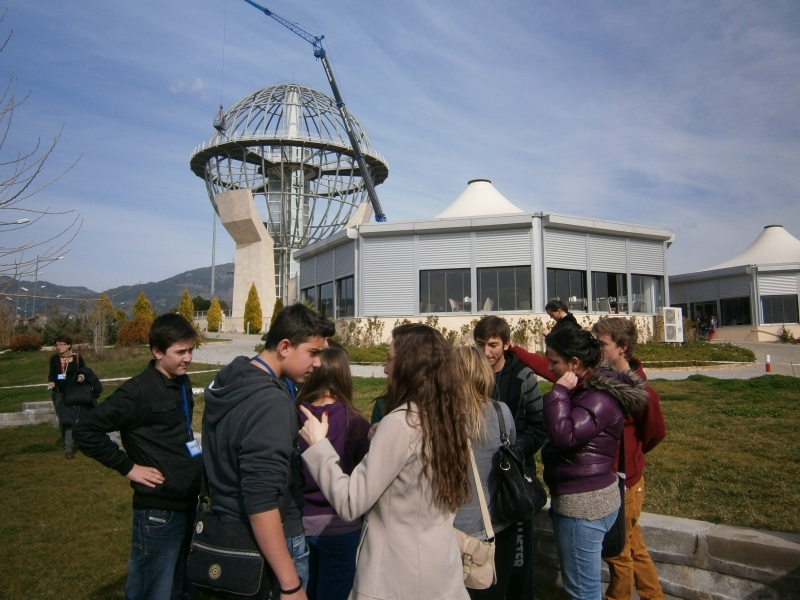 At the first glance one could get the impression that the kids would have an awesome and inspiring time in Izmir. Since Sunday was a free day both for the teachers and the students, we all had a chance to do a lot of sightseeing admiring the whole of Izmir. 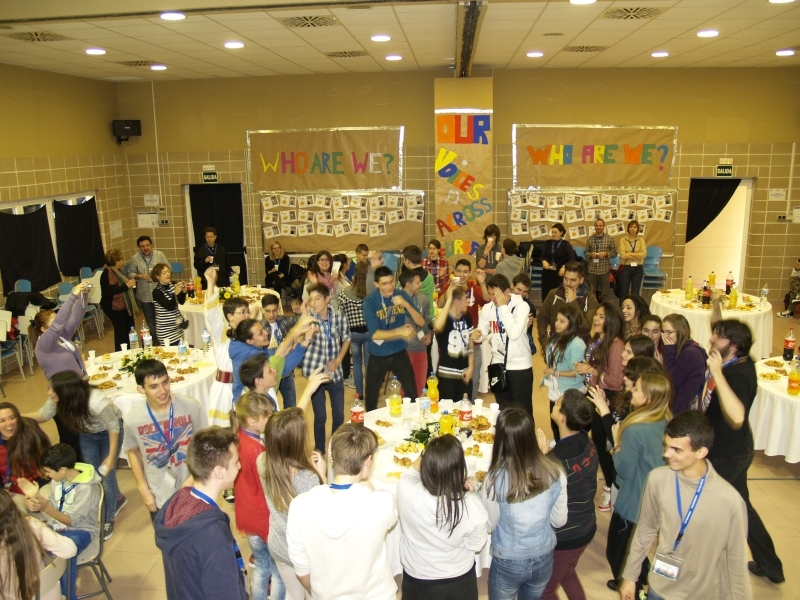 Monday was the day when all Comenius groups (Polish, Turkish, Spanish, Italian, Romanian, Hungarian and Greek) got together. 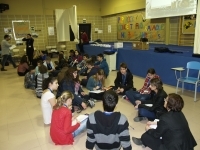 The meeting point was the school and the international workshop was the arena. On this day we also saw a picturesque panorama of Izmir, met the mayor of one of Izmir districts, visited a church and many other historical places. 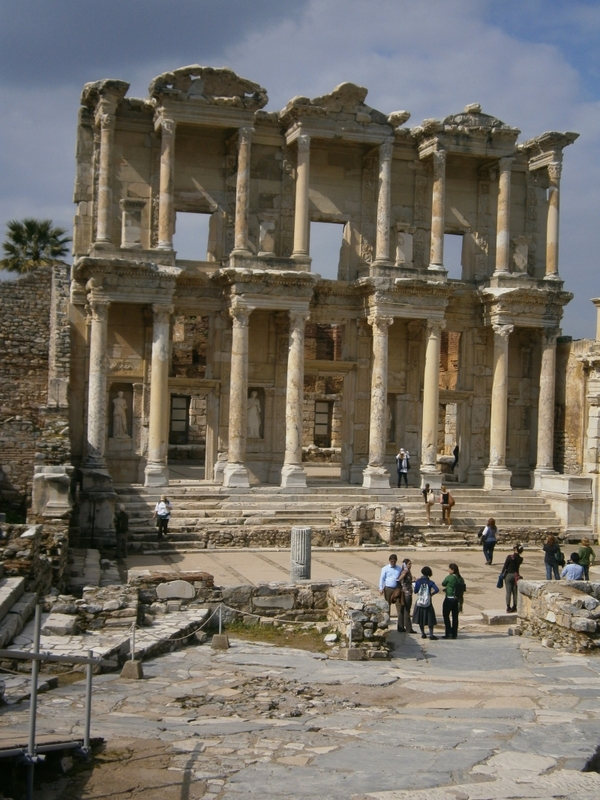 Tuesday was devoted to visiting the ancient city of Ephesus where one could feel the atmosphere of ancient civilizations thanks to a great touch of history delivered to us by our Turkish guides. On our way back from Ephesus we visited a small village of Sirince with a fantastic mixture of Turkish and Greek influences. 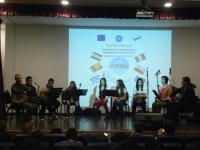 Wednesday was again Izmir-based day on which students performed their traditional musical pieces in front of the international audience. 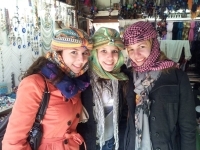 Later on we visited the oldest mosque in Izmir and walked around the busy market full of Turkish products. Thursday was the day when we had to say good-bye to our Turkish friend and headed back to Poland. We had a marvelous time in Izmir. Thank you. 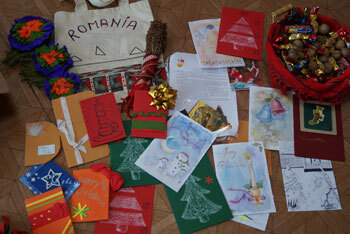 Winter Parcels: So far all the partner schools received "winter parcels" from the appointed country. 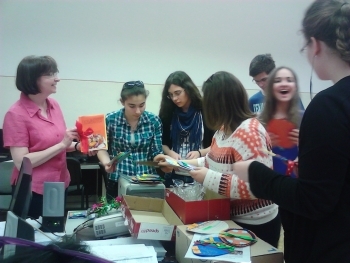 All the students were really excited about the parcels and their contents. They all agreed that everything what was found inside the parcels made them more knowledgeable about the countries and their traditions. It was great fun for everybody. We are after our first common meeting in Italy (Trebisacce). 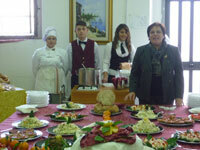 It took place from 26th to 30th November 2012 in Trebisacce, on the south of Italy. On the first day we had an opportunity to visit the school, meet the headmaster and other teachers of I.I.S IPSIA-ITI “Ezio Aletti” school. We also met the mayor of the city and saw the town. After that we took a short walk around the city and had lunch in the local restaurant. 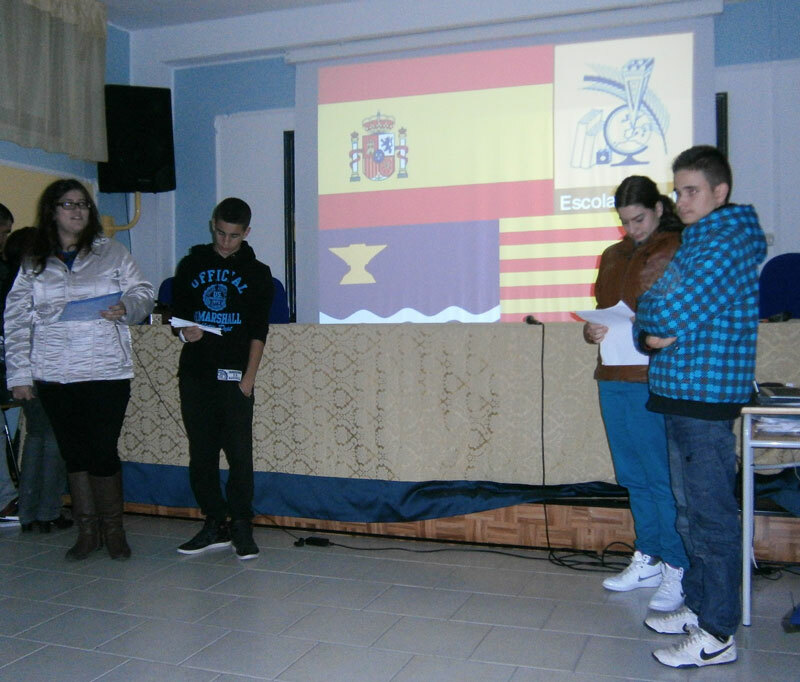 The first working session at school was dedicated to the presentations of participating countries. And then, a short trip to the museum of Olive oil “Museo Ludovico Noia” where we had a welcoming dinner prepared by the students and teachers. 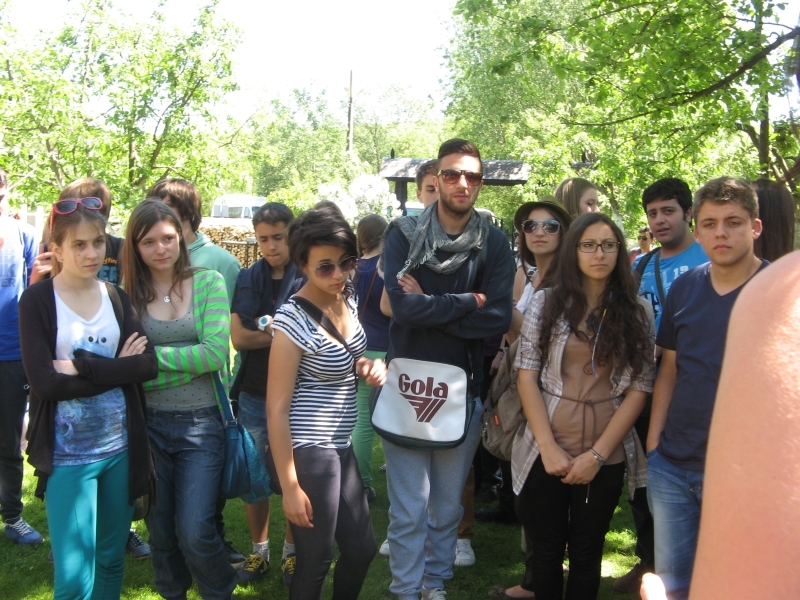 On the second day we could participate in a trip to Bisignano. There, we met the mayor of the city and watched the musicians performing on traditional instruments.Later, we went to visit the workshop of a skilled lute craftsmen. 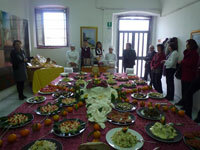 After that, we also had a chance to try some traditional Italian dish at the agrifarm. 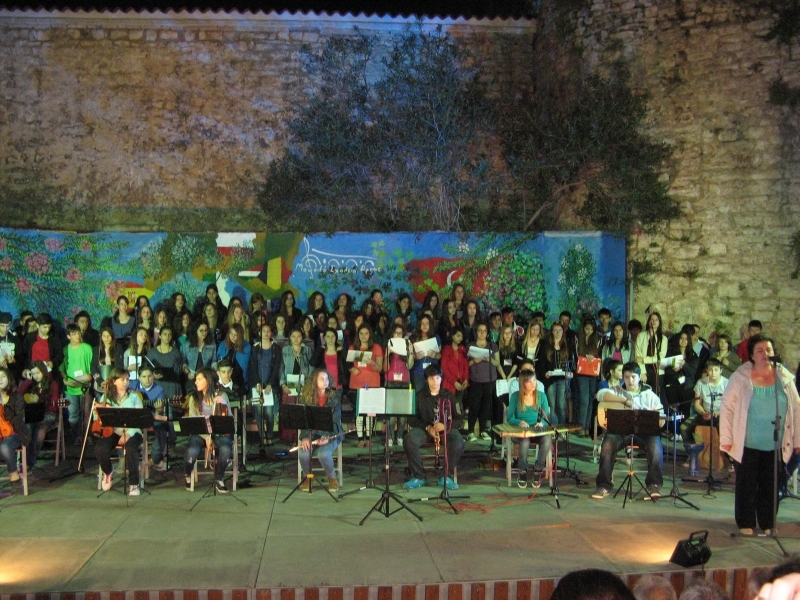 In the evening we came back and participated in the folk music seminar - a performance of a local music group. 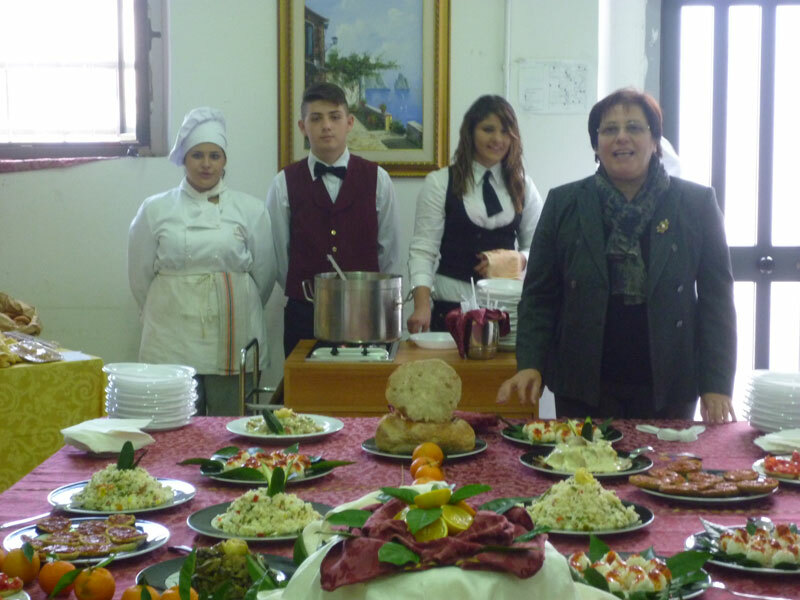 On the third day (Wednesday) visiting students first observed how the traditional meals are prepared by the students of the hosting school, then presented the songs in their own languages. 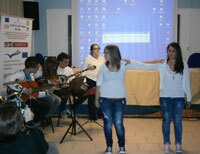 They also watched a folk music show prepared by the students from the hosting school. 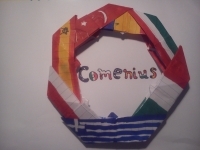 During that session we chose the winner of the Comenius Logo contest – we presented two logos from each country without giving the name of the country, just the number. 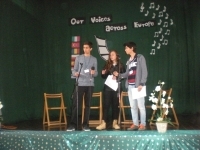 Each person had a right to give one vote, the winner was logo of Hungary and their logo became the official logo of "Our Voices across Europe" project. 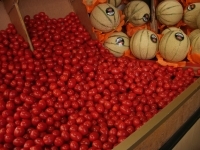 On the fourth day (Thursday) all the students and teachers could observe the processes of production of liquorice and mozzarella cheese in Amarelli factory in Rossano and in Bufavella cheese factory. 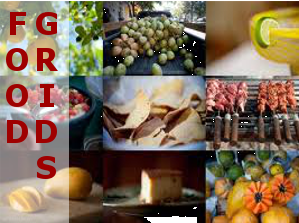 The students completed the vocabulary grid in order to know all the words connected with food from the songs presented the day before. 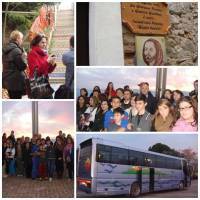 On Friday all the coutries set off from Trebisacce and came back to their countries. 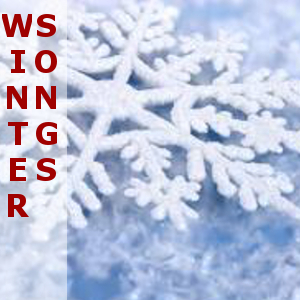 Now, we can start working and preparing for our next meeting which will take place in Turkey, Izmir in February. 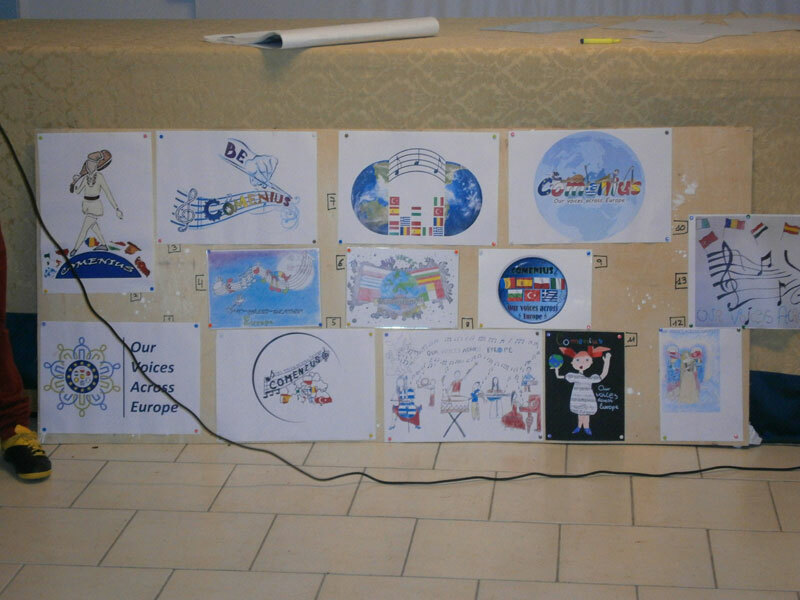 Logo contest: Each school has already set up the competition of COMENIUS LOGO. 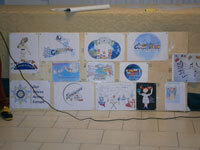 All the Logos will be evaluated by school community and 2 of them will be taken to Italy. There, the 2 Logos from each country will be exhibited and later the best one will be chosen for the project OUR VOICES ACROSS EUROPE. 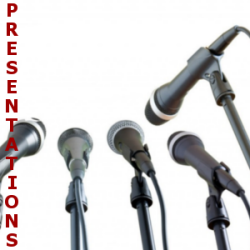 create a Power Point Presentation about each country, region and school. All of them will be presented during the meeting in Italy. prepare one traditional song related to food. 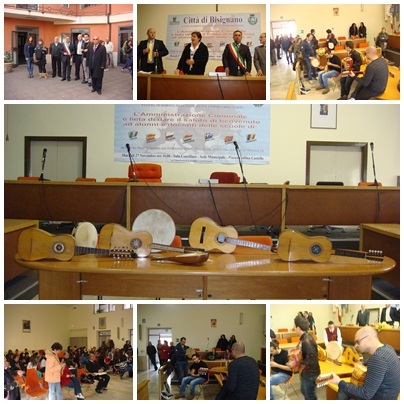 The songs will be performed by the students during the meeting in Italy and some activities connected with the song will be carried out. Hello , my mane is Aldo Troilo and I am working with my class 2 I at the Comenius project. The meeting held in Trebisacce was very nice for me because I made friends with new boys and girls from other countries (Greek, Polish, Romanian and Turkish. We are in contact on facebook especially with the Greek friends.I liked the project because I had the possibility to speak with my new friends in English and because we are all the same with the same desires and tastes. 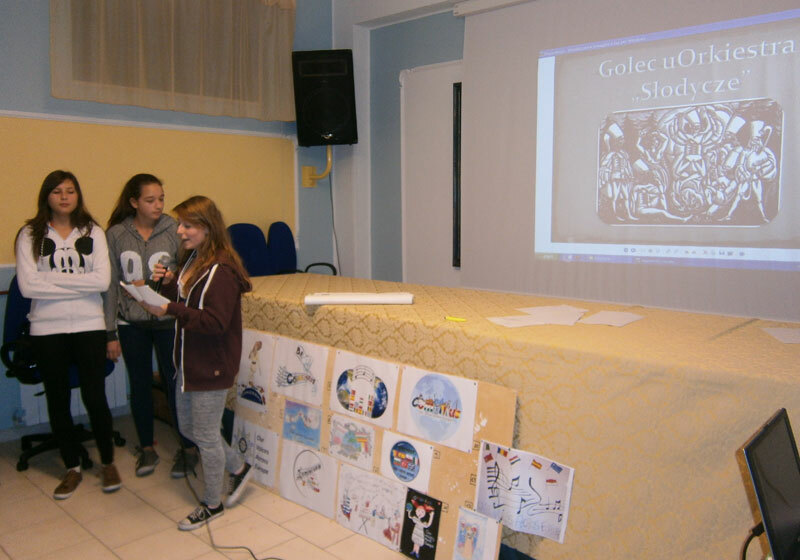 Hi, my name is Basile Marianna, and taking part to the Comenius project was very significant because meeting people from other countries and communicate with them through another language, English, it was very hard. I thought I could not talk to them but forced myself and introduced to the new boys and girls. I made friends right away because they are very nice, especially with Petra, a very pretty girl who comes from Hungary. When she went home we made facebook contact. It was a very nice experience! I look forward to see them and meet new friends in the next meetings. I am Mariagrazia Urbano and want to say that with this project we had the opportunity to meet other people in particular boys and girls of our age from other countries. This project is very educational and want to meet other students and participate to the next meetings abroad. 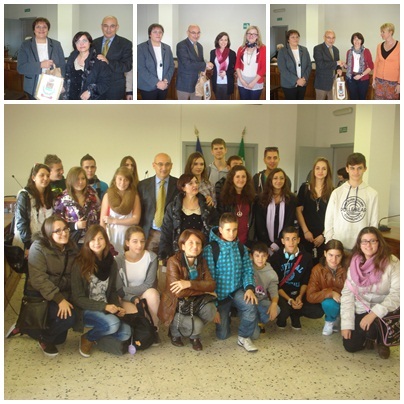 Hi, I am Marco Fazzitta and I hosted a student from Greece. It was the first experience but I am happy I did it because Cristos is a very very nice boy. I want to go to Greece meeting because I want to meet him again and meet his parents. My parents think he is very nice boy!! 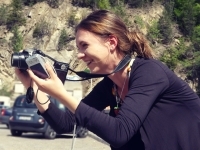 Hello , I am Chiara Odoguardi and this project was very important to me because I could meet people from other countries and speak a different language, but the little English I learnt was OK to communicate with my partners. We have regular contact on facebook. Hi, we are Marco Silvestri and Mohamed Fariss from class 3 I and we are very happy of our project meeting because we met new friends. We were a little shy but when we met our partners, friendly and nice we started to talk. We didn’t know what to expect from this meeting because it is the first time for my school hosting friends from other countries with different language and cultures but playing volleyball with them and singing and staying together we had good time. 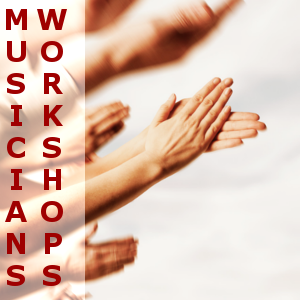 We worked together on the music worksop and cooking workshop. It was fun. We made plans for the evening going to pizzeria and going for a walk on the boardwalk in Trebisacce. 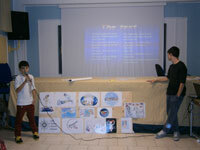 We had a great time and with this project we opened our mind and our house and our heart to them. We have good contact with Petra, Roland on facebook. My name is Lucia Lucente, class 3 I, and this meeting was a nice thing for me. I wanted to host a friend from another country and my parents wanted also but it was not possible because I live far from Trebisacce but it was OK to meet our partner students at school . 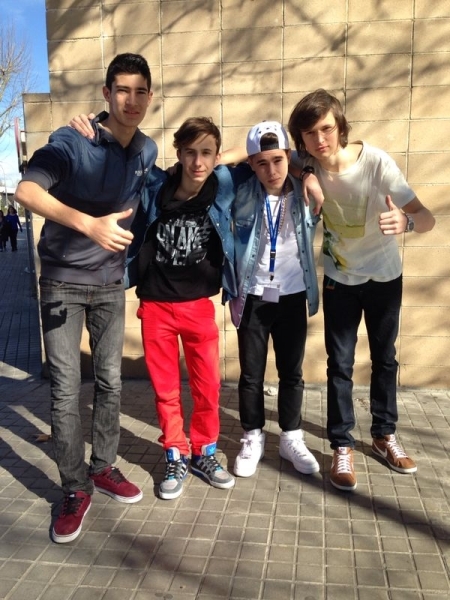 They are very nice , we talked in English and we are friends now. I hope to meet them again in the next project meeting. We know some words in Spanish , Greek, Hungarian, but we remember holà, buenas dias, kalimera, muchas gracias !!!! Very nice experience to repeat!!!!! I really enjoyed seeing how they produced liquorice, except for the smell, which I didn’t like. I didn’t have any problems to communicate with all the students and teachers. I really liked the typical dance from the south of Italy, which is called “tarantella”. I also enjoyed the good Italian food. Also I was surprised to see how liquorice is made. In Italy I made a lot of friends. During this trip I learnt how the liquorice is made. 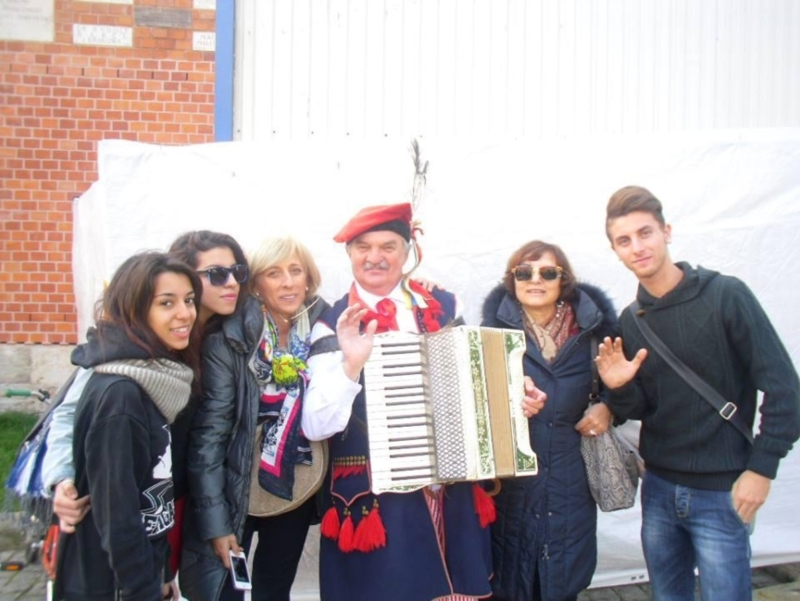 I learned about the typical dance from Calabria called “tarantella”. I learned about traditional instruments and how mozzarella is made. In Trebisacce ı saw that people were wearing their shoes at home. We don’t wear shoes at home in my country. I learned to say numbers in Italian. I learned to say numbers and some letters in Greek, too. I liked the grafitti works on the trains in Italy a lot. I learned to say ‘I love you’ in Italian. I saw that the taps work with a treadle. I saw that students’ homes are far from the school. I saw that everybody knew each other. I saw that life in Trebisacce is so easy and relaxed. In Italy I have learnt: lots of new Italian words, I tried delicious food, I ate real salami and it was awesome! Trip to Italy was a very cool experience. 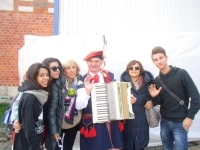 The most I liked was the whole Trebisacce and that we met people from other countries with whom we 've became friends. Not to mention Italian food and of course Italian boys!I've also learned a few Italian words, for example: ciao-hello, bella-beautiful. What did I learn in Italy? This is a difficult question. 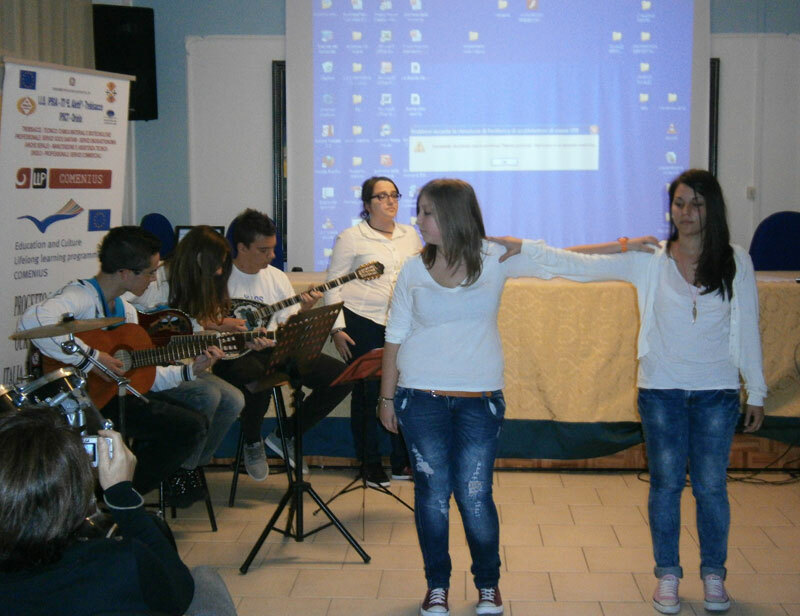 I was in Italy because of the Comenius Project. I have never been to Italy before, so I enjoyed it a lot. My knowledge of English language improved in Trebisacce. First of all, I made a lot of friends. We talked in English, of course, and it was exciting. Sometimes it was a little hard, because there were a lot of words, what we didn't know, but I learnt much. I learnt a little Italian language. It was funny when I tried to say a word in Italian and I made a little mistake. The programs were good and interesting, I liked the factories and Bisignano. I think the most important program was the first presentation. Because of the presentations we knwe each other, we knew the countries, the school and the traditions. The second presentation was good, too, I like music and the different countries' musics amazed me. I think the program when we learnt the foods in a lot of language was useful. I know now that the Italians have good foods. Those were delicious, but maybe a little bit too much for me. I really liked the Italian music, the concerts were my favourites. In my opinion, Italy is a beautiful and amazing country. All in all, that was the best 'holiday' in my life. 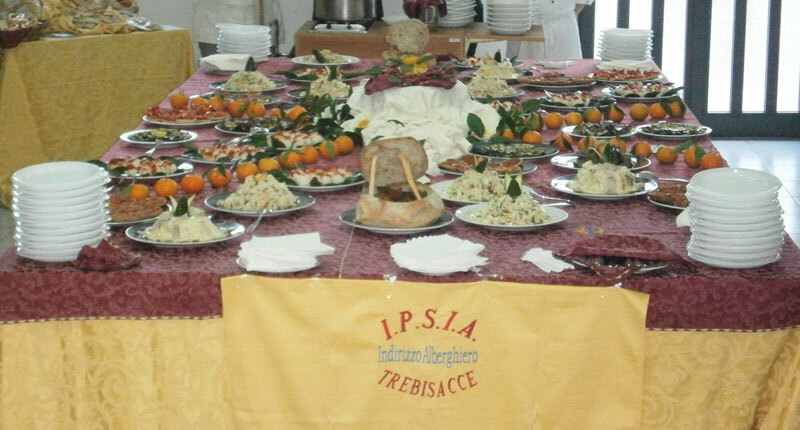 I hope I will go back to Trebisacce with my friends one day. At first, I thought I will learn only the couple basic words in the participating European languages, but after a couple day, I realised that we gained much more than that. We gained experience, we presented our Culture and School and our ordinary life in our country to the other student and they presented their too. We made new friendships which will be strong enough to arrange new meetings anywhere in Europe but not within the project. 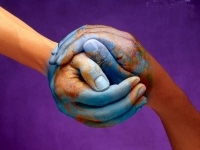 I'm more open to the world after these days, I feel more comfortable if I speak with a foreigner. What was good? Everyone was nice and kind, the places we visited were unique and beautiful. The programs were fascinating and exciting. What was bad? The travel was long and exhausting and sometimes the programs/events were a little bit incoordinated but we were flexible to these problems. What should be changed for the next meeting? The programs should be more cordinated and the time spent with sightseeing could be a little bit more. 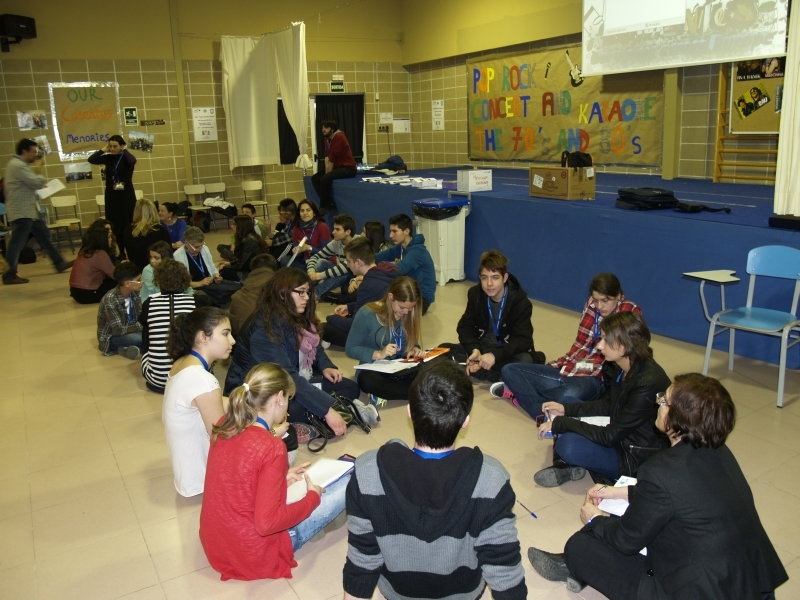 I'm very happy to get the opportunity participating Comenius project. I felt great during the trip. All the events were really interesting. The family I lived with was so kind and friendly. 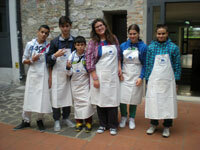 It's difficult to choose the best program, since the Italian partner school found out very colourful activities for us. Maybe the best program was the concert in the theatre (in Wednesday), because we could hear nice music and we could dance. I have many cheerful memories. I could find friends from more countries. I could learnt a lot about the life of the Italian teenagers. I keep contact with new friends by Facebook. I also learnt foreign expressions, everyday words or even funny things. Like a Turkish boy wrote a sentence into my phone (all with very similer-sound words). As Hungarians keep the deadlines so seriously, that is why it was a bit strange for me, how flexible Italians managed the pre-fixed time- table. However I did have an excellent time and I would be appreciated to repeat the whole. I would happily meet with my new friends again. For me this project was a first step for leaving the country. I understood that although we are so different we understand each other, we laughed at jokes, we have played together, and we cried farewell when we left for our countries. I am pleased that we still talk to each other. 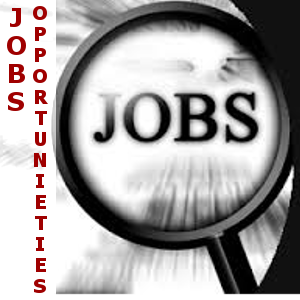 All students should go on such projects because it is a big opportunity for their future. I hope to I have the chance to take part in another again. We discovered beautiful Italian places. We met very kind people. Great food. We listened to very nice folk music. In Italy we met people from a lot of different countries and we communicated with them, learning different cultures. 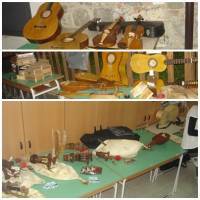 We listened to folk music and we saw a lot of traditional instruments that we didn't know. Wonderful experience. We met people from different countries. We forgot about xenophobia which was in a small corner of our mind and it was a great experience!!! What is more, food was absolutely wonderful. What I remember from our trip in Italy is my desire to learn Italian and I would like to stay in Italy forever! Pupils were very friendly, their school was impressive, they cooked great food, the museums were amazing and I would like to go back there sometime!! Abbiamo passato una fantastica settimana!!! Vi racconto della settimana che ho condiviso (insieme alle mie bambine) con le ragazze rumene e polacche partecipanti al progetto Comenius. Purtroppo le ragazze polacche, Hola, Angelica e Martina, hanno dovuto anticipare la partenza, mentre con Anka e Delhia abbiamo avuto modo di interagire per più tempo. Le ragazze ospiti, simpatiche, molto educate e socievoli, hanno condiviso momenti della giornata con me e le mie bambine, che si sono arricchite scambiando con loro momenti di gioco, esperienze culinarie e lingua inglese! Non vediamo l'ora di ripetere questo scambio culturale, di amicizia, di condivisione e di vita! un grazie particolare ai coordinatori italiani del progetto che hanno organizzato il soggiorno dei ragazzi partner con grande professionalitàe disponibilità, lavorando in sinergia con le famiglie e con i colleghi stranieri. We spent a fantastic week!!! I'll tell you the week I shared (along with my girls) with the girls Romanian and Polish participants in the Comenius project. Unfortunately, the Polish girls, Hola, Angelica and Martina, had to leave early, while Anka Delhia and we were able to interact for longer time. The girls guests, nice, very polite and sociable, shared moments of the day with me and my children, who have been enriched by exchanging with them playing time, culinary experiences and the English language! We look forward to repeating this cultural exchange, friendship, sharing, and life! a special thanks to the Italian coordinators of the project who organized the stay of their partners with great professionalism and availability, working in collaboration with families and with foreign colleagues. 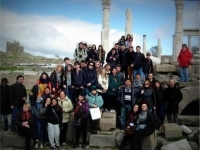 Comenius Project TURKEY 2 from Túrbula on Vimeo. I liked the trip to Efez a lot. It was really nice and I will probably remember all the sights for a long time. I’ve learnt a lot of words in Turkish. I tried a lot of different Turkish meals, but I didn’t like cola a lot. 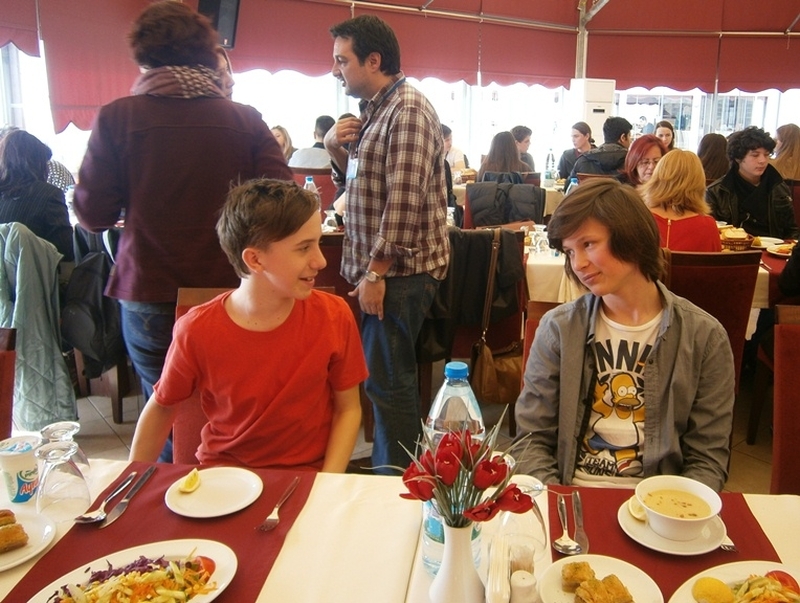 I liked everything about Turkey: Turkish food, hot weather, culture, the school we went to. And most importantly, the people! The only thing I didn’t like was the rain on our last day in Turkey. I’ve learned some Turkish words. I know Turkish music now and the fact that there are a lot of cats in Turkey. I liked the weather, Turkish customs, the food and the Turkish girls. I didn’t like the rain. I’ve learned Turkish words. I’ve seen Efez. I’ve tried Turkish pizza. I’ve learned about Turkish money and music. This has not been the first time I had the chance to meet people from around the world, but it has definitely been one of the best. I’m not being too enthusiastic or too kind when I say I’m sure that some of the friendships made in Izmir are life-time friendships. It was a great experience for me, as I visited places with such a history on their shoulders, places that I will always remember. The activities in the school helped us know each other better and create beautiful things together, and memories that time will never be able to erase. The first word that comes to my mind when I think about the Comenius Project is probably “W-O-W”. It was an amazing experience, I`ve learned a lot about the Turkish culture and architecture, food and the most important: Turkish people. I think Stephan the Great never imagined that the Romanians and the Turks could manage so well. Hundreds of years of battles made us realize how much alike we are, how many things we can learn from each other and how many friendships we can establish . Without this project, I would never have had the opportunity to see Turkey and to meet other students of other nationalities. I am very grateful for being in this project. Our second trip , the one to Turkey, is over. I was one of the lucky kids who had the chance to go to this wonderful country. I was very impressed by Turkey and Izmir and now I am very grateful that I went there. In Izmir I made a lot of friends and met a lot of new people. It was very interesting to learn directly from the source about the country’s customs and culture. My hosts were very kind and nice and I got used easily to their kind of life. In my host family I had the chance to taste some of the traditional Turkish food and learn something about their daily life. 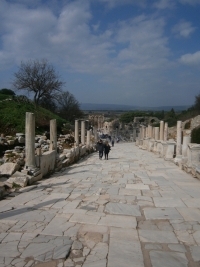 In Turkey we visited a lot of beautiful historical places like Efes and Bergama. My favourite thing on our trip to Efes was our guide. He was a very happy and kind young man who made a lot of jokes but also shared with us his amazing knowledge. In conclusion, the meeting from Turkey was very important for me because there I had the chance to socialize with multinational students, to discover their behavior and mentality, and to learn more things about the culture of Turkey. But the most important thing of the trip is that I had a lot of fun! 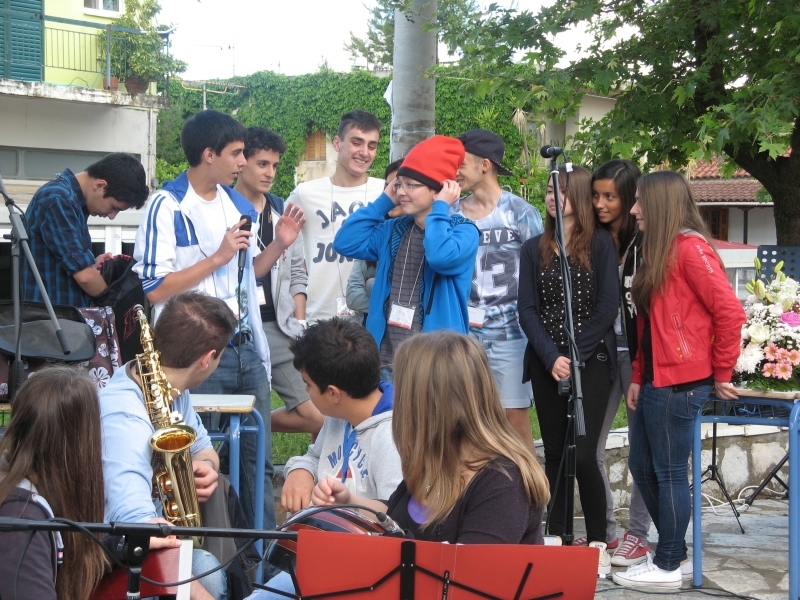 For me, “Comenius Project” was the most beautiful experience that I have ever lived. I've made many friends with whom I will try to keep in touch. I had the good fortune of staying with a family of special people. For me everything was perfect; I visited many places, I lived in a very large city. I think the biggest win that I could have out of this experience is that I have made friends whom I hope to see again some day. It was my first experience of this kind. I was really nervous and scared by the thought of going to another country, living with a foreign family but after the first day spent in Izmir I realized that the Turkish people are sociable and funny. I will never forget that day when we started singing with the school band some rock’n’roll songs. We were all together there singing about friendship, love and having fun. I hope some day to see again all the friends that I have made there. I think that every child should take part in a project like Comenius! liked very much the trip in Izmir because the people is so hospitable and willing to make you feel happy for traveling in their country. I am so glad to meet many children but especially the guys from Spain who I will never forget!!! Izmir is a really beautiful city with beautiful sights and buildings. Traditional food is varied and tasteful, at the beginning it was a little strange I think for most of us, but in the end we all loved it. I personally loved the thing that Izmir is near to sea and the thing that whenever you want you can have a walk near beach. People there are always happy and friendly, they don’t have prejudices and they do their best to please you. Turkish music is really nice and makes you dance. The whole trip was nice and from now on Izmir is from my first destinations in Turkey. The most remarkable thing in Turkey it was the hospitality and the willingness of the Turkish people to help you and to make you feel like you are at your home. Also they always tried to satisfy our desires and finally the thing that I liked very much it was that their houses were colorful. What I really liked in Turkey was the hospitality of people there. Furthermore Izmir was a city full of monuments that someone can visit and activities to attend. What I really liked in Turkey was their houses, their traditions and their habits. The children and the parents were very kind with us. Also I liked the food. I have never tasted the Turkish food before. The sights were gorgeous. I met a lot of different people and I made many good friends. The journey at Smyrna was a priceless experience for me. It gave me the opportunity to meet a different culture. 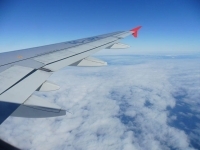 I travelled abroad for the first time and this was unforgettable. I stayed for one week at the house of a family that lives there and I had the opportunity to learn about their habits, their customs, their daily routine and associate with persons of my age. I met students of other nationalities. 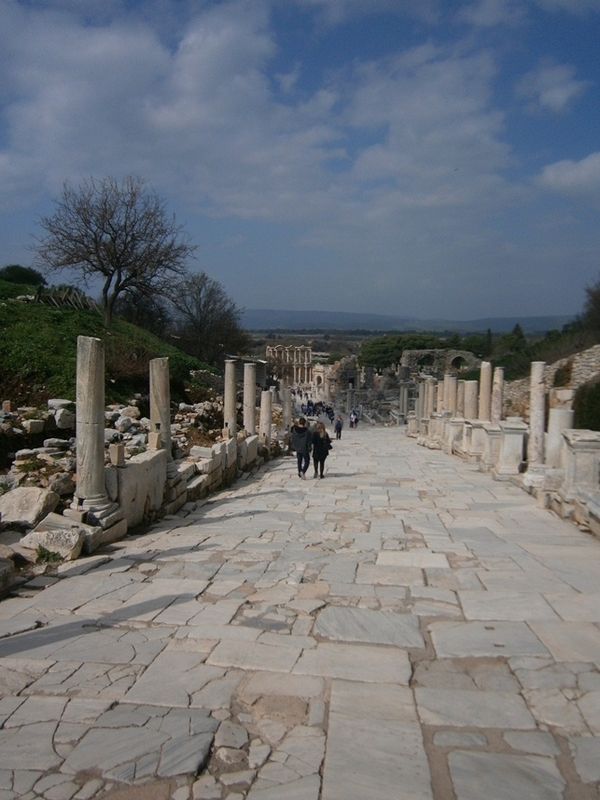 I visited the wonderful city of Smyrna and other regions such as Ephesus and Pergamum. I tasted the local cuisine. The hospitality of the family was amazing and from the first time they tried to make me feel at home. Everything was excellent and I really hope to visit Smyrna again! Going to Turkey was just the best thing it could happen to me!I had the warmest welcome from the guys and the hosting family. Turkish guys are very very nice, friendly and really sociable. Elif my hosting partner student is a very nice girl, a smart one and very affable. Her family was very open and generous , made me feel at home. Elif’s parents are excellent cooks. I really like their food, they are so good!!! The meeting program was just great and we could also meet with the other partners and have fun. 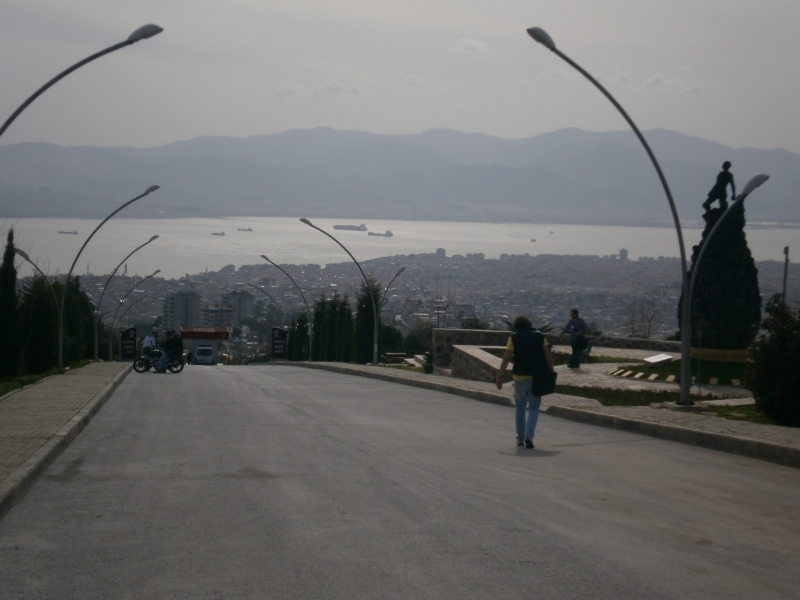 Izmir is a big, beautiful city. 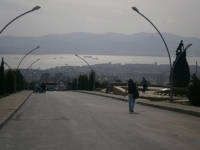 The visits outside Izmir have been very interesting, the places we visited were just amazing. Turkey is really a nice city and I hope to go back in the next future. It was my first time abroad and I was very lucky with my hosting family in Izmir. They were very very nice. I did something that I did not know when I went to my partner’s house. I didn’t take off my shoes in the house and they told me that I had to walk in the house without shoes. We don’t do that in Italy. But now I know that in Turkey I have to take off the shoes in the house. My hosting family was very very nice. I had a good time in Izmir. I went out and visited many places. The food are very good. It was a great experience. I visited many interesting places. I could practice English language. My hosting family was great. I hope my partner comes to visit me in Italy. I invited him. He is very nice!!! It was very interesting to compare our traditions and cultures. Turkey has made me think a lot on how big the world is and how it changes everything from country to country. I had good time with the hosting family. 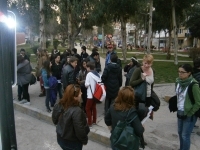 I liked Izmir, I liked to be with all the students at the meeting, I liked all the programme activites. Turkish people are very respectful and nice. The food are good! The people are good! I really enjoyed my stay in Izmir. It's a beautiful place to travel to. I think that I am so lucky because my host mate, Atahan, was very welcoming and nice. And not only him, also his family. Now I still remember the first day, when the Spanish team were in the bus, I could see my host family. It was an amazing moment!!!!! I also liked it when we saw the performance in Tepekule. It was really enjoyable!!!! I think now that I've had the time of my life. All the Comenius teams were really nice. It was a good experience because I could learn a lot of Turkish words and music. I have changed my mind about Turkish people because I realised that there are not many differences among us. I learned about a new culture and about its history, too. My host family was very welcoming and very nice to me. I will never forget all the people that I met during this meeting. I have changed my mind about Turkish people because they are nice people and they welcomed me as if I were a member of the family. I will never forget the people I met in Turkey. I have learned that we are all similar. I liked Turkish food and all the Turkish dances that students performed there. I learned that Turkish people are more welcoming than Spanish people. They also eat a lot and they can't walk on the carpet if they are wearing shoes. I liked "Shemame" dance and I made very good friends. I hope I can come back to Turkey someday in the future. My hosting family hosted me very well and I've totally changed my mind about Turkish people, they are very nice! The food was a bit strange in my opinion. 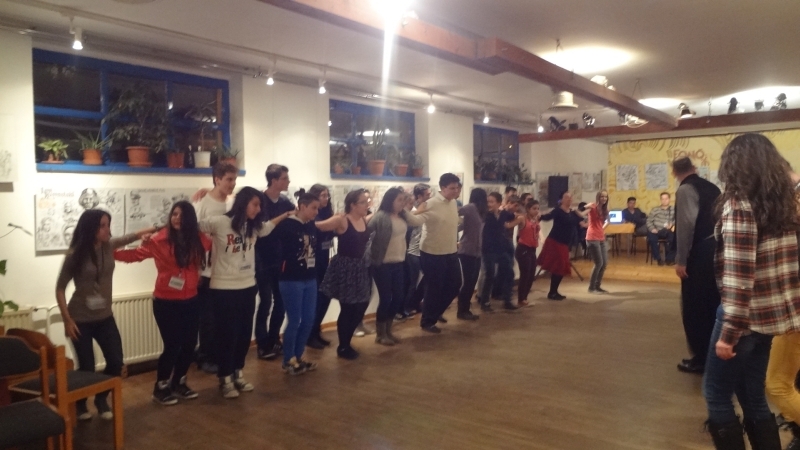 Turkish people taught me how to dance different Turkish dances and I met people who I will never forget. 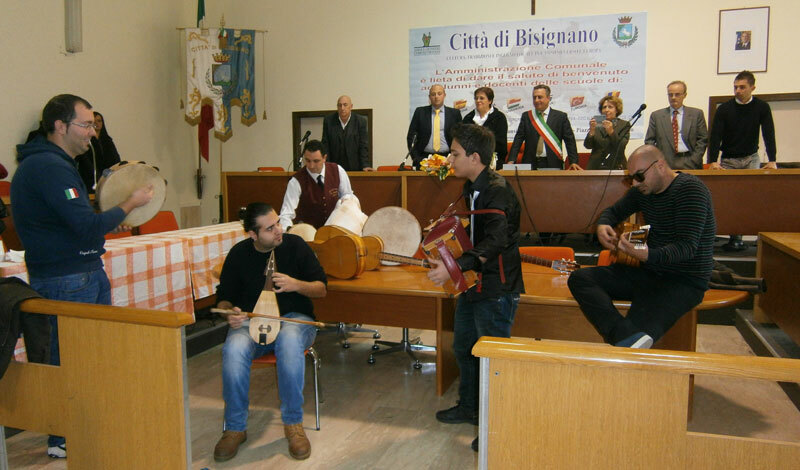 I loved Italian music, especially "tarantella" dance and I really liked the way Ovidiu, the Romanian boy, played the guitar! He plays incredibly well!! We all had a great time singing together in the coach. 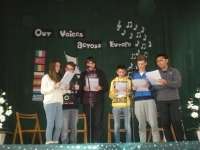 I would also like to thank David and all the Comenius students for singing "Happy birthday" to me. It was an unforgetable birthday!!!! Thank you!!!!! I have totally changed my mind about Turkish people. They treated me as if I were at home. I didn't like the fact that they didn't respect traffic rules! The food was a bit strange but I learned a lot of things about this country, for example what people dance in a Turkish wedding. I loved to spend and share time with people from other countries and we had a great time altogether singing in the coach. We also learnt some words in Turkish, for example "tessekkür ederim". At first we have to say thank you for the Turkish team for this fantastic organisation and the programmes. We were absolutely lucky with the hostng families. They were kind, careful and looked after our students as they had been a member of their families. Families were open and flexible and organised extra programme for the kids in their free time. Our students learnt a lot about the way of life in Turkey and it was interesting to see how life is going in a muslim country. The programmes were well prepared, everything was well organised and punctual. We enjoyed the trips and the sightseeings. With the tours we had a chance to get to know the ancient culture of Turkey, that we had learnt before during our history lessons. Another strong point of the meeting in Turkey was the way how and where the meals were served for us. These meals were amazing. The introduction of the school was interesting for us, but we could have learnt more about the educational system of Turkey.We were looking forward to the programmes in connection with the project. We hoped for more work, but the idea of creating the chorus of the anthem was great. 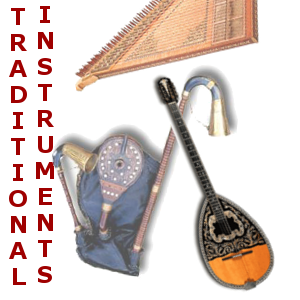 The only thing that we found less successful was the introduction of our national and traditional musical instruments. On the whole we think the meeting achived its goal. 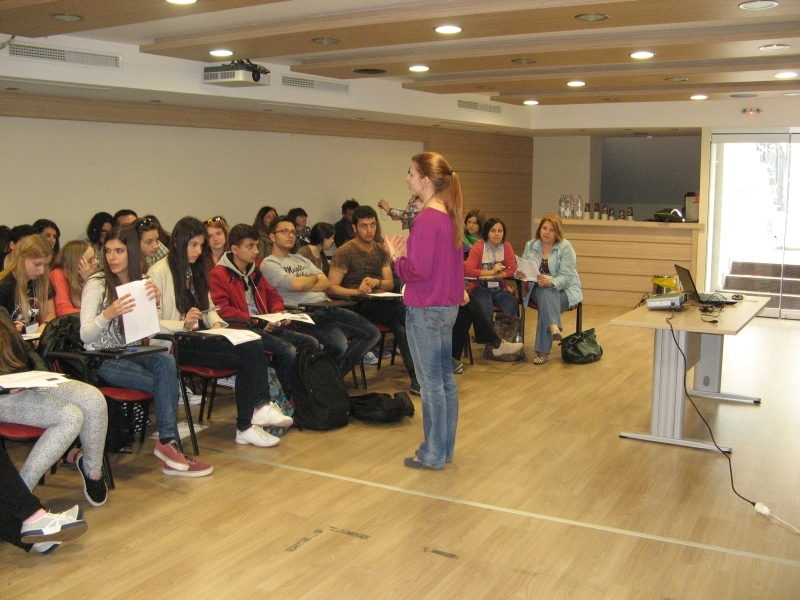 The students had opportunities to use English for communicating and to learn Turkish to improve their skills. They met cultural differences but learning and tolerating them is one of the aim of this project. Az angol Comenius projekt második utazására a Törökország ázsiai részén fekvő Izmirben került sor. Az itthon töltött utolsó éjszakán és a pakoláskor érzett izgatottság természetesen egy kis idegességgel keveredett, de amint megérkeztünk és találkoztam a fogadó-családommal, ez az érzés köddé vált. Azonnali öleléssel, egy-egy puszival köszöntöttek, a partneremmel pedig rögtön tudtunk beszélgetni. Kommunikációs problémák persze adódtak, de ezek elhanyagolhatóak a megannyi csodálatos pillanat mellett, amit ott átéltem. Történtek vicces esetek, mint például első nap véletlenül nyersen kóstoltam meg egy ételt; jártunk szebbnél szebb történelmi helyeken meg persze a régi nagy bazárban is, ahol az árusok örömmel fogadtak és rögtön rávágták, hogy „Szervusz, köszönöm, Puskás”, mikor megtudták, hogy magyarok vagyunk. Egy teljesen más kultúrát volt szerencsém megismerni, különleges, de annál finomabb (és csípősebb) ételeket kóstolhattam meg, különféle nemzetek diákjaival kötöttem barátságot, melyekből olyanok is vannak, melyek talán örökre fennmaradhatnak. Egy biztos, de talán mondanom sem kell: ez az egy hét számomra felejthetetlen marad. The second meeting in this project was in Izmir, on the asian part of Turkey. I was excited and a little bit nervous as well but as soon as I met my host family, I relieved. They welcomed me with a hug and my partner and I could talk immediately. Of course, there were communication problems but it doesn’t matter because we had a wonderful time there. Funny stories happened, like I tasted something raw on my first day; we were at picturesque historical places and we went to shopping to the Old Bazar where all the sellers were kind and they said „Szervusz, köszönöm, Puskás” as soon as they heard we’re Hungarians. I’m lucky that I could visit this culturally different country, I could taste special but really delicious (and spicy) foods and I could make new friendships with students from different countries and maybe, some of them can be had forever. I think I don’t have to say: this one-week trip is unforgettable for me. Úgy nézel ki mint egy török lány! – ezt jópárszor hallottam az Izmirben eltöltött egy hét alatt. Csodálatos délutáni napsütés fogadott minket, amikor vasárnap leszálltunk. Az időjárás egy nap kivételével kellemesen tavaszias volt, jó nagy adag D vitamint sikerült feltankolnunk. A törökök nagyon kitettek magukért fergeteges programokkal készültek, így egy percig sem unatkoztunk. Voltunk Efesben, Siringében, Pergamonban és természetesen Izmirt is bejártuk. Sokat megismertünk a török kultúrából, de csak elméleti szinten, ugyanis annak ellenére, hogy Izmir Törökország ázsiai részéhez tartozik az emberek kifejezetten nyugatiasak, még - számításaink ellenére - fejkendőt sem kellett kötnünk! Habár a közös nyelv gyakran hiányzott, az emberek nagyon kedvesek, segítőkészek, kézzel-lábbal mutogatnak, csak hogy segítsenek három, a bazárban eltévedt magyar lánynak eljutni a mecsetig, vagy éppen Izmir jelképéig, az óratoronyig. Fogadócsaládjaink meleg vendégszeretettel, sok-sok izgalmas étellel és tömérdek ajándékkal árasztottak el minket. A hét országból összegyűlt diákokból jó kis csapat kovácsolódott össze, és egyik este sem hagytuk ki a szervezett programok utáni teázást vagy sétát – így is meghosszabbítva az együtt töltött időt. Távozásunkkor a fogadóbarátaink egészen a reptérig kísértek, ezzel gyarapítva a könnyes búcsúpillanatokat. Bár az élmények felejthetetlenek, a legértékesebbek és legmaradandóbbak a szoros, életre szóló barátságok, amiket itt kötöttünk. A visszatérés és viszontlátás tudatában néztük a távolodó várost a repülőgép ablakából. You look like a Turkish girl! – I heard this a lot during our week in Izmir. We were greeted by a wonderful, sunny afternoon, when landing in Izmir on Sunday. The weather was mostly pleasant, so we could charge ourselves up with plenty of D vitamin. The organizators really impressed us with all the amazing programmes and activities, not allowing us to get bored, not even for a minute. 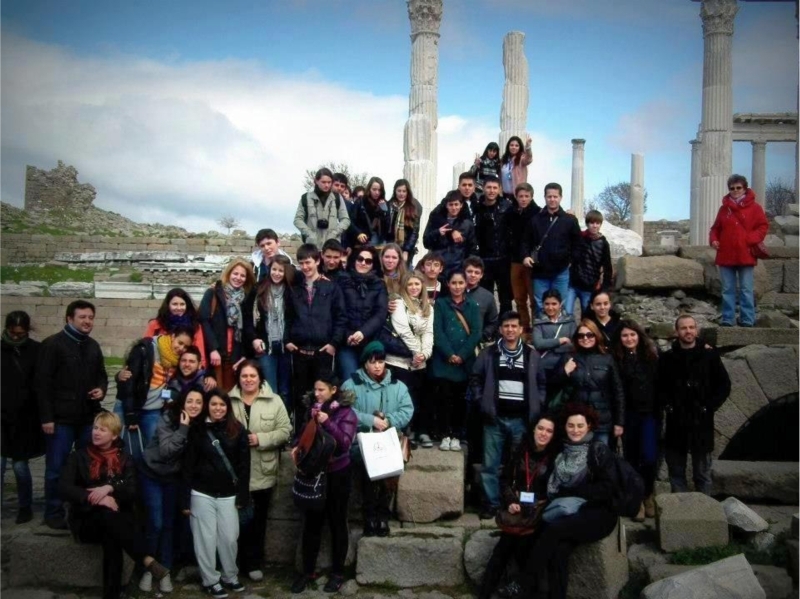 We visited Efes, Siringe, Pegamon and of course the beautiful city of Izmir. We learned a lot about Turkish culture, but found ourselves really surprised, because despite the fact, that Izmir is located in the Asian part of Turkey, the atmosphere is quite western. Although there usually was no common language, the people on the street were really nice and friendly, and did everything, to help three Hungarian girls, lost in the bazaar, find the mosque or Izmir’s symbol, the famous Clocktower. Our host families overwhelmed us with their kind hospitality, exciting meals and many-many gifts. The students from the seven countries got along really well, forming a really good team. We used every night after the programmes doing something together, in order to lengthen the time spent with each other. On the day of our departure our hosts even accompanied us until the airport, multiplying the number of tearful moments. Of course the experience is unforgettable, but the true and life-long friendships we made here are the most valuable souvenirs of this trip. We left Izmir with the hopes of returning and reunion. I had a great time in Romania because it was amazing to meet people from other countries and make new friends. 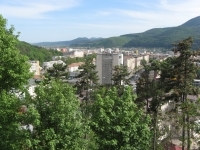 I really liked Piatra Neamt because it is a small town. 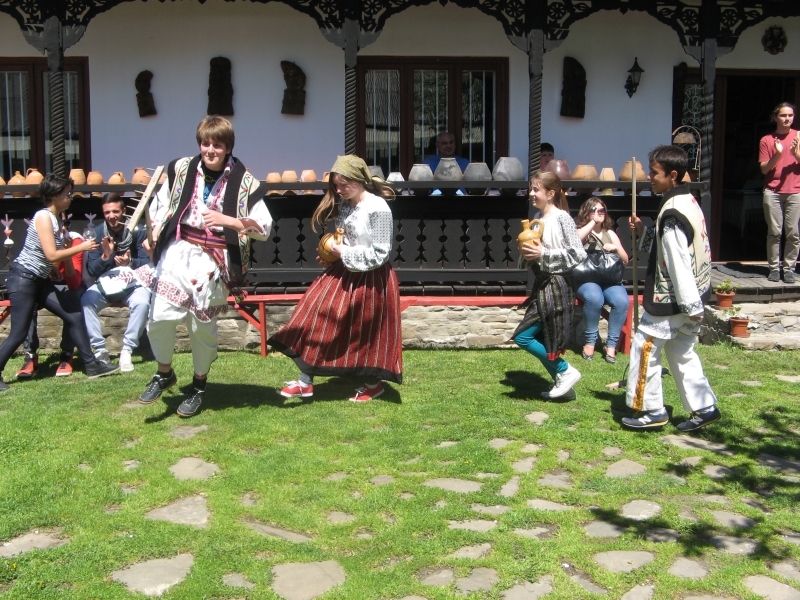 I specially liked the visit to a traditional Romanian house where Marc and I danced a traditional dance with the traditional Moldavian costumes. It was geat fun!!!! The Romanian family where I lived were very kind to me. 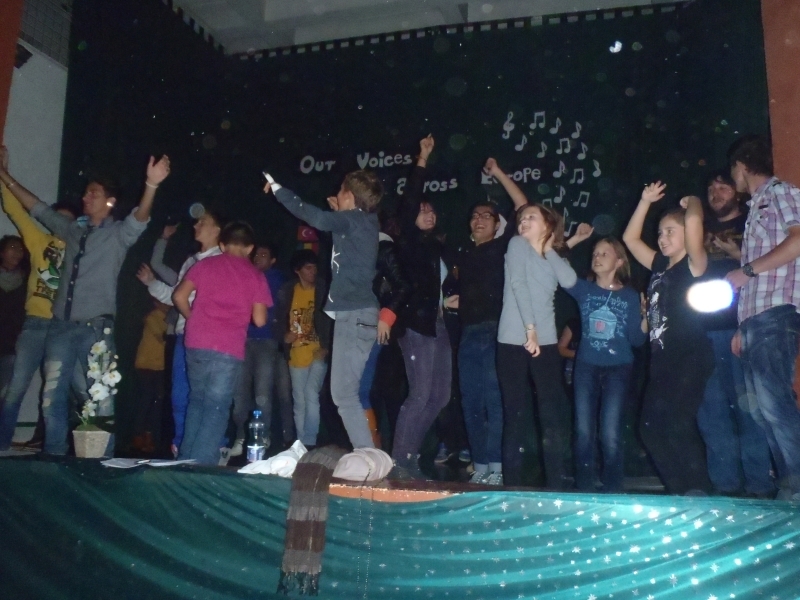 It was very funny when we danced "La Masovera" together with the Romanian students. I will never forget the meeting in Romania. I liked Romania because I met a lot of nice people. The house where I stayed was very nice. The most amazing thing is Romania is the Parliament in Bucharest. My favourite trips in Piatra Neamt were Neamt Citadel and the Red Lake. The landscape that could be seen from the telegondola was amazing. The food was delicious and I realy liked "ciorba". The family gave me a lot of nice things like a bag and a lot of souvenirs. Thank you very much!!!!! Romania was an amazing experience. I liked Romania because it is a very beautiful and rural country. Piatra Neamt is very small but very nice. The food is delicious!!! The Comenius students were very sociable and kind. I really had a great time with them. The family where I stayed was very traditional and always met their friends and relatives. They also ate really traditional dishes. I am really grateful to Sergiu and his family. I also visited Bucharest and I enjoyed the visit in the Parliament. I was very happy in Romania. I hope I will be able to go back to Romania in the future. I like Romania because the people were amazing. The country was very beautiful and rural. The concerts were awesome!!!! The students played so well. The family I lived with was very kind and I felt as if I was at home. I had a great time with the Comenius group. It was like a big family. Piatra Neamt was a surprise for me because I thought it was going to be smaller but it was really great!!! I will never forget this trip. I liked Romania because the people were very kind. The house where I stayed was very big and the family was very nice and quiet. My family was very funny. I had the chance to try some traditional food, for example the meat pie with vegetables, the pork I had in Bucharest and the typical soup called "ciorba". My family gave me a lot of gifts and took me to the telegondola. Thanks a lot!!!!! Our stay in Romania was full of excitement and I must say that I really enjoyed it. Everyone was very nice and they wanted to make friends with one another. The family which hosted me and Megan was great and we became friends. In Romania I learned a few phrases in Romanian and a few words from the other countries languages. I found out a little bit more of how to dance other countries' traditional dances and I met a lot of new people. After a long journey, we finally got to Piatra Neamt and we had a chance to meet our hosting family.I have to admit, our family was fantastic. They also had a lot of pets at home :) I really liked the works of arts we had a chance to see at school. I met a lot of great people and it was a marvelous experience. Thank you Romania. I really enjoyed our trip to Romania. I met a lot of fantastic people. My hosting family was great. I got to know a lot of Romanian customs and traditions. I also found out new things about this beautiful country. This trip is unforgettable to me. I enjoyed the time I spent there, from the adventurous arrival to the moment of the farewell. My host family waited for me with a lot of love, they took care of me. My partner and I got along very well and we had a lot in common. I met a fantastic girl and I am grateful to her. There were a lot of fun in my team and I met many friendly people. I hope I will meet them again. We discovered a beautiful part of Romania, we had the chance to see the school and meet many talented students who can draw or paint wonderfully. They can also play a lot of musical instruments, and I have to admit that I was very jealous of that. 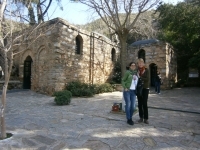 We visited the local museums and the historical places together and we also heard a lot of interesting facts. 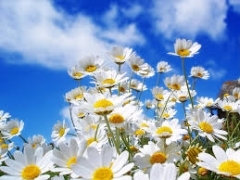 The weather was pleasant and it accompanied us with shining sunlight. 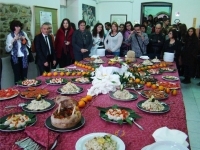 Various traditional dishes to taste, and even a local "egg game" were taught to us. I met wonderful people and I returned home with lots of memories. I will miss Piatra Neamt!! Thank you for this week that I could spend with lovely new friends :D When I caught sight of my partner, Delia I knew for sure that we will be sisters for a week. Her family is very hospitable, her mother cooked for us a lot of delicious food. All of the children sang I will survive on the bus when we went an excursion, and I will never forget this. Every night we went out and had a party together. The last day was the best, because we saw some beautiful mountains and the Red Lake. We were shopping for a couple of funny souvenirs from some Transylvanian vendors in Hargita. We were taking a lot of pictures with our new friends. I learnt some new words in Romanian like mulțumesc and la revedere. I did not want to come home because this was one of the best weeks of my life. But I discussed it with my new friends that we will certainly see each other. In the beginning of May we visited Romania thanks t`o the Comenius project. It was an unforgettable experience for me. I became richer with new memories that I will never forget. I met new, interesting and wonderful people and I found friends for life in them. Romania was very enchanting with its nature and the people that live there. 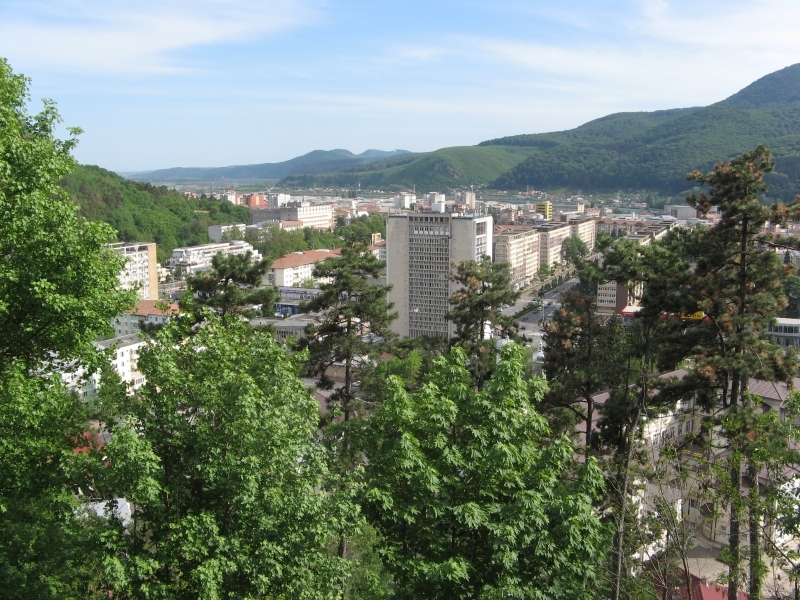 We stayed in a city called Piatra Neamt, which is a beautiful place located beneath a mountain. My host family was really kind and loving. They made me feel like I was at home. There were some programs that were really interesting. 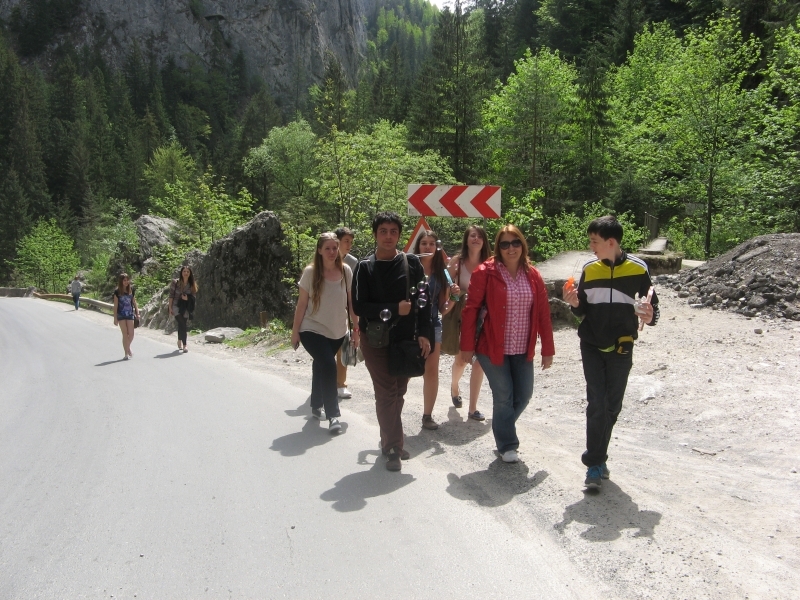 We visited the Red Lake, The museum of history and of course we got to see the Romanian school. I was stunned by how talented these kids are. I had tons of fun with the people of other countries, we got along really well. 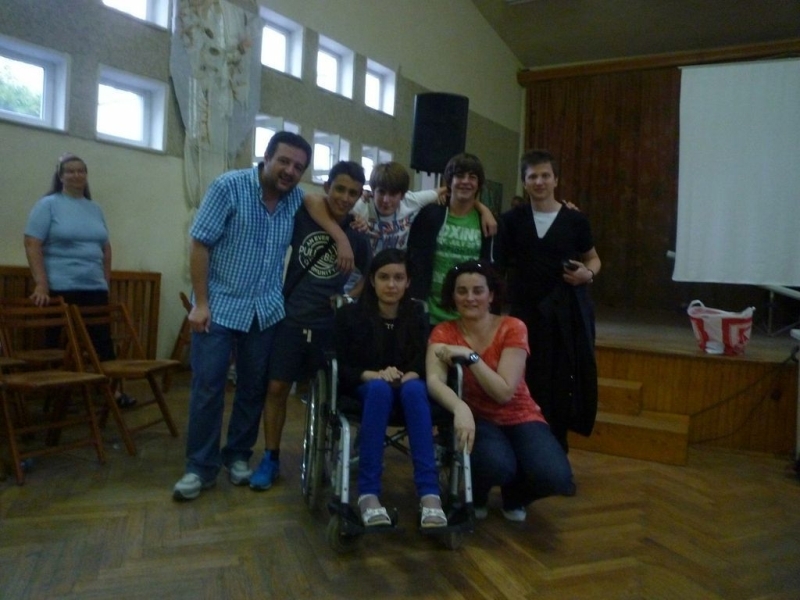 I could talk days long about my experience in Romania, but I have to be short :( Altogether, it was wonderful. The meeting was very important to me because I made new experiences. The Romanian Parten was very kind and affectionate with me. We shared the same room like two sisters as if I was one of them, they spoke mostly in Italian because they were in Italy. I really loved the dish made with potatoes and mushrooms. I was struck by the great affection they have towards Italians. I've enjoyed all the visits scheduled for this meeting, I hope to go back there with the Erasmus program because I left my heart, I will never forget the people of Priatra Neamt. I thank the family and especially the family MAIDAN Sabina and Tony. When I arrived at the hotel I found Toni, we introduced ourselves and told me you stay with me in my house.. We took the bus to his house. I shared the same things and the other host guy was from Poland, we get along well and on the weekend we went to Red Lake. The family has been careful with me, and very kind. In few words I was fine with Toni, who introduced me to her friends Julia, Elisa, Michela, Paola, half Italian and half Romanian, they know how to sing and play very well. And many other boys, and was a very nice experience because we were really good, we stayed 5 days but as if we knew all along. I love you Romania, Pietra Neamt. It was a very nice experience . My host family was very attentive and nice. We shared many things with my partners and with the other guys I met. We went out together to eat and see the city. 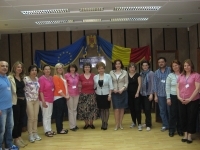 I liked all the activities of the program of the meeting and I really think to go back to Romania. It was a very good experience for me because I had the opportunity to know better Romanian people and Romania and also it was good to meet again the other partners the partner. What I remember of this meeting is the affection of Romanian people. Hi! Romania trip was wonderful. I was abroad for the first time. I enjoyed the activites a lot. The school is different from our school. It was full of music and arts.I liked it. My name is Aysegul. The Romania trip was perfectly fine for me. I've learnt a lot of things in Romania. I won't forget about this trip. The Romania trip was very good. I liked my host family and my host friend.They were very kind. 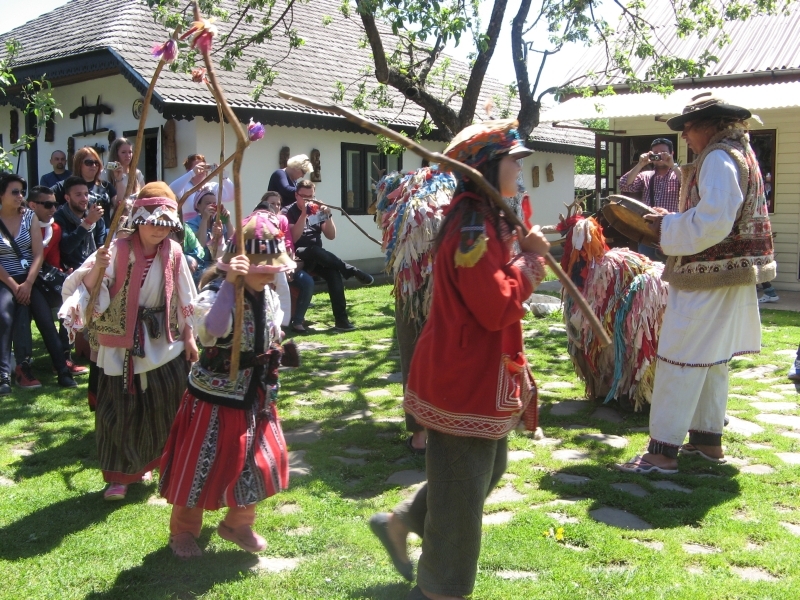 I learned about the the life style of the Romanian people. The trips were great! To be honest I wasn't really expecting that, I mean when I was in Romania everything was perfect and I felt like that trip was an open invitation about friendship,music and culture I've got a lot of memories from there. First of all I've got some new friends and I think friendship is something eternal like music, The buildings were really awesome and the atmosphere in Romania was beautiful I'm so glad to be in this project and I want to say thank you to all people who were in Romania with us. I liked Poland and the Polish people I met. I made a lot of friends from different countries. I felt as if I were at home with Patryk’s family. They are very nice. My favourite food in Poland was a type of bread that is similar to a brezel. I learnt a lot of things in Poland. 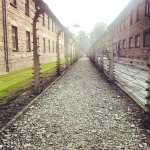 I liked Auschwitz but at the same time I felt very sad for all the people who suffered there. I liked Krakow too. One of the things I remember is the trumpet player in the tower and the dragon. My favourite activity was a theatre activity that we did the last day. I really enjoyed this trip. I would like to come back to Poland in the future. 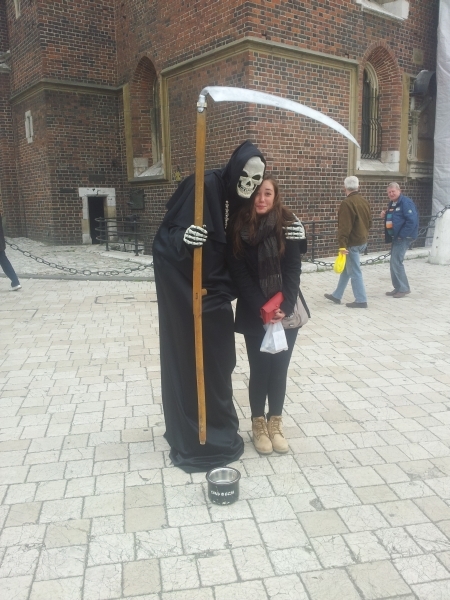 In Poland people are very friendly. Aga’s family is very nice and welcoming. 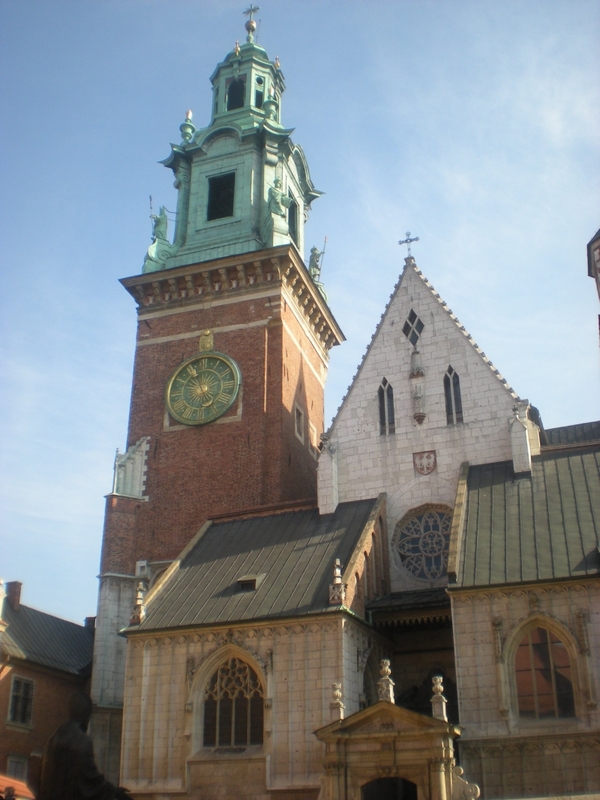 In Krakow we visited Wavel Castle and the Old Town. The streets in Krakow are very quiet and full of horses pulling carriages. In Zabrze we went bowling with all the Comenius friends. I would like to come back to Poland soon. I will never forget this trip. 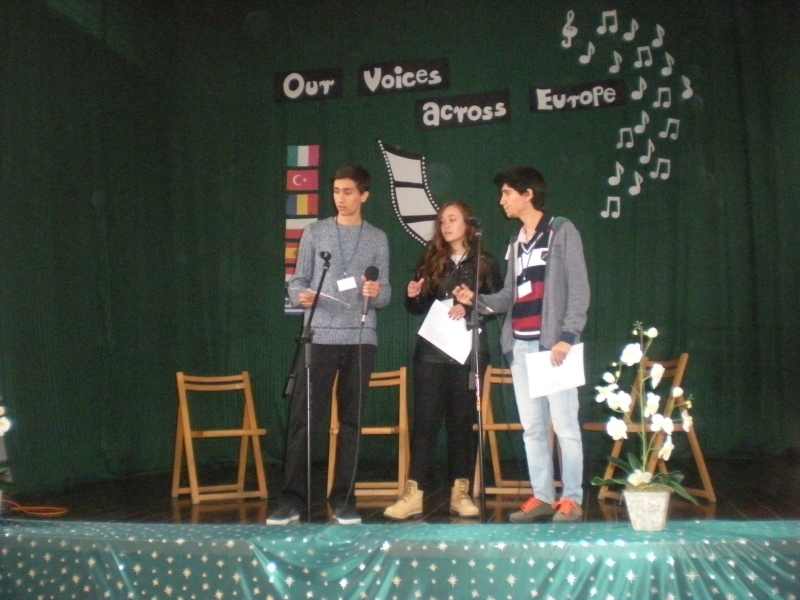 My favourite moment was when the karaoke finished and all the Comenius friends danced together in the school. I really liked the trip to Poland. Aga and her family were really welcoming and we had a great time together. We made a lot of friends from Poland and other countries. The food in Poland was really different from the Spanish food but in my opinion it is better than ours. 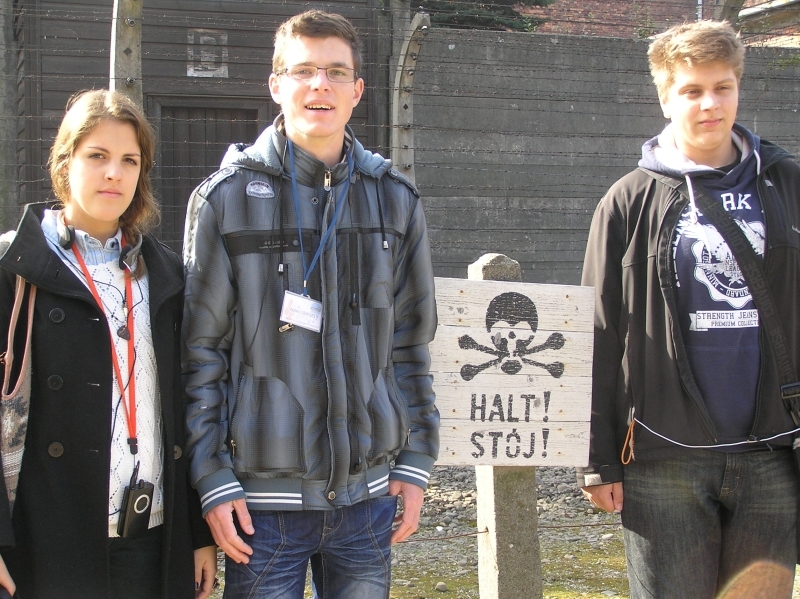 Speaking about Auschwitz, judging from my experience, it was a real shock for me. As for the trip to Krakow, it was a very beautiful city with lots of horses pulling carriages on the streets. We also visited the dragon’s cave and Wavel Castle, which I really enjoyed. All in all, it was an unforgettable trip. I really enjoyed meeting people from different countries. Patryk’s family was very nice and we had great fun together. I really liked those nights when we played computer games like FIFA. The food in Poland is different from Spanish food. Krakow was really beautiful, above all the old streets and houses. Visiting Auschwitz was a real shock for me. I don’t know why the Nazis did that to people. We should respect each other because we are all equal. In Poland people are quiet. We are more talkative and we usually speak louder. I think that it was a great experience for me. Kasia’s family, my host family, was very welcoming and very friendly. The food was different from Spain, however, I liked a type of bread we ate in Krakow similar to a brezel. Krakow is a very beautiful and quiet town. I loved the cloth market and the huge square with a lot of horse pulling carriages. The visit to Auschwitz was really interesting but it was a shock for me since this part of the history was terrible. If I could, I would like to come back to Poland. Thank you for everything. I had a whale of a time! I think that it was a very positive experience because the family that hosted me was very kind and hospitable. I had a great time there with many people from other countries. Poland is very different from Spain and people are very kind and polite. I visited the Old Town in Krakow and I think it is very beautiful. When we were in Krakow, we visited the cloth market and the tower with the trumpet player. I really liked it!! 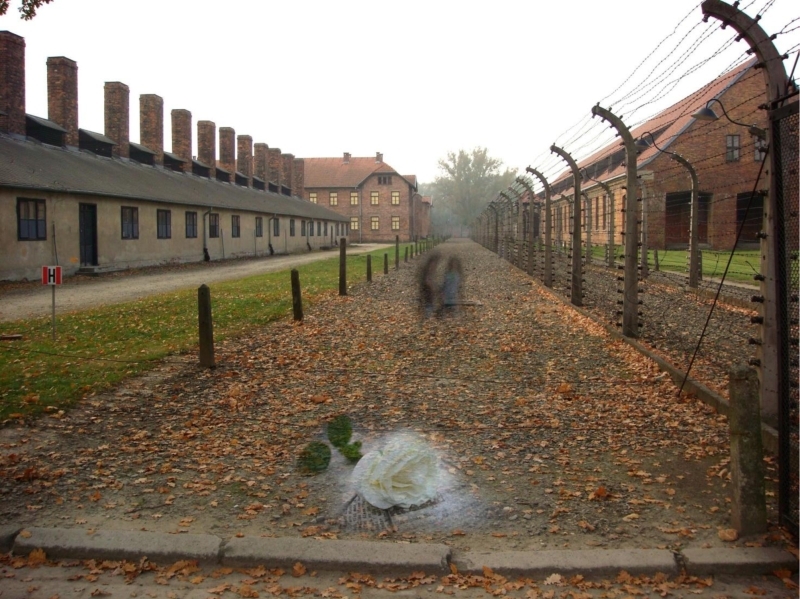 Besides, I remember Auschwitz as it is a very shocking visit and it made me feel very sad. Finally, I can say that this experience has been very nice because you get to know many people from different countries who can become good friends. I would like to thank Kuba and his family for these days and to Patryk for the party we had the last day. It was awesome!! Poland was amazing! The town which impressed me was Krakow. The buildings have got different architecture compared to that of Greece, but I liked it very much! Thanks to this trip I learned many things about the civilization of this country, the culture and the way they live there. 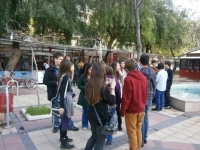 Everybody there was very friendly and we have very good relationships with the students we met! I had a great time in Poland and I hope to meet them again in the future! Poland was a very interesting place and I will never forget this experience!!!! Poland. Even the sound of this word causes me feelings I can’t describe! When I arrived I thought that it won’t be a pleasurable experience but I was wrong. It was awesome!! Everybody there was friendly and polite, even the teachers were funny! I met crazy people there ;) and I made a lot of friends!!! That’s an example why we shouldn’t be racists. My favourite city was Zabrze. I had a great time there and a lot of fun. The town’s structure was much different than Arta’s . I had an amazing time in Poland and I will definitely visit this country and my friends again there in the future. I will never forget Poland. Poland was an incredible country. My favourite town was Krakow. I had a lot of fun there and I saw awesome historical sites! What impressed me the most was an old church because in it the kings of Poland were buried. The school was awesome. What impressed me the most in school was the door bell :D. I had a wonderful experience in Poland and I want to visit this country again and meet the friends I hung out with. I think this meeting was very funny and nice. I met lots of new people. In my house Laura Bejarano was staying and now we are friends. 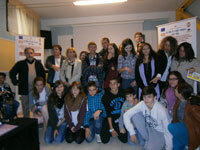 I had a very good time with my comenius friends and I really would like to take part in next mobility. I learnd lots of new words. 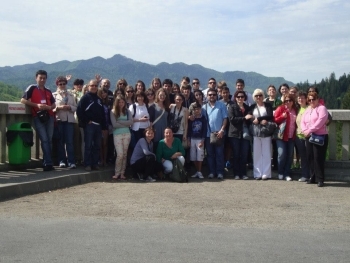 I miss my comenius family :). The meeting in Poland was a great experience for me. I met lots of great people from other countries. I had four people in my house and I liked that very much. They were so nice and we talked and laughted a lot. I learned some words in Spanish and Romanian. I enjoyed all the week but Thursday was the best. In the morning we saw the film. Then we made projects about that film. After that we went for lunch. When we came back to school we had theatre lesson. It was great. We had to do lots of theatre tasks. We were showing emotions like animals and playing with some special subjects. It was fun.Then, we ate something from the grill and after eating we had karaoke. Each country was singing. After karaoke we played music and danced. Aftre that we were taking lots of photos and everybody was crying. It was the best week ever!!! At my home stayed Bianca and Tinna.They are fantastic girls and I love them a lot. I miss you so much!!! Our trip to Auschwitz was interesting but sad. It was also quite cold. I really liked th trip to Crakow, it was fun and the weather was nice. On our last day, exactly on Thursday we had a Karaoke, I liked it. 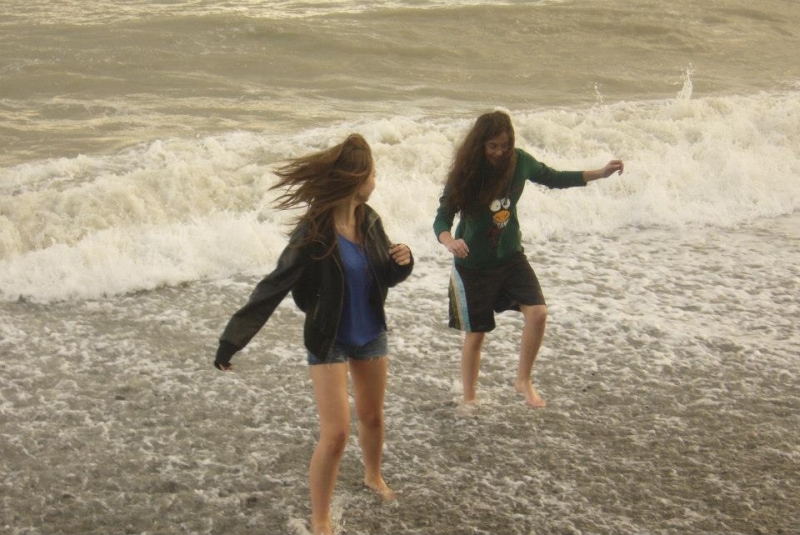 I also remember the time spent in Platan - it was very funny. I never forget this week. All the students are great and fantastic. I miss you a lot!!!! On Saturday I met Spanish and Turkish teams. For one week I lived with Joel from Spain, and with Halil from Turkey. 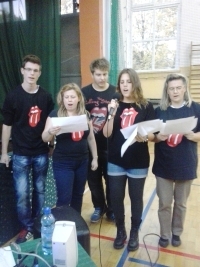 On Monday we were in school we presented our presentetions and we sang songs from movies. After school we went to restaurant Pod Wawrzynem for dinner. At 4 pm we had free time so we went to the city centre to play bowling. Next day we went to Oświencim, it was very sad trip. 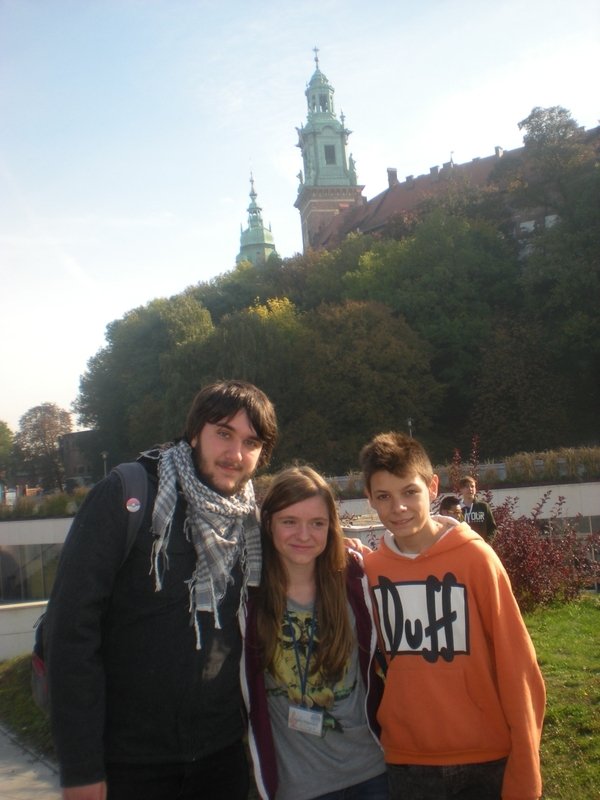 On Wednesday we went to Krakow.. We visited the castle and the cathedral. It was the best trip for me. On Thursday we were in school. We made posters about film we had seen before. After dinner we had karaoke. On Friday we had to said goodbye to our friends because they had to come back to their countries. I miss all of you a lot!!!!!!!! Hi. I'm Martyna and im from Poland. Last week all comenius partners came to my country. I was very happy because I could meet new people . We took a lot of funny and crazy photos. We were in Oświęcim and Cracow but last day we spent at school . I think this Thursday was the best Thursday in my life. We had a disco where everyone had a great time. We listened and danced to a lot of music. For me it was an amazing experience . I have never experienced so many great moments in one week . I really hope we will all meet again. I love you all my comenius friends. I think the Comenius project is a good idea. We can meet different people. 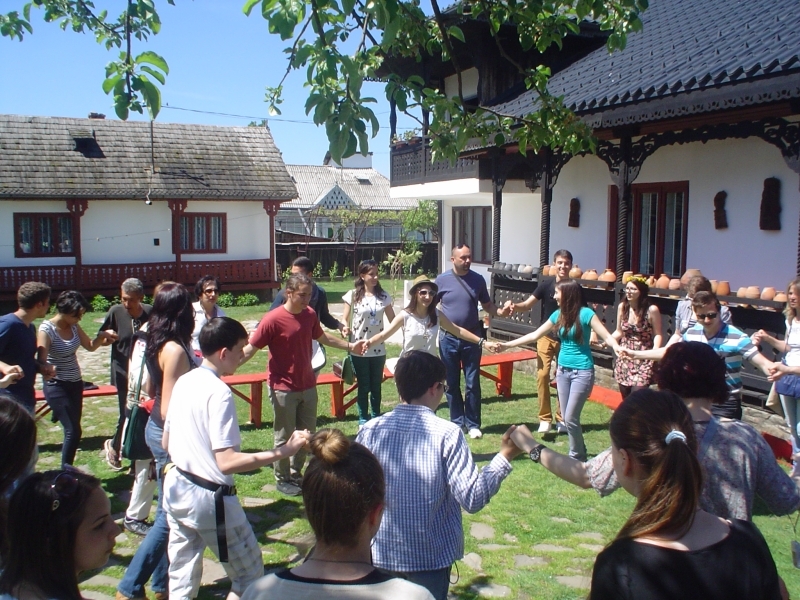 In this project we can learn something about people and traditions of the other countries. 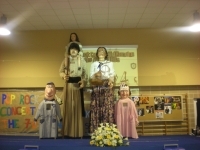 People from Comenius can learn about Polish traditions. We learn English because we must speak to people from Comenius in English. People from Comenius who lived in my house said Poland is beautiful and Polish people are very nice. The Comenius meeting in Poland was really great. We had a lot of fun and we could learn English. I have met a lot of fantastic people from 6 partner countries. I hope that in the future there will be again such an exchange. The trip to Poland was a beautiful experience for me. I made new friends, I met people from whom I had a lot to learn .We visited full of emotion AUSCHWITZ - BIRCHENAU and the Polish Kings‘ Castle and of Pope Paul II. I was impressed and I would like to live this experience again. I had a trip on the route Brasov- BUDAPEST - Breclav (Czech Republic) - Katowice-ZABRZE. The trip was very tiring, but once arrived in Poland our hosts greeted us, my host Megan Sojka with her mother Beata and her sister Jeanette were an ideal family. They made my visit in Zabrze the most beautiful and I would like to thank them from the bottom of my heart. We laughed together, we had fun and we had many happy moments and when leaving, there were tears. I'm glad I got engaged in this experience, and if I had an opportunity I would do it again. 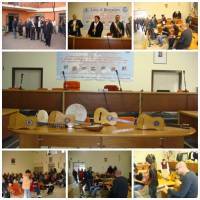 The "Comenius" project gave me many opportunities. I saw beautiful places, I met people from other countries with whom I have shared their way of life, their educational system, the way they live and have fun. Another special moment was visiting the old town of Krakow. My participation in this project was also an opportunity to make new friendships with other children from other countries, so strong that in our circle we called each other” brothers and sisters”.The most special moment and the most full of emotion was our visit to the Auschwitz Memorial. The Comenius project gave me the chance to visit Poland, a country that I have never imagined I would know so closely, whose history is unbelievable, whose customs are totally different from the Romanian ones. A place that I will never forget and that I was really amazed was Auschwitz, a place filled with so much sadness and sorrow. I hope it will remain forever in history and in the memory of mankind. In Kracow I was impressed by the medieval architecture combined with modern one. This project gave me the opportunity to meet new people and I have even made new friends of different nationalities, the teachers were very open-minded, having lots of initiatives - that has really been a pleasure, the hosts were very welcoming to us. Thausands of thanks to the managers of the the Comenius Project for this unique experience! It was a great pleasure for me, and if I ever had the opportunity to visit a country, I would definitely choose Poland. I am very glad that I have chosen Poland .It is a beautiful country, full of color, traditions and culture. I had truly beautiful moments, I have built friendships, and I saw how you can have a very knit connexion with teachers and hosts. A very touching spot was Auschwitz, with a heavy atmosphere, full of history and life stories. There is a saying: Those who forget history, are condemned to repeat it. This place showed us that what happened there is unforgivable and we must learn from it, to avoid repeating it. 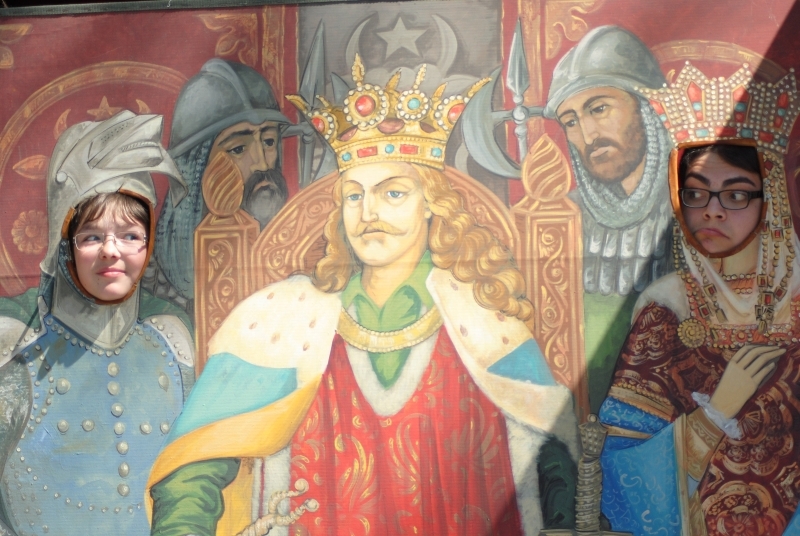 Krakow, a special city, full of magic and kings’ and queens’ stories. I liked the most the atmosphere, the city musicality. The Sf. Maria Cathedral was quite surprising, great for the history it treasures. The statues were carved magnificently, that you had the impression that they were looking at you. It will be an unforgettable experience, and I hope that over dozens of years I shall tell my grandchildren all about that unique adventure in Chopin’s country. The Comenius project is a unique opportunity in a lifetime, an experience that I have enjoyed and that I recommend to everyone who wants to travel and experience new cultures. For me this European project was an opportunity to discover the customs and traditions of Poland and also, it has been an opportunity to travel, to enlarge my group of friends and broaden my knowledge. As about my host, I can say I was lucky, because they have welcomed me friendly and made me feel at home. 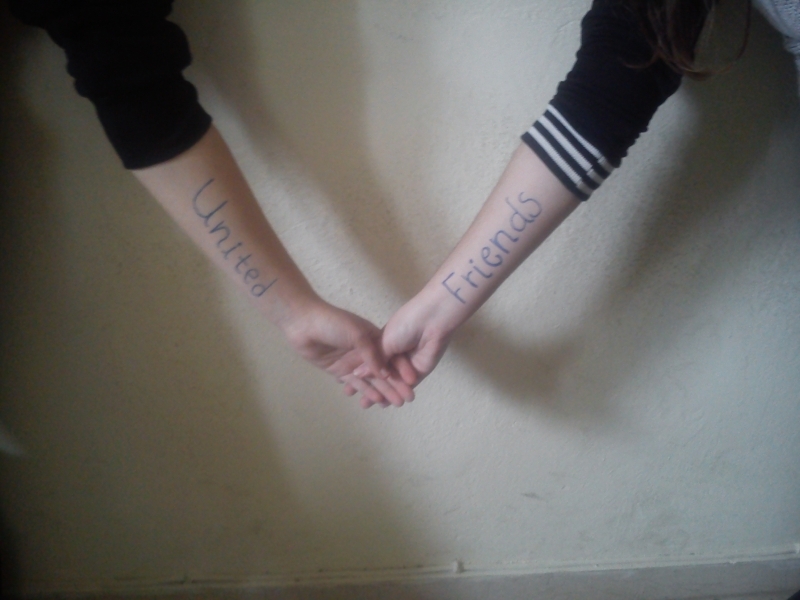 We remained friends and we communicate every day. Of course, the great Auschwitz Museum and the city of Krakow impressed me. It was a great pleasure to participate in this project and after this experience I would like to visit Poland again. 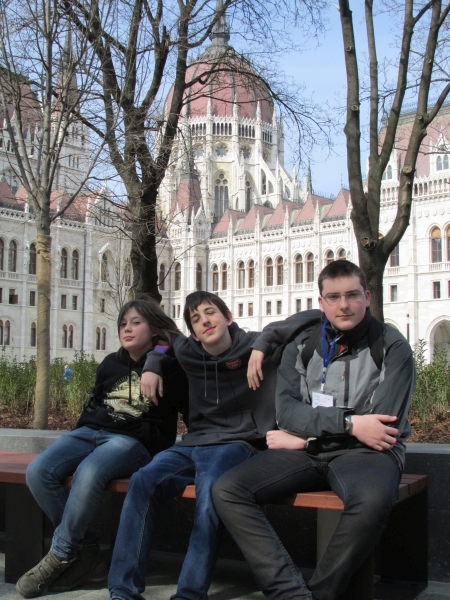 For me, the Comenius project has brought the experience to live with other family, in another country. I understood with this family very well, since they saw me as a family member, not as a guest. The family was very rich: they gave me gifts, they helped when I needed and they gave me all I wanted. In this project we had some trips in Poland. First it was Auschwitz; I was very excited by everything I saw there, because as the guide said “it was a hell made by humans for humans”. The second trip was in Krakow, a city full of history. There I saw the Wawel castle, a big and beautiful building, full of valuable things inside. After we visited the castle, were in the city center, where we visited the famous Saint Mary church, after we had some free time to walk about the city. The last day, we had activities at school for example karaoke, grills, and a little party…memories which I will never forget. Hello. I am Halil Berk. First of all, I want to say that the comenius Project outlined a background for my future plans.It helped me gain self-confidence and ability to communicate well with the people around me. The most interesting thing in Poland , to me, was the respect of people to each in traffic,bothh the drivers and the pedestrians. I have been to a church for the first time in my life. I enjoyed the social life in Zabrze.because people are very nice and friendly.I wish I will g oto Poland again. Thanks for everything. Hello. I am Şule. I didn’t feel like a stranger when I first arrived in Zabrze. My friends were very friendly. 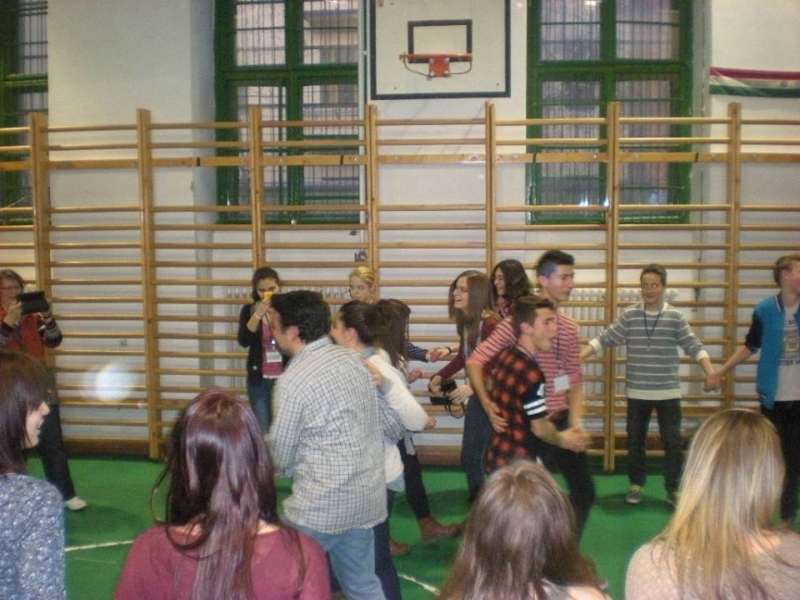 I had fun during the activities – especially the “acting activity” .The Polish students were very nice and friendly. The energy of the friends from other partner countries was very high, too. 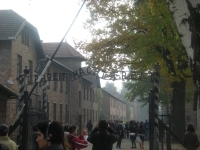 I think I was very lucky to see the Concentration Camps in Auschwitz. This a very important place-very impressive. I tried to learn some Polish every day but it is very difficult for me. However I learned how to say “ good morning” –“dzien dobry” and “good night”-“dobronoc”.In Zabrze people g oto bed early and get up early as well.While walking I saw that there were not so many traffic lights.The drivers were very polite which I liked very much. I am pleased to see Poland. I miss my friends very much. Hello. My name is Abdullah. I had a lot of fun in Poland. The first thing I noticed was the zebra crossings. It was very nice to meet new friends of so many different cultures. My host Patryk was very friendly and sincere. The most impressing thing for me was the vist to the Concentration Camps in Auschwitz.It was very sad. The activities at school were very good.I learned how to say “good morning” in Polish. I liked Zabrze and my friends. I would like to join the next meetings. It was a fantastic experience from the first until the last day, the biggest thing that struck me was the welcome of the host family, a loving family, nice, sweet, a model family. As for me I didn’t feel the nostalgia of being away from home, because they welcomed me and the two other Italian students like their children. 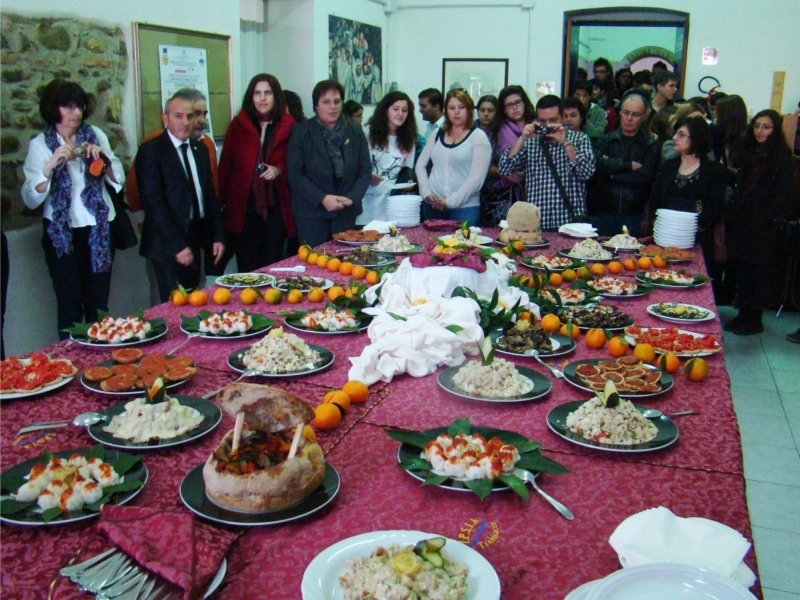 We had the opportunity to taste the typical dishes of their land, they did not miss anything: we visited interesting places from the point of view of landscape and cultural heritage. We also went to play bowling, to the miniature Europe and to the biggest shopping center that is called "Europe center." As for the planned activities what struck me the most it was the visit to the concentration camp Auschwitz - Birkenau, and I realized during and after the visit that the man-made hell on earth. Not to mention the new friends we made with the kids of the other partner schools. We established a relationship of beautiful and lasting relationship with the family, as a matter of fact we already we meet on face book, and I hope to meet them in my country. The experience of traveling to Poland was one of the trips that most of all marked me from all points of view. It made me grow up and believe in myself. It made me realize that it is nice to meet new people and try new experiences , communicating with another language (English) and live in a diverse community, with different customs and habits. I explored A “NEW "WORLD" of which I was not aware of and what it will be forever in my memory is the fact that I met wonderful people. I thank you very much my hosting family for making me feel at home and spoiled me and Marco and Sara. I want to thank also everybody who made who gave me this chance to come to Poland, in Zabrze. I was very happy to be in Poland with this project. I liked all the activities we made in Zabre and I visited beautiful places. I made new friends at the meeting and I liked it much. What was wonderful was the hosting family that took good care of me , very attentive , adorable. The children were very nice and we had nice time together. It was a very nice time, we did many things together. The family took us , Marco and also Soumia, to visit many places , we did many things together, they are a special family. They made me feel at home. 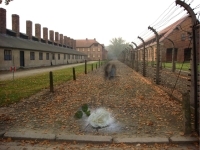 I liked very much the visit to Auschwitz. It’ terrible what men can do to other men!!! I was sad because there was sufferings of million people in that place. The visit is very educational because we are young and never again this has to happen ! It was a wonderful experience. I know more about Polish culture and made more friends. We got many-many presents too. I hope I can host them one day, maybe soon! I am glad that we have managed to have fun and study at the same time. I learnt some words in other languages, for example ’squirrel’ and ’heavy boots’ in Polish. When we were ’working’ on the project I was amazed that everybody was singing together without shyness or hostility, we helped each other. It was good that we could taste traditional dishes, I think it’s an important part of getting know about the culture of a country. I am grateful to this project and this journey: I made lot of friends from foreign countries! First of all, thank you for this week that I could spend in Poland with a friendly family in Zabrze. When we arrived to the train station, the host families were there. They were waiting for me and Csongor. We lived in a very big house with the hosting family and Lucas (Greek man). The family were very helpful, and they expected us with a traditional polish food. In the first work day we presented the films with karaoke. In the afternoon we went to play bowl and pool. 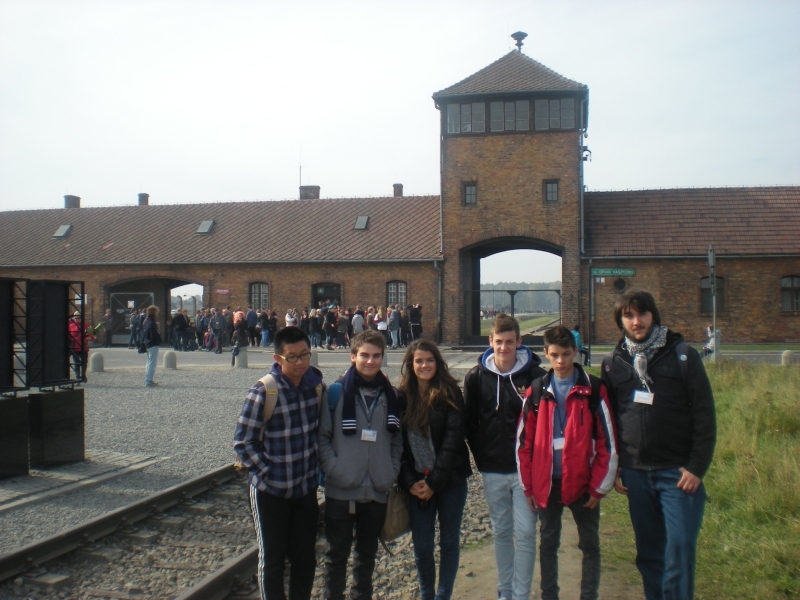 Next day, we visited Auschwitz, and Birkenau concentration camps. Third day we were in Krakow, we could buy souvenirs and take pictures. The last work day we were in the school, and we saw some films, and we had to do a poster of the film. 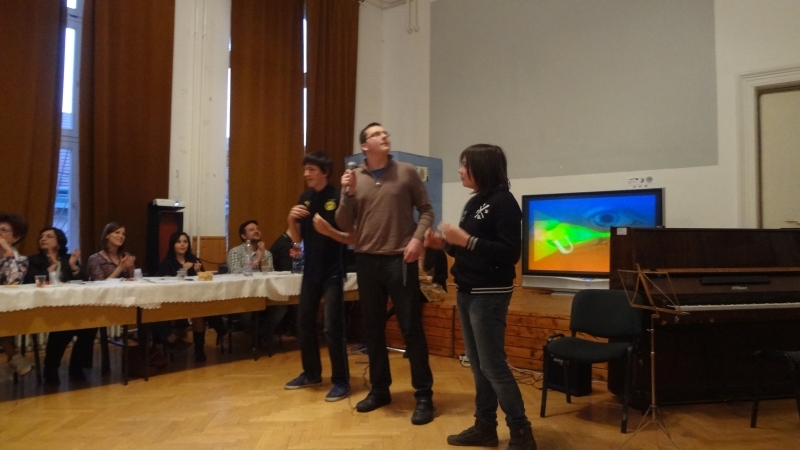 In the afternoon, we started the karaoke part of the project and after that, we could eat barbecued sausages. At early night we had a party, from our music. In the last hour everybody started to say goodbye and some people cried about it. We tasted the Polish beer, chocolate and bubble tee. The end of trip, we travelled about 11 hours in a train, but at least we had fun. I really liked the program, because making new friends and exploring new countries will be useful in the future. We had a lot of fun and we learned some words/sentences in a different language and also we learned a new culture. At the first day the Hungarian squad arrived to Poland after 8 hours of journey by train. Michael and his family waited for us in the platform. They took me and Ádám to their house it was really great. After midnight a Greek man, Lukas arrived. 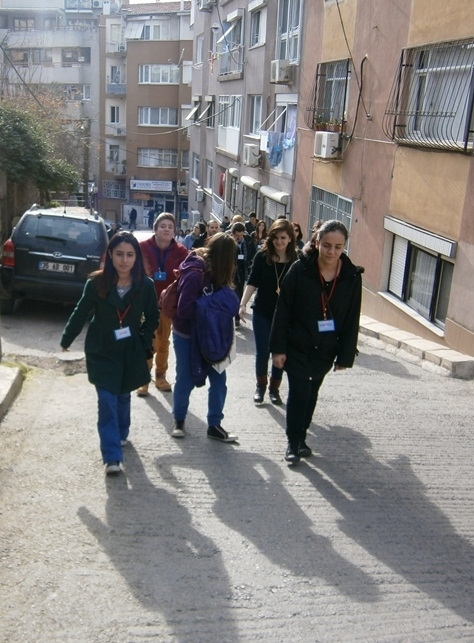 In the first day we went to the school .The school was clean and colorful. The teams presented the films and they sang a song from it. We got the ‘Notting Hill’ for film and the song was ‘Aint no sunshine’. After that the teachers did a presentation from Auschwitz .Then we went home and we just had fun. 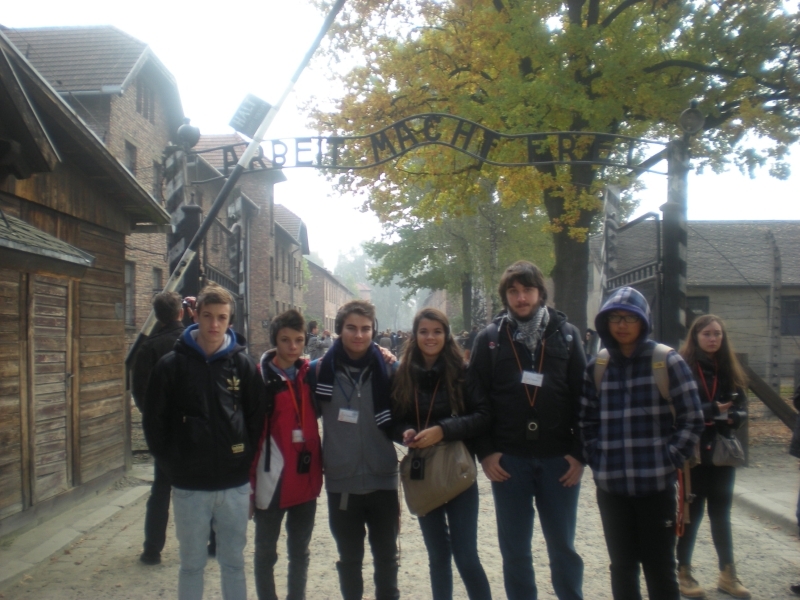 On the second day we went to Auschwitz. It was shocking I just saw the “prisoners” alive near me it was horrible. I don’t want to say more about it. When we arrived we went to a shopping mall and then Michael’s mother took us home. At home we just chilled like at night. On the third day we went to Kraków. It’s a beautiful city with many sights. After that we went to home and we listened to music. Last day we were in the school too. We watched some films, mine was the ‘Dirty Dancing’. After that a women arrived and she showed some acting things. Then we sang some songs from the amazing Rolling Stones and a man made barbecue and some of the students threw a party, it was really great. Next day we left Poland L.But we spent a great time together. I hope we’ll meet again. It was a fantastic experience to meet guys from other countries. I had good time at the hosting family, friendly people, nice, in a nutshell, fantastic! I made new friends with the boys and girls of other countries even though at first I was ashamed because I am very shy. The activities that I enjoyed very much were the workshops, karaoke, concert, organized by the Spanish guys. I loved the monuments, Montserrat, Sagrada Familia and the historic center of Barcelona. I hope to have another chance like this! The Barcelona trip was a great experience for me. I had never been abroad before this trip so it was a big deal to me. I made new friends , I had a lot of fun with them , I learnt a new culture , it wasn't so different from ours , but it was worth it though. Now I have more ideas about the European lifestyle , so I can see more similarities between yours and ours. Anyway , I hope I will have a chance to join another programme like this. Or maybe this one once more , who knows. 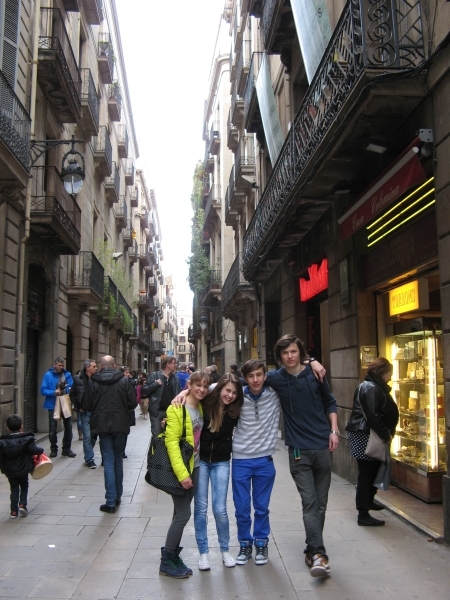 I miss Barcelona and my friends from Comenius ! Barcelona was a nice experience for me. It was not my first time there but i couldn't see all places the first time so it was really beautiful. I had a lot of fun with my friends. I made a lot of new friends, i learnt more about other cultures and spanish food. 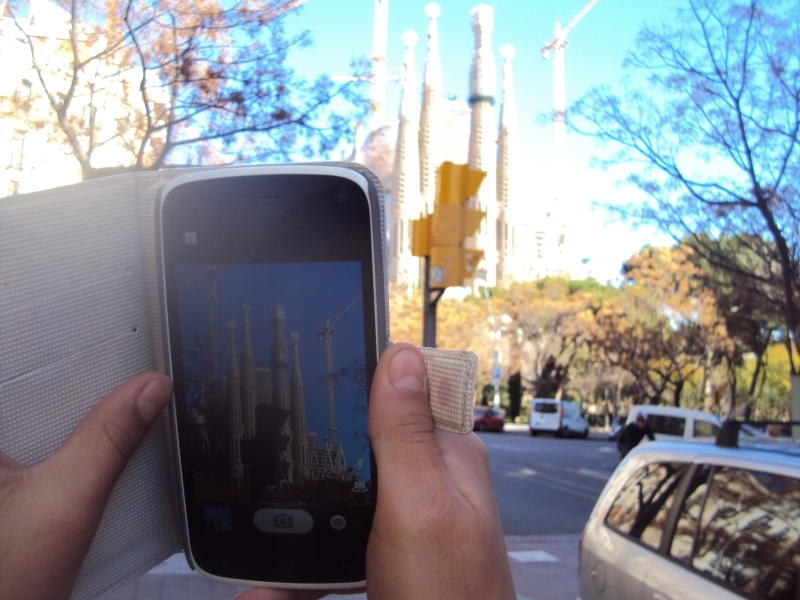 When we went to "Sagrada Familia" i was really amazed by this building because it's really beautiful and really big. Inside the building is really wonderful. The different colours on the windows are fascinating ! Parc Guell is a really nice place. We couldn't see everything but the part we saw was really nice too. The school "Escola Turbula" is much bigger then our school "Bayrakli Lisesi" :))))))) It has a big playground with 2 small football fields. It also has a small swimming pool and a garage ! I will miss those days...but i'm sure that we will meet somewhere again ! In the end I want to thank my teachers for everything, for taking me to Barcelona and making everything possible. OHH Barselona, The city was maravillo so.I love Catalunia's People, they were very entertaining and amiable.I had so much fun there.Our host was hospitable.And David's parents too, They were very nice people.It was one of the most enjoyable time of my life.Eva,Laura,David,İvan,Albert,Eloi,Marc and the other Comenius friends I met them thanks to Comenius so Thank you so much Comenius.I will never forget Barselona and lively Catalunia's people. Perfect spent 5 days in Barcelona! First of all, I want to thank Laura Monata and her family. Everyday was fun; activities, games, dances...They were all awesome. 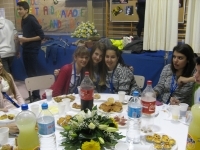 I made very nice friends through comenius. The trip was unforgettable. Thank you so much everyone. I’ll miss you. A few days ago, I had the greatest experience in my whole life. I was very impressed with Barcelona and especially with Gaudi’s buildings. Sagrada Familia is one of the most interesting buildings I’ve ever visited. In addition, all the students were very friendly and we had a great time together. I realized that kids of my age have many things in common no matter where we come from! 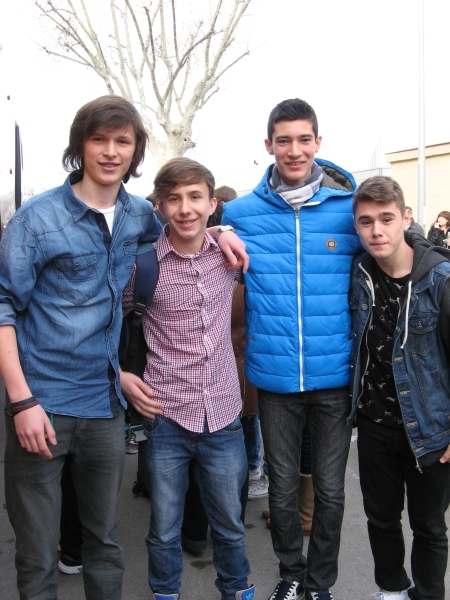 Finally, Comenius gave us the opportunity to meet people from Europe and make friendships with them! In Barcelona I pass mucho good. Spanish people are very good. I saw many sights like Sagrada Familia. 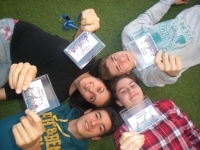 Comenius gave us the oppurtity to meet people from Europe and make friendships with them [copy of Vasilianna]. I love Barcelona and I want to go again. Meeting in Spain was a great experience for me. I learned lots of new things about Europe composers. I really liked trips to Park Guell and to Montserrat. I enjoyed a concert organized by the Spanish Team. Rut’s family were fantastic. I really miss them. In Barcelona I met a lot of fantastic people. I miss all Catalan Team and the most Ivan, Rut, Eloi, David and Kevin. We had a lot of fun together. 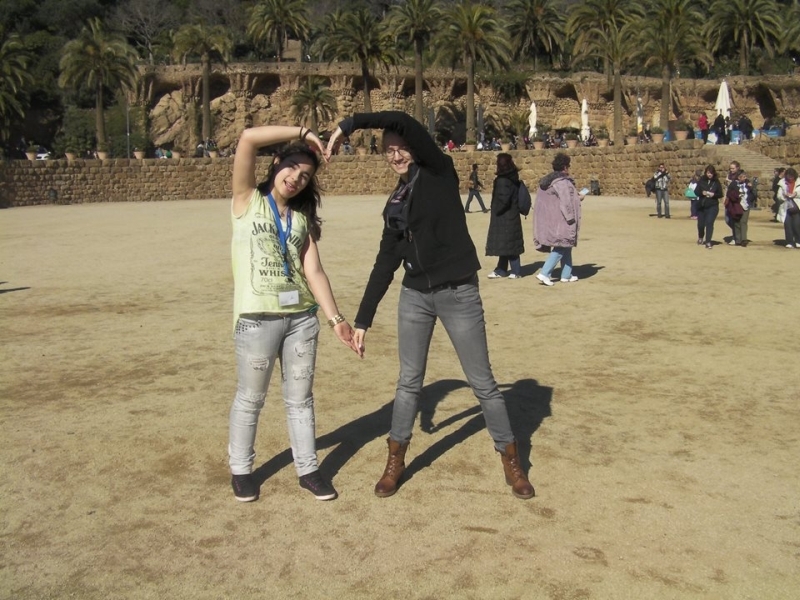 In summer I want to go to Barcelona for the second time and meet all my Spanish friends again. Barcelona was a nice experience for me. It was my first time. I have made a lot of friends and I have visited a lot of fantastic places. All of my old and new friends taught me something about Catalan tradition. I will always remember this time. 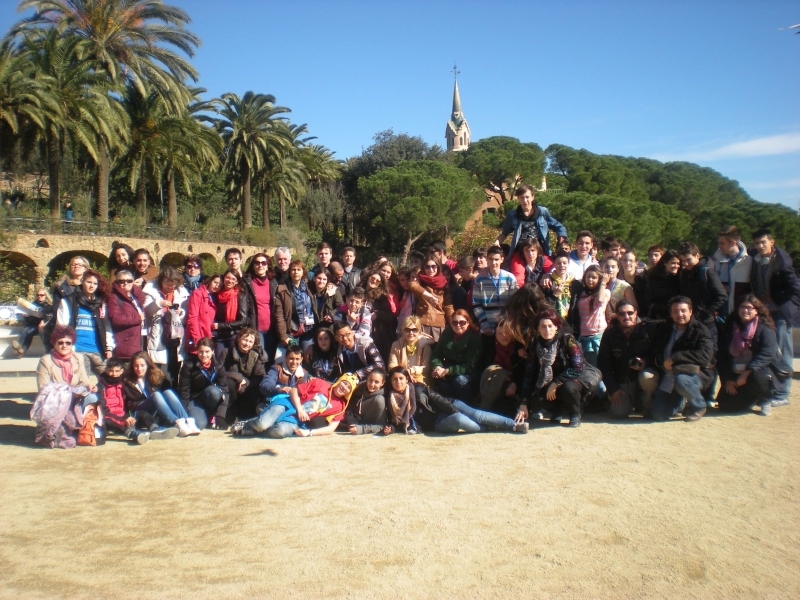 I miss Barcelona and my Comenius family. I’m sure that I will come back to Barcelona one day. It was very good and interesting! I have lots of new friends from all the countries :) I will never forget this week... I ate new foods, like black rice, squid, shell, crayfish... It was good, but enough for me :DI enjoyed it, but it was too short... 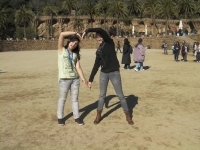 I hope I will go to Barcelona again! I’m really glad because I met a lot of kind and friendly guys and teachers. 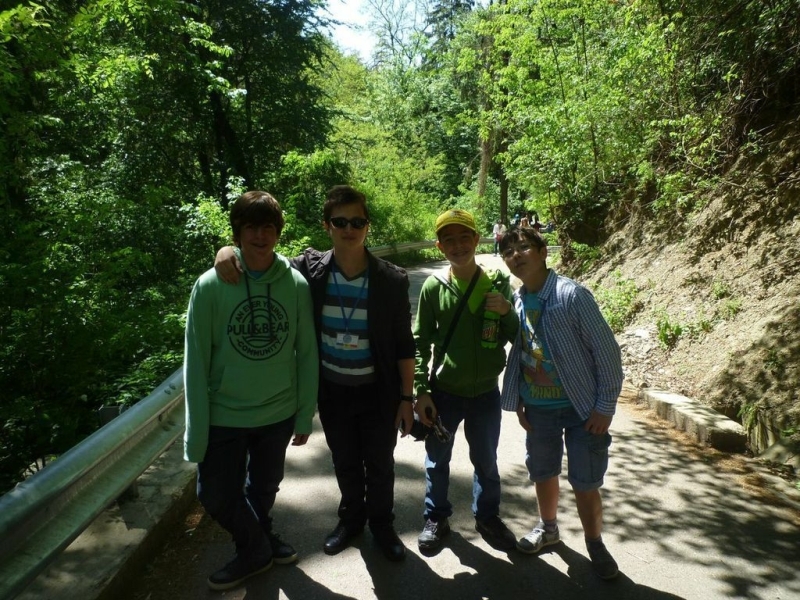 The programmes were cool because when we walked a lot we talked with each other. And we knew the others. I hope I will go back in the summer. I love singing and dancing and we did these things all day! *-* The family was very friendly to me. Every night we were at someone’s house with the others and ate some food and kidding. We saw buildings of Gaudi and they were so beautiful. I learned a lot of Spanish words. I think it was the best week of my life. Thanks, Comenius because I have a lot of beautiful and funny memories and a good experience. What can I say .... this trip to Spain was awesome.!!! As soon as we arrived, Bruno and Anna welcomed us heartedly at their school where everybody hugged us. After I met Marc’s family we left for a stroll in this extraordinary city. The following days we had the chance to visit more of the famous sights. I cannot find the proper words to describe the people of Catalunia - generous, friendly and full of life. Our hosts were the best and we feel so close to our Spanish partners. I have also had the opportunity to improve my knowledge of Spanish and English . It was an amazing experience and a part of me was left behind in Catalunia as they were the greatest hosts ever. VISCA CATALUNIA !!! What I have seen and experienced there in Barcelona cannot be put into words.Every monument or building that we visited , together with the legends attached to their history made my heart be filled with joy and emotion. I still miss strolling along those long , vivid streets , full of people, where the colourful buildings rise like sunshines. When we left , I had the impression of leaving my second native town- I am not the only one who had this feeling! I experienced unforgettable moments, I felt like at home, where my friends and family are by my side. It is important that we could create so strong friendships,and last but not least, strong family bonds. 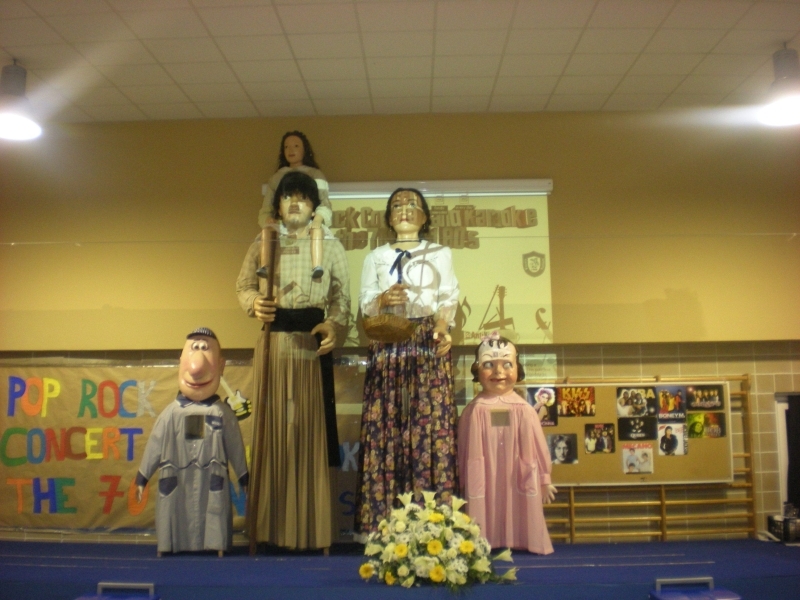 I cannot explain how open-hearted are the Catalans and how careful they are towards their Comenius family members. So, don’t worry, we will certainly meet again , after years, and we will be able to tell our beautiful funny stories again. In Spain I have experienced great adventures. I have met people from so many countries. I visited Escola Turbola, a Spanish school, with many classes, playgrounds and a swimming pool. The students are happy and friendly. We strolled in Barcelona. We visited museums and Sagrada Familia, Gruell park , Montjuic gardens and tramped our feet in the Mediterranean Sea at sunset. I found difficult to come back to Romania!! There , in Barcelona , the people are open-hearted and kind, the streets are clean, no stray dogs, and the students are so open-minded-they are so helpful. I love Barcelona and its people. I really believe that Romania will change, that the Romanians will change. I want a better country for me, I want better people, like those living in Spain or in the other European countries. My trip to Spain was the best experience of my life. I had the opportunity to share ideas, to discover traditions and , the most important , to find new friends. Barcelona is a wonderful city that I would like to visit again. I was greatly impressed by Gaudi’s architectural style, by Sagrada Familia or The Palau de la Musica-where I would like to perform. I had a very good relationship with my host family and with the other students in the project, and I try to keep in touch with them . 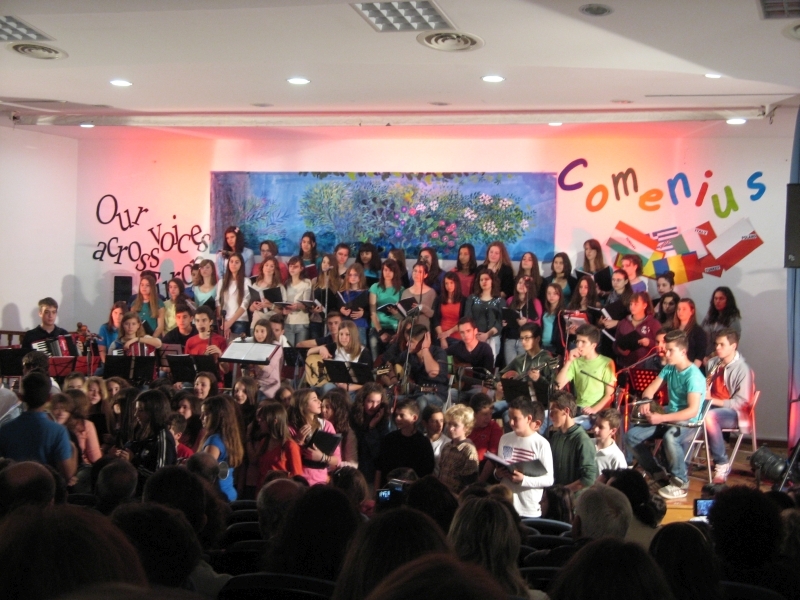 I had a great opportunity to become a member of the Comenius Family. Barcelona is a beautiful city.I liked it a lot and I was very happy that I had the opportunity to visit this place.The people are very nice and I stayed with a family where I experienced the hospitality of the Catalonian people .I would go again anytime.I made a lot of friends and I learned about the Spanish history.I would like to thank all the members who participated in the project Our Voices Across Europe for the chance they give us to visit one of the most beautiful places I have ever seen and also to stay with a Catalonian family to get to know better the life style of this city.I loved it,and I made a lot of friends and I gathered a lot of good memories. This time in Budapest was amazing. 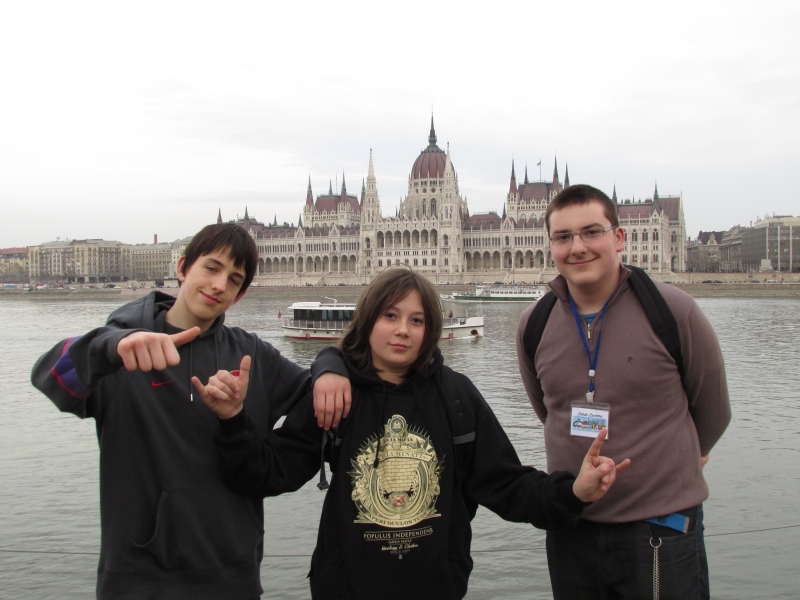 I had a great time with my Comenius friends visiting lots of landmarks like the Parliament, the Chain Bridge, ... I could see Budapest at night and it was awesome!! The best thing that I will never forget was the people I met and became my friends. 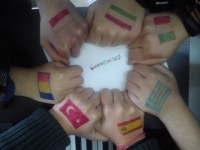 I am sure that Comenius is one of the best things in my life!! 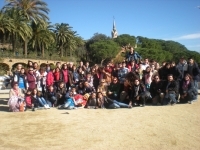 Now, I am sad because I miss all the Comenius people but I am sure that one day we will be together. 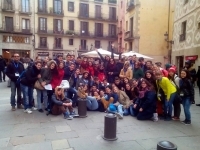 I love Comenius. I love Budapest. This trip was an unforgettable experience for me. I met a lot of different people and we had a great time together. Budapest is amazing. The landmarks are wonderful, like the Parliament, the Chain Bridge... My favourite activity was when we went down the Danube on a cruise boat. It was great!!!! and specially because it was dark and we could see the lights on. I already miss all the people I met. I would like to thank the Hungarian family who put me up for their warm hospitality. I really enjoyed this trip to Budapest. 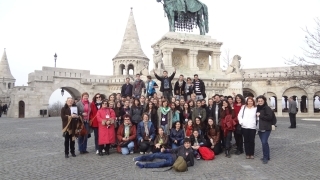 It was great to meet our Hungarian friends and our Comenius mates. I made many good friends like Zozan, Vera, Petra Jurkinya, Berk, Michał... And of course I loved meeting again the friends I made in Barcelona like Barbi, Anna Szabó, Péter and Csilla! The Hungarian team was really nice and I even found some “twin souls”!! The city was gorgeous and full of wonderful buildings. In my opinion, Wednesday was the best day as we visited the Parliament and the zoo. I’m sure that we will all meet again. I love you all, my Comenius family!!!! It's the first time I travel abroad by plane, thanks to Budapest project meeting. Before I was scared just thinking of taking the plane but now I have overcome this fear for the plane thanks to my teachers and my friend Luca. The most beautiful thing is that I have made friends right away and got to know other European students. I really enjoyed the hosting family, they were very welcoming, they treated me like a daughter. 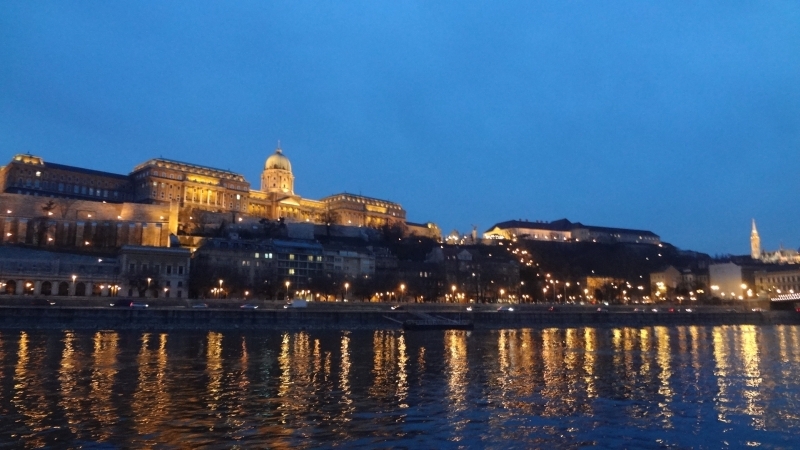 In Budapest we visited the Parliament, the Castle, the Church and museums that were very interesting. We took a ride on the river. Budapest is spectacular especially at night. The activities that I liked most was when they taught us their dance, and when at a workshop we were taught to make a small leather bag. Their dishes were excellent. Apart from the activities we did with the teachers, in the evening we students met and went dancing, shopping and eating out, in a few words I enjoyed it very much. This experience has helped me to meet new friends, language, culture, very different from mine. I hope to make another experience like this. Hi ! 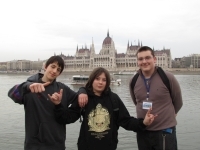 Budapest trip was my second Comenius visit. I had a great time in this city. I made a lot of friends and we are still in touch  My host Petra and her family were all very helpful and kind. I enjoyed every moment of the program ! Dancing, singing ,exploring the city, museum,castle ,zoo and river cruise…… I can still remember the wonderful memories I had with the Comenius friends. I think I will never forget these fantastic moments in my life and most probably will visit Budapest very soon.Thanks for everything again and again . My stay in Greece was beautiful. It was an extraordinary, beautiful experience I will never forget. We travelled by ship and everything went for the best. When I arrived in Arta, the Greek partners welcoming was just beautiful, the hosting family where I stayed, treated me like a king. I met the other students in school who welcomed me and treated me very well. I made friends right away and I became one of the most famous in the meeting thanks to the Romanian song "Trandafir de la Moldova", of which I made it a real smash. 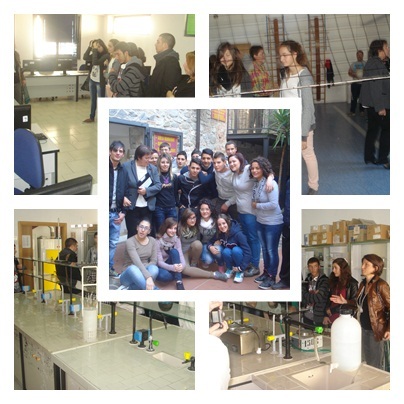 We did so many funny and educational activities and I think I was very lucky I had this opportunity. When we had to go back to Italy I was a little sad because I really felt great and made very good relationships with all students. I hope to be back in Arta and meet again my friends and also do other experiences like this. I really liked this meeting. I was hosted by a nice, thoughtful family, I felt good with all the family. I liked all the program activities, the town is rich of historical places. Of all the activities I liked the best , the farewell party and I liked to sing the Romanian song “Trandafir de la Moldava”. I liked to be with my friends and go around the town, when we stayed at home I liked to play music with Alex, a very good guitarist. The food were very good and I liked Gyros very much. I hope to see all my friends again and to be in another project altogether. "The trip to Greece has been a great opportunity for me to learn very important things. First of all, I would like to say that I learnt the typical dances, instruments, ... And most importantly I learnt a lot about the Greek culture. I also learnt to respect people and not to judge people from their appearance. The most beautiful thing that we did was the concerts because we could learn songs from all the Comenis countries taking part in our project. I really liked Arta as it is a little town where everyone knows each other and it is such a peaceful place. I loved Parga, the colour of the water, the beaches, the fortress up the mountain, the streets, ..."
The trip to Greece was awesome. I met new people from different countries and I enjoyed making new friends. I loved the monuments in Greece and what I enjoyed the most was singing songs from all the different countries that are part of our Comenius project. My host family was great and very welcoming. I will never forget the trip to Greece. I only have good feelings about Arta and its people. I will always remember this trip with a big smile. I never thought that I would miss all the people so much. This trip has only happiness, good moments, good feelings and smiles. This week was AMAZING!! I’m looking forward to seeing you again in the future. Good luck!! In my opinion Greece is the best trip I have ever made in my life. I will never forget all the different and unforgettable moments that we lived in this country. There are lots of friendly people that come to my mind when the word Greece is pronounced. I think about people living together as a big family. Thank you!! The trip was wonderful because I had been looking forward to this week for two years and at last it arrived. I will never forget it. Greece was my dream and my dream came true. I remember Christina. I miss her so much and the other girls, too. My host family was fantastic. 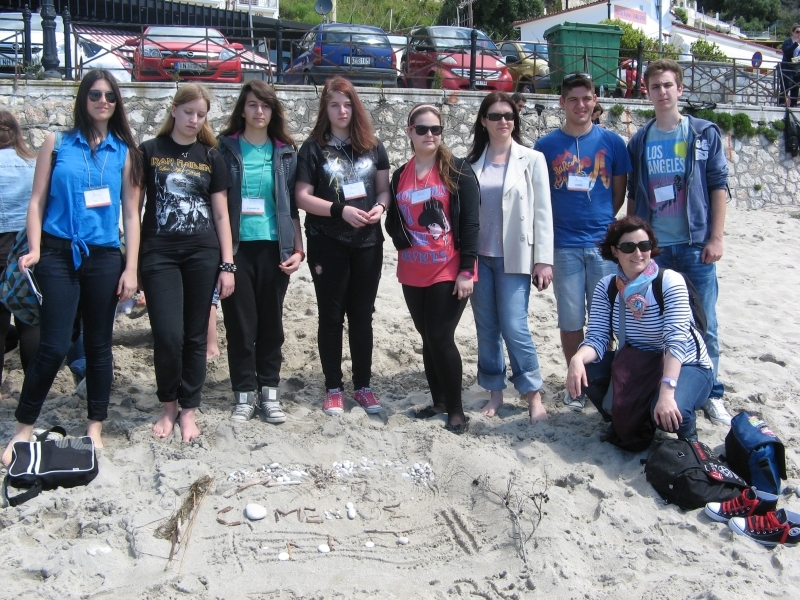 We went to Parga, an amazing seaside village, and there we made Land Art on the beach. We also went to the waterlands, which were very nice. 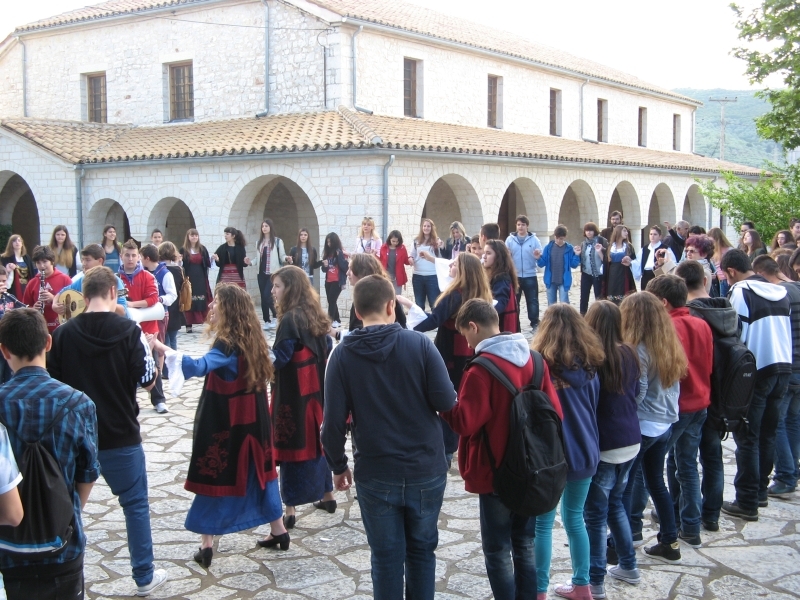 This last trip was amazing and it was great to finish this great Comenius project in Greece. The friends I made are forever and I am really happy to have been in this country. I will never forget Greece. When I think about Greece, just good moments and good feelings come to my mind. This experience has been my best experience ever because I met new people and I had the chance to meet some of the friends that came to the meeting in Barcelona. My host family was very welcoming and nice. In a nutshell, this trip was AMAZING!!! Greece is a wonderful place. I especially liked Parga and Arta's scene so much. I liked Greek salad and cheese. They were very delicious. I loved my Host, Aris so much. I got on well with his family. Everybody was very hospitable there and they were very caring about me. I felt myself home :). I had really good time here. I hope I will go there again. It was the best week of my life. Greece was a wonderful place , when I was there I thought that I was living in a mythological part of the world , The most important thing that I learnt in Greece , is " speaking different languages doesn't make us different , the difference between us is only in our hands, not in our languages " I wish I can get a chance to come to Greece again, I love you the beautiful people of Greece, sons and daughters of Aphrodite. Greece meeting was my first time travelling abroad and I enjoyed it a lot. 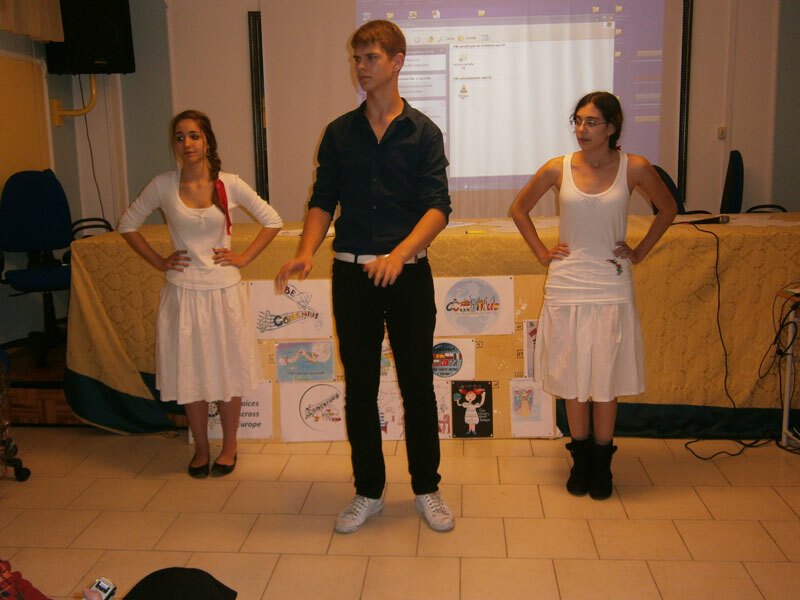 I think Comenius Project contributed my thoughts and personality a lot. . I learned about new cultures and had many new friends. I loved Greece ,especially Parga ! Greek people are very hospitable and tolerant. I also love the Greek food, too. A great Greek salad and Chicken souvlaki! Also I learned some Greek. 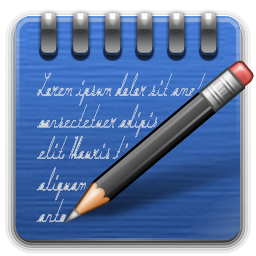 ‘Kalimera’ is ‘Günaydın’ (Good Morning), ‘Kalis pera’ is ‘iyi akşamlar’ (Good Evening) and ‘Efaristo’ is ‘teşekkür ederim’ (thank you). I would like to go to Greece in the future for sure :). Greece is a very beautiful country. We had chance to see Acropolis. That was great! Our taste of food is very similar.I think that’s because we are both Mediterranean and neighbors. I loved Arta. It’s a cosy green town and the people are very hospitable. As I am interested in music I liked the school as well. I couldn’t imagine how beautiful a country was Greece and how hospitable are the Greek people before I went to Greece. But when we got there I realised that we were very similar. I had great time there. I made a lot of good friends whom I won’t forget. I have already missed them and I believe that we will meet each other sometime in the future. They all helped me feel confident and easy. 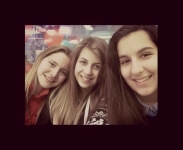 I really love them :) Now my biggest dream is to go to Greece again. Hello. My name is Matylda. I'd like to tell you about time I spent in Greece. At first I was very scared about going there – I was scared that I couldn't say anything in English or that nobody would understand me. But now after that amazing week, I think it was the most exciting time in my life. I met great people and I was sad that it was only one week. I saw lots of new places and monuments and I also tried a lot of Greek food. What I liked the most was dancing Greek dances. I hope I will join another project like that in the future. Hi! I am Martyna. And I've just come back from Comenius meeting in Greece. We saw lots of monuments e.g. Church of Parigiritissa. It was a wonderful place and definitely different from Poland. 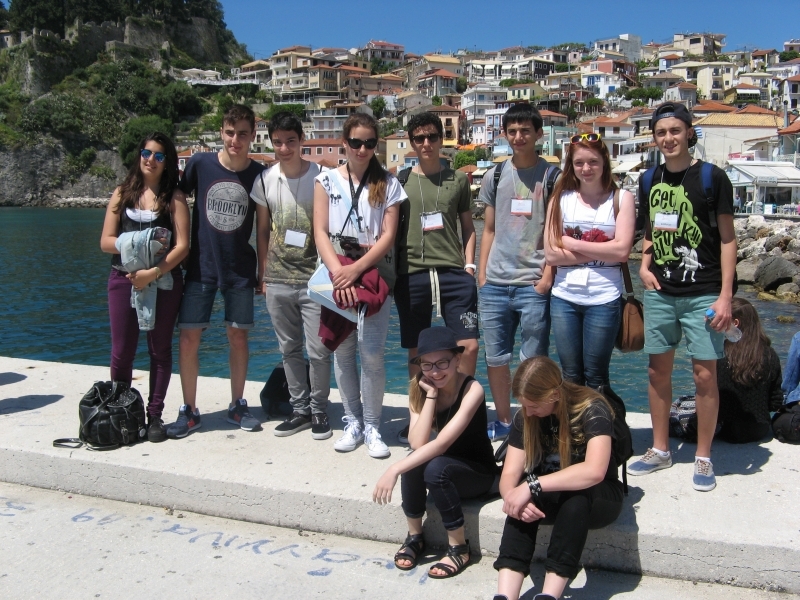 We visited Parga – a very beautiful place and I really want to go there once again. I met a lot of fantastic people who made this adventure awesome. They taught me some words in other languages. Every day I tried delicious food. I think it was one of the best weeks in my life. Thank you everyone! P.S. Hungarian team and Rut – YOU ARE THE BEST! Hi! I'm Aga. I was on a meeting in Greece between the 4th and 9th May 2014. It was a wonderful week. I made lots of new friends and I went to lots of interesting places. I saw lots of monuments in Arta and its surroundings. I learnt lots of new words in English, Spanish, Greek, Romanian and Hungarian. I had a good time with my new friends and I met an awesome Hungarian team. I had an opportunity to try delicious Greek food and I learnt how to dance traditional Greek dances. I learnt new songs in seven languages and I think it was great. 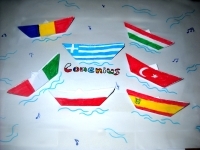 I love Comenius because of everything I could take part in. In Greece we met a lot of new friends, we could learn something about Greek music, tradition and a lot more. It was amazing to stay with Greek family and see how they live, eat and spend time together. This was unforgettable experience. All the people were really friendly and they will definitely stay in my memory forever. The meeting in Greece was very-very good. Athens and Arta are beautiful! I saw a lot of beautiful places. I met a lot of new people and they became my friends. We were laughing all day. That was amazing. I miss Arta and all of my new friends! This was a very special week in Arta. We have a lot of wonderful new friends and we did a lot of interesting and good things all together. We danced together, sang together, and the most important we were all together! Thank you for this amazing week! In Greece we had a great time. We sang a lot and we ate a lot of delicious food. But the best was the sea and the beautiful places. We had the chance to get to know Greece better. Against all these wonderful things my host was not too nice so it was a bit disappointing to me. OI can't forget this week that I could spend in Greece! 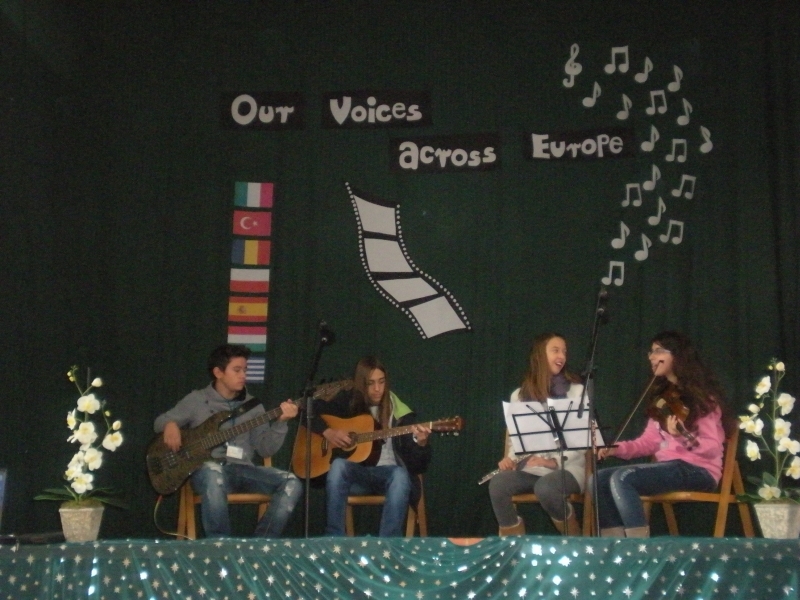 I loved every moment when we practised for the Comenius concert. I met with a lot of lovely people from each country, and I met with some old friends from the Romanian meeting. I'm lucky because I can say I have a new family that I got with this project. For me this project was a unique experience. In Greece I interacted with teenagers who came from different cultures and with different mentalities and characters. Due to this project I managed to know me better and I have developed my communication skills. I liked the fact that I was accepted by the "group" even though our ages were not close. The host family has behaved very nicely to me and we understood each other; I felt at home. I participated in a lot of a interesting and funny activities. So I had the opportunity to meet great people and I visited both interesting and spectacular places. I would love to take part in a similar project in the near future. I went to Greece, to a clean and quiet town, named Arta. The people were very kind and hospitable, but what I loved most, was the fact that the youth knew how to integrate us, the little ones, in their group, without making any differences. I visited several places, but I especially remember the sunny beach at Parga and the Arta bridge.The food was also very good. 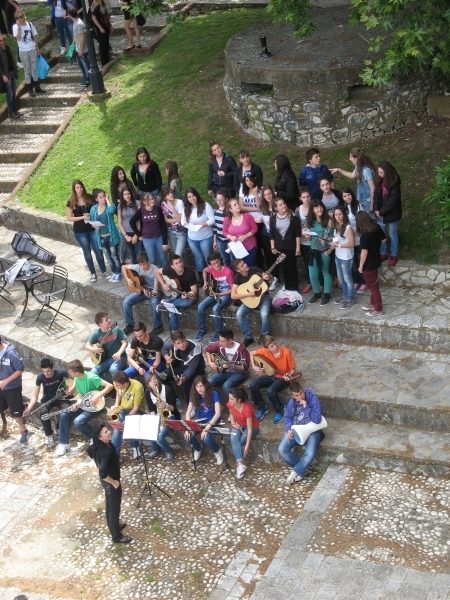 The concerts from Parga, the church, the bridge, the museum were unforgetable too. I met very nice and friendly people. I will never forget this wonderful experience! A project in which you come to socialize with so many people from so many countries!!! Thanks to the Comenius family I have learned a lot of things: team work, how to fit in a group of people from different countries, a little bit of history about the place I've visited. My host, Alexandra,an amazing 14 year old girl, she was funny; smart; she had a fantastic voice and she also knows how to play many instruments. I felt amazing while I was staying there with her family! 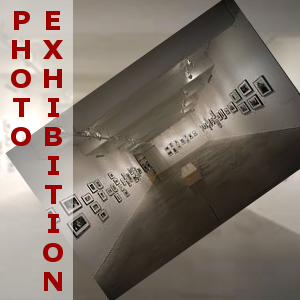 This project was a wonderful experience in which I met so many new people with whom I'd like to keep in touch. 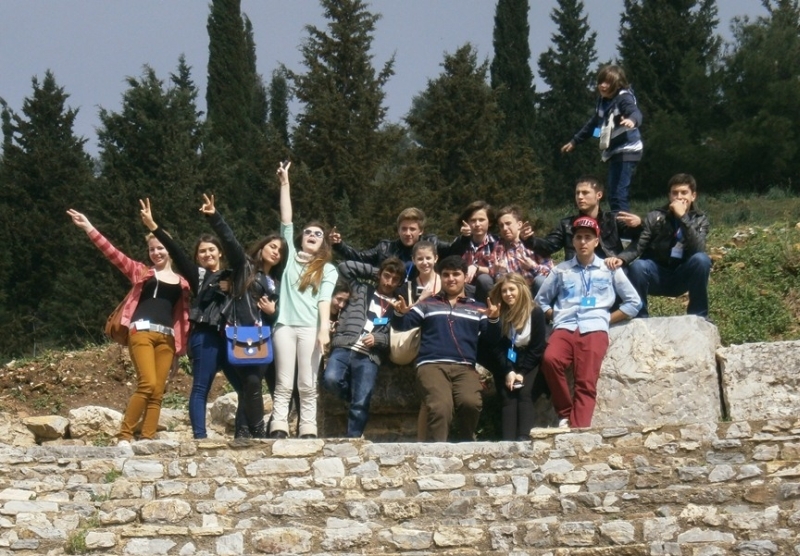 COMENIUS has meant for me a life experience, an experience which I will never forget. This project helped me to learn more English, to discover myself, to learn to work in a team and to be more independent. The mobility to Greece was very beautiful, we had fun and we learned new things which will help us in the future. I hope that one day we will see each other again! 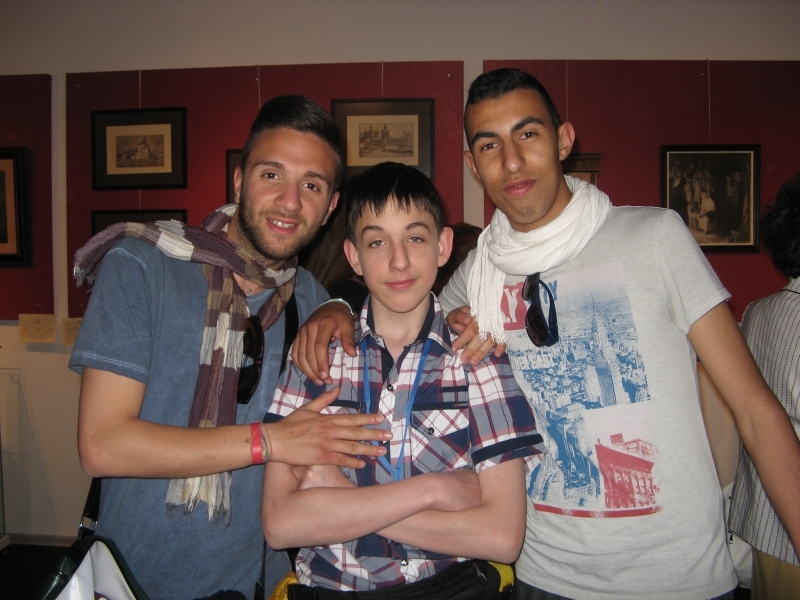 The Comenius experience is the experience I will never forget! I have made the most beautiful and special friends, I have visited amazing places in Greece. This project helped me discover my better self, it helped me develop my musical abilities, to develop my writing, reading and speaking skills in English. I am extremely happy I had the chance to get involved in such a partnership!! For a week I lived with the great Fraud family- a wonderful and hospitable one, who gave me the opportunity to discover new things about the art of cooking, about the Greek traditions, music, and culture!!! I thank them all for all the things that they taught me and for their kindness and care. I wish I could see them all again and have the same fun and good time as in Greece. 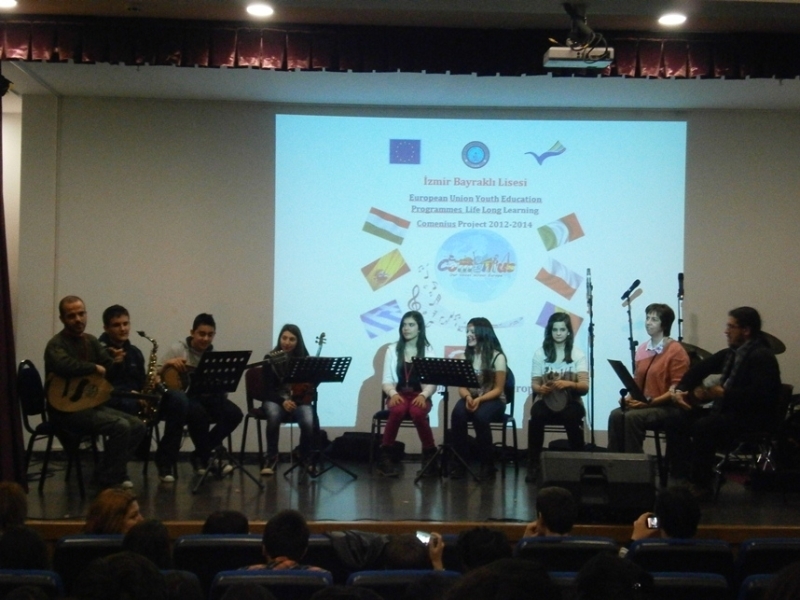 Each stanza of the Comenius Anthem has been written by a country and all the stanzas together were gathered in Turkey and then all the delegations together decided on the refrain. The last word of the refrain in always the same in the original language of each country. The music score of the Comenius Anthem was composed by the Greek team. 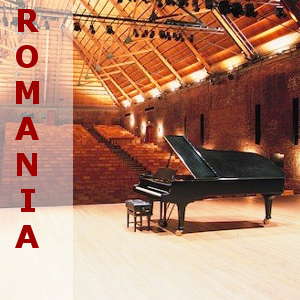 ROMANIA Rock music appeared in Romania at the beginning of the 60’s.